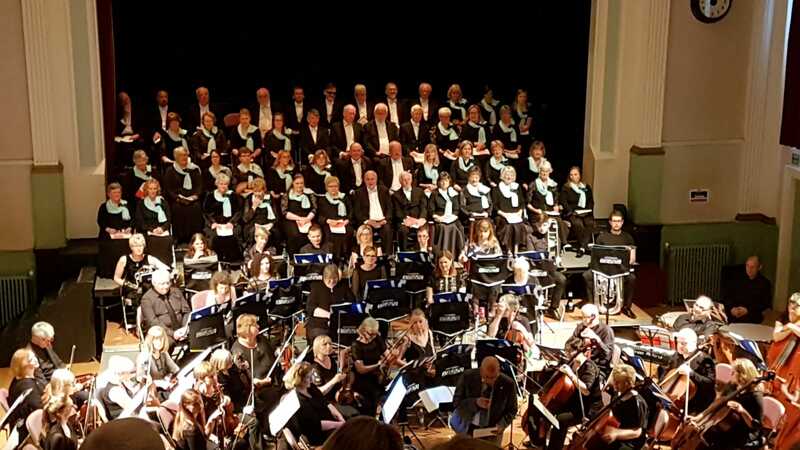 It was a full house last Saturday night at Inverurie Town Hall for “The Creation” by Josef Haydn, performed by Inverurie Choral Society and Inverurie Orchestra. 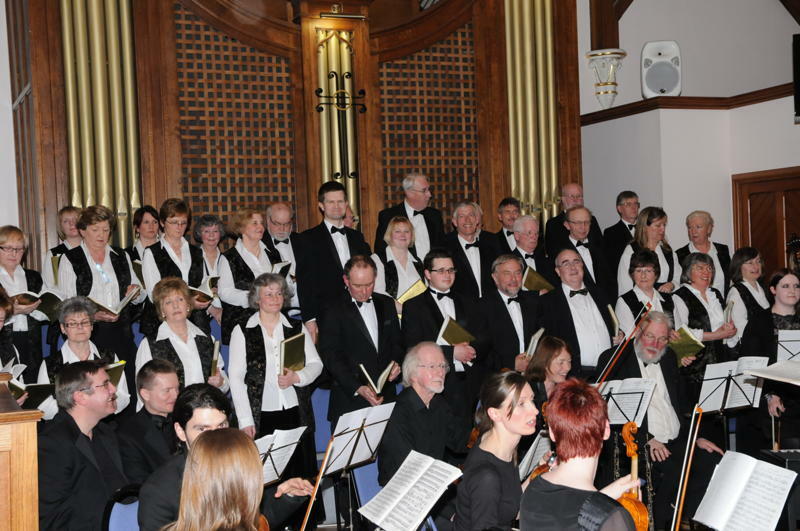 This concert marked a joint anniversary of both organisations, with the choral society celebrating its twentieth and the orchestra its tenth. The concert was introduced by George Ross, of J.G.Ross Bakers, the major sponsor for the event and one of the many local business people supporting this concert. Mr. Ross informed the audience that that this was the largest orchestra and chorus ever to perform in Inverurie Town Hall. Nearly one hundred performers led by Dr Paul Tierney, the musical director and conductor of the orchestra played to three hundred and fifty concertgoers. 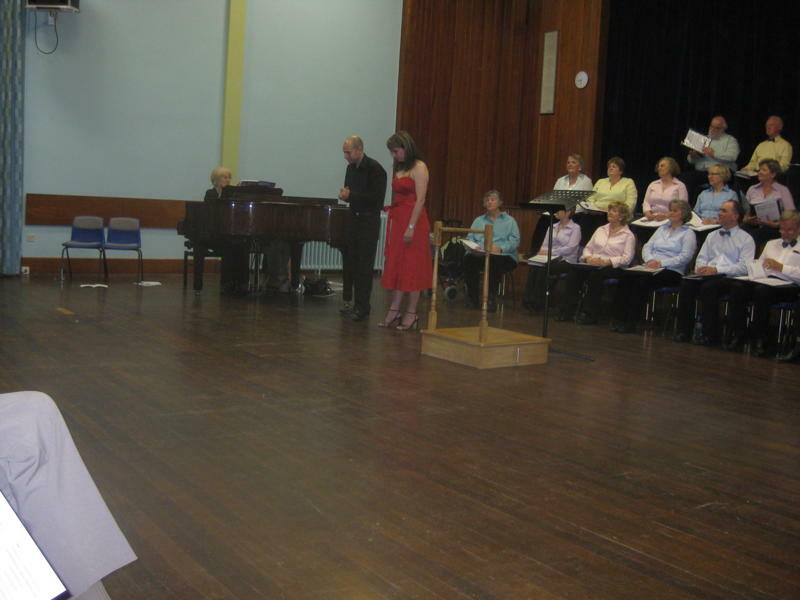 Professional soloists were Aberdeenshire’s Amy Strachan (soprano), Samuel Jenkins (tenor) and Neil Anderson (bass baritone). These three young guest singers are accomplished artists who have performed in many venues throughout Britain and it was a wonderful opportunity for the audience in Inverurie to appreciate their superb performances. Haydn’s Creation story is in oratorio form, a pattern of recitative (storytelling), aria (response) and chorus (praise), with the Chorus delivering dramatic pieces at the end of each day in the narrative. 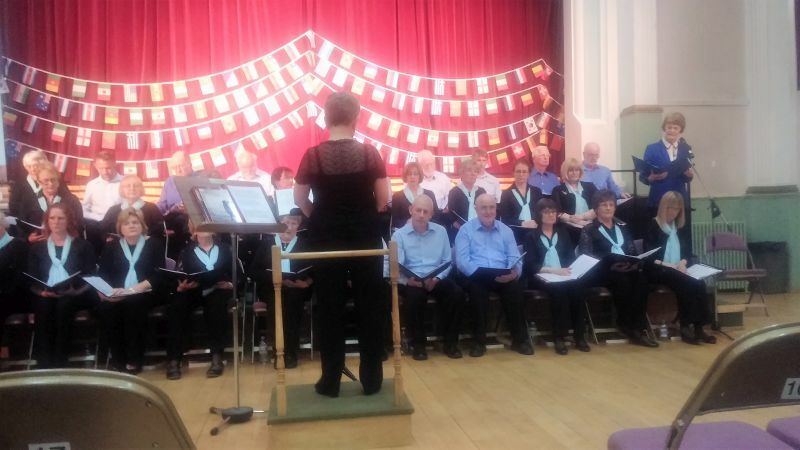 “Awake the Harp” and “The Heavens are Telling,” popular favourites, were well served by Inverurie Choral Society’s Chorus, keeping up the cracking pace set by Conductor Paul Tierney, with all four voice parts emerging in turn through the pieces. Inverurie Orchestra, Leader Sarah Beattie, showed in this performance how well they are playing across all sections. They played some sections alone, representing the state of Chaos before the world’s creation in the overture, painting tonally the sun’s appearance for the first time, and evoking the sounds and movements of various beasts. What a pleasure it was to hear the three young professional soloists taking the parts of the Angels, then Adam and Eve. It was extraordinary to hear the roar of bass soloist Niall’s growling tawny lion and his leaping tiger, with heavy paw steps echoed in the orchestra’s bass notes. Haydn would have seen lions and tigers in Vienna’s Schönbrunn Zoo, founded in 1752, which explains how he could represent them so well in this music of 1798. Sam, as Uriel, announced the moment man became “a living soul” in his firm and impressive tenor voice. 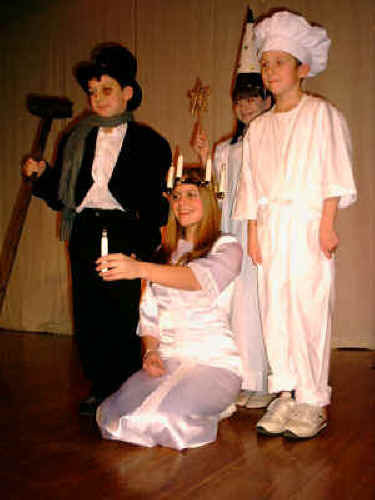 Amy, in the role of the angel Gabriel, gave a sweet rendition of the tender dove’s cooing. As with Niall and Sam, we would like to hear more singing from Amy at some point in the future. All in all this was by anyone’s standards an accomplished and polished joint performance of The Creation by the Choral and Orchestra, and easily the best collaboration between these two esteemed local organisations to date. "Wherever You Are", famously brought to the Public attention by Gareth Malone and The Military Wives Choir, was the opening song to set the scene for a "Round The World" musical trip brought to a good size audience at the Town Hall in Inverurie on Saturday 3rd June 2017. The song was well sung and from there we were taken around the world from Europe to Africa to USSR to The Far East to Australasia to the Americas South and North ending up at a position at 2.20 am on April 15th 1912 some 400 miles South of Newfoundland. It was a very brave programme to put on and the choir, as always, gave their best. There were some tuning issues on some of the songs but overall, it was a good concert and enjoyed by the audience. For me the first half favourites were; Wherever You Are, Aida, Chorus of The Hebrew Slaves and the good old Kalinka (that certainly brought back memories for me) to finish. The second half started with The Polovtsian Dances. This is a difficult piece to blend totally and after a little struggle, it came together well. The Ladies version of Bali Hai from South Pacific was quite haunting bringing visions of the South Pacific. My personal favourite was Nkosi Sikeleli Africa which was beautifully sung by the choir. The balance between the voices blended well whilst singing this "unofficial" anthem which is a portion of the South African National Anthem from 1994. 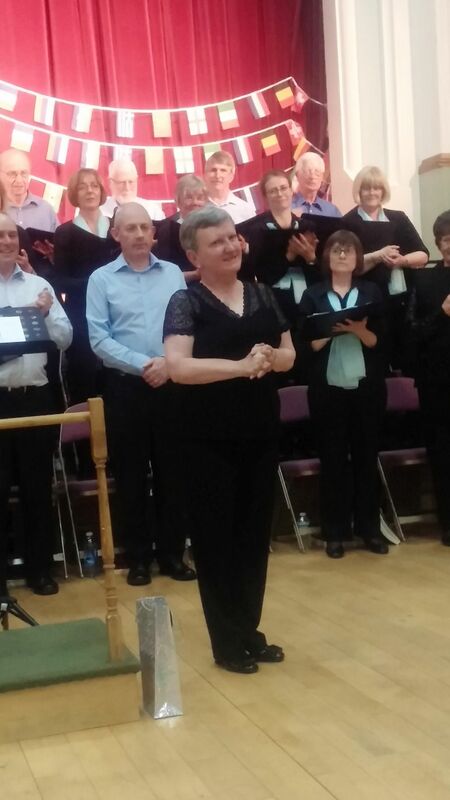 Both Moira's solo's were well sung (what else could I say about our MD). Following on the Spirituals were Oklahoma and the Black Hills of Dakota. I felt that these two songs could have had more of a difference to the stress of the the tunes. Oklahoma is a joyful song celebrating a marriage and the impending statehood of the County. I felt this could have been more joyfully stressed with the "Black Hills of Dakota" taken down a bit as it was about Calamity Jane's love for and desire to return to the Black Hills so there was a definite change between the two songs. Don't get me wrong, they were both sung well but I would have liked to detect a difference in stressed tones between the two songs. The finale of the show was a Medley from Titanic (The Musical). This was beautifully sung with feeling by all the choir. A final reprise of Wherever You Are was a great ending to a wonderful concert. 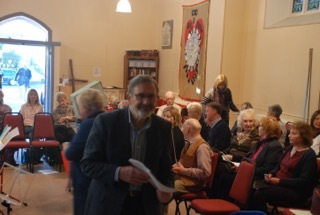 The concert was introduced with fascinating facts and poems by Margaret Hearne and the accompanist, Gordon Cooper, who had a large programme to follow (without a page turner) played well throughout. 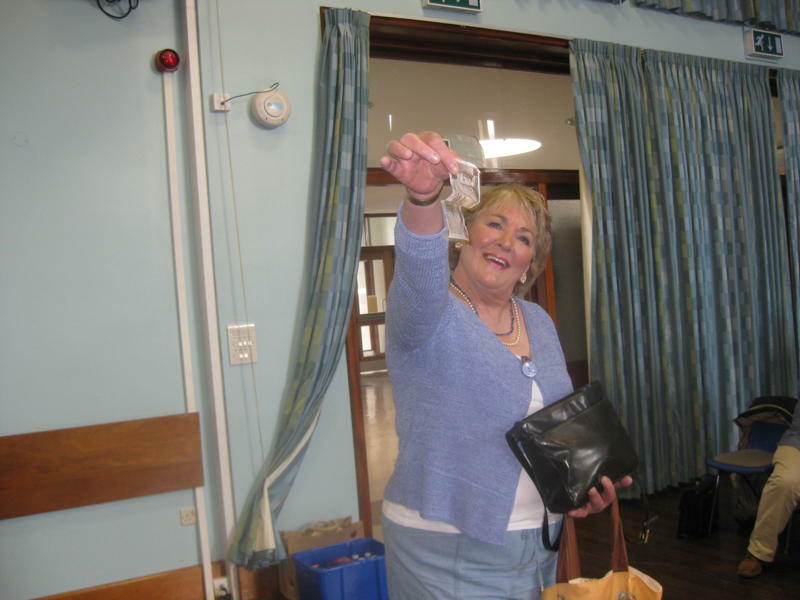 Thanks to Anne Robertson, we have a report from her for the concert. It was a novel experience being part of the audience for a change. I was not disappointed. The first half was light hearted and fun interspersed by interesting information about each piece by Moira. She also conducted with aplomb and seemed to be really enjoying the experience as much as the audience. The choir blended well and the sound was uplifting. The soloists were all wonderful throughout both halves. The second half had a very different mood and was very touching in places. Sometimes as a choir member we are aware of little mistakes and tend to focus on these. However listening from the front I experienced the emotion the choir produced. There were some beautiful harmonies emanating from the choir which I felt was thoroughly appreciated. This fairly complicated piece, culminated in a superb finish by the choir and soloists alike, leaving the concert goers thoroughly uplifted. There was no formal reporter at the concert. This report has been provided by a member of the Chorus and does not claim to be a critical review, but more a review of his experience and some of the comments received by critical friends after the concert. I hope it is appreciated in that light. 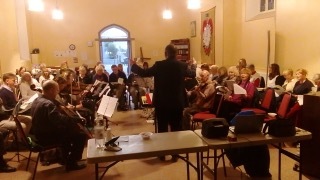 The Inverurie Choral Society planned to sing the Mozart Vespers in late November 2016 Occasionally in the life of a Society such as ours, the members and director come to the view that a delay or postponement might be necessary because the preparation needed to make a success of an event has not gone as well as could have been expected. That was the situation on this occasion and those who had purchased tickets were re-issued tickets for the February show, or refunded. Thankfully most had decided to attend last Saturday. Our view was that they won out. The choir managed several extra rehearsals and they entered the concert, nervously but with much more confidence. When they started with Mozart’s beautiful Ave Verum Corpus, the sound from all parts of the choir had a fair consistency which allowed the sheer magic of the composer’s intent to come over. As Nan, my guest in the audience said “ Loved Verum Corpus”. That satisfied me. A more taxing item Benedictus Sit Deus followed. Mozart was only 12 years old when he composed this and the first soloist soprano Moira Docherty was introduced. Moira has a superb voice and demonstrated it this evening. When in the next item she shared the stage with Bass, Gordon Jack, in the duet from the Magic Flute (Papageno and Pamina), both of their voices melded well. The choir then sang the Voyager’s Chorus from the Opera Idomeneo, with Moira again taking the solo part beautifully. Though the concert was given over principally to Mozart, two items by Haydn were incorporated. His Ave Maria was not easy to sing but I thought we worked through it and again referring to Nan, she praised it very highly. This was followed by an extract from Haydn’s Creation – “The Heavens are telling”. The whole of Creation is powerful, and this movement took a lot of effort. The first half ended on this emotional point. The main item was of course the Vespers. One of the difficulties for the choir is that they have to come into some of the movements without much of a lead. We all are expected to come in on the very first note, correctly. Of course in any ensemble not every singer gets it right all the time and the skill is in not blurting out a wrong note when there should be silence. This is especially so on the very first note! 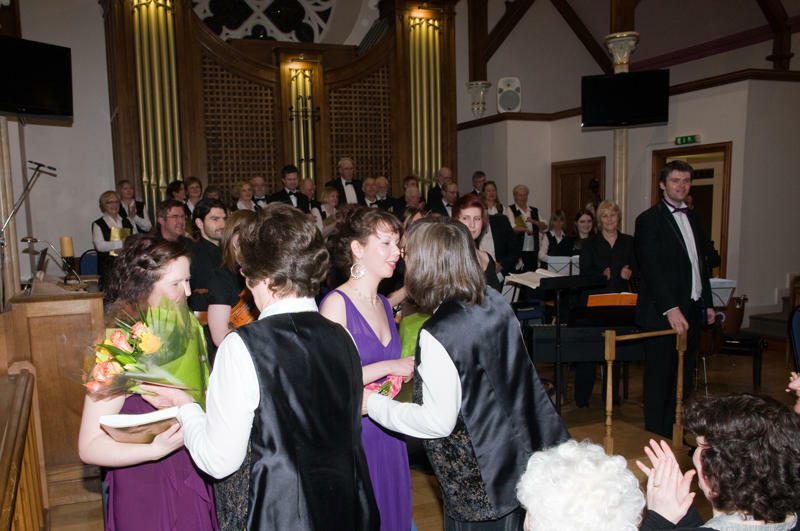 Our four soloists, Moira (sop), Megan Cormack (contralto), Thomas Kinch (Tenor) and of course Gordon (Bass), had quite a bit to do in their parts, and we relied on them tremendously. Harry Williamson carried the whole work really well on the organ. Our choir had a few setbacks even before we started when three members had to pull out through sickness and injury. Yet Moira Hunter, the Conductor expertly led us through a short, but quite difficult concert. The audience, which was very supportive, only sees the conductor’s back. We see a lot of baton waving, facial expressions of encouragement, and the words we should be singing mouthed at us. Then she turns around with a smile to the audience at the end. We were nervous at the start, but highly delighted at the end. The audience seemed to agree with us. 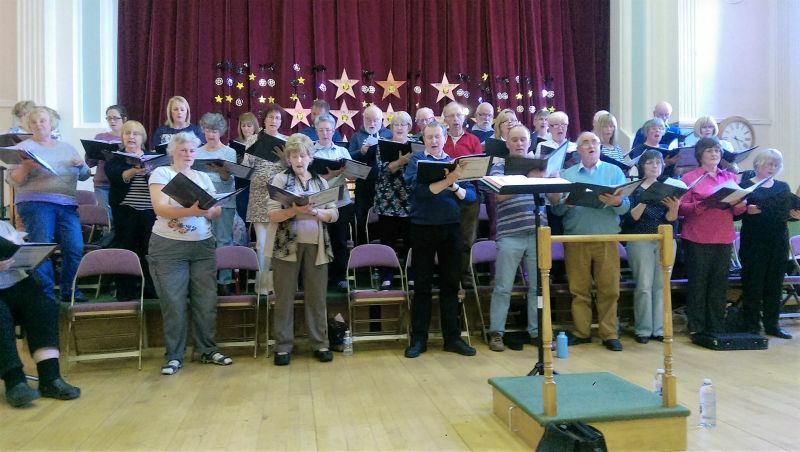 Inverurie Choral Society hosted a “The Village Carols Workshop,” a seasonal singing afternoon, and welcomed Professor Ian Russell, Conductor of the Workshop. 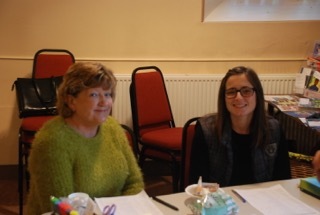 The Workshop was divided into two parts, with a break in between (tea and coffee provided). 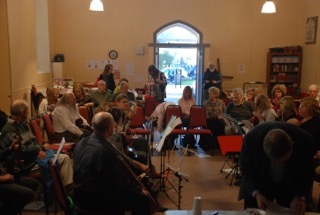 The Workshop was opened to Inverurie Choral Society Members, and singers and musicians (strings and woodwind) from the local area were invited to attend. 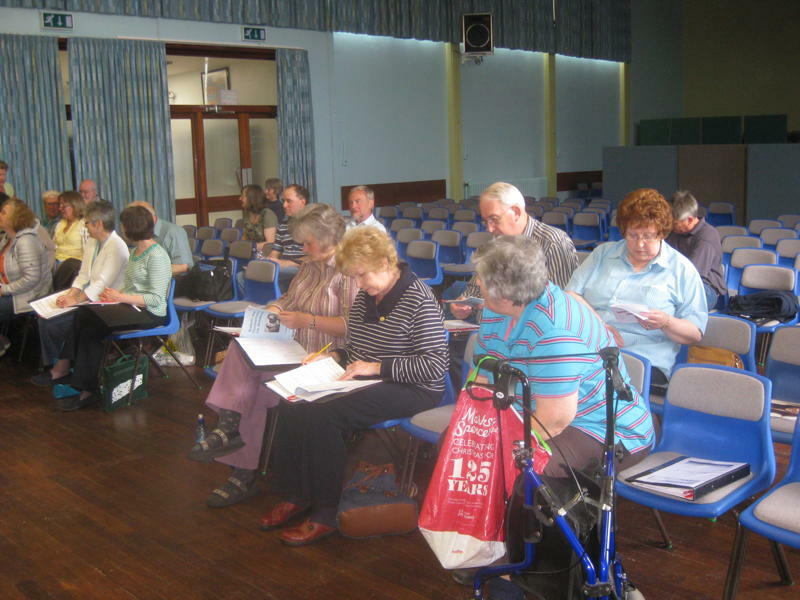 The Workshop helped participants learn the singing parts of eight favourite carols from village traditions in South Yorkshire and the Peak District. 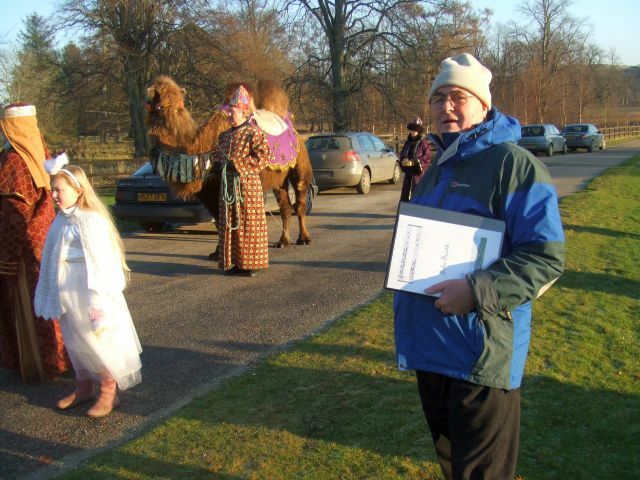 No special expertise was required, just enthusiasm for the carols and a willingness to join in. All the carols were pitched to fall within the range of normal voices (as in the pubs where many of these traditions thrive). Instrumentalists learnt to play the accompaniments in parts (string/woodwind). Based on the manuscripts used by village carol bands, these have been specially prepared and edited by Ian Russell, and are taken from The Sheffield Book of Village Carols and The Derbyshire Book of Village Carols. Emeritus Professor Ian Russell is the former Director of the Elphinstone Institute at the University of Aberdeen (1999-2014). 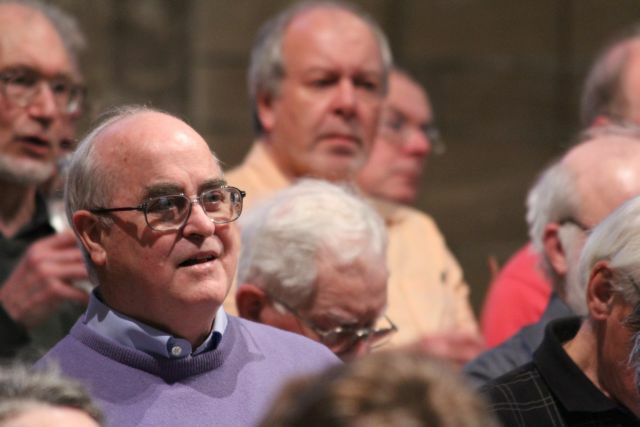 Since 1969 he has conducted extensive fieldwork into singing traditions in the English Pennines, especially Christmas carolling, and has published The Sheffield Book of Village Carols (2011) and The Derbyshire Book of Village Carols (2012). He is the founder and Director of the Festival of Village Carols, and the President of the North Atlantic Fiddle Convention, which has held meetings in St. John’s in Newfoundland, Derry/Londonderry in Northern Ireland, Cape Breton Island and Aberdeen. His most recent publication, co-edited with Catherine Ingram, is Taking Part in Music: Case Studies in Ethnomusicology (Aberdeen University Press, 2013). He is Principal Investigator in the AHRC/NAFCo Networking Project ‘Memory, Music and Movement’. 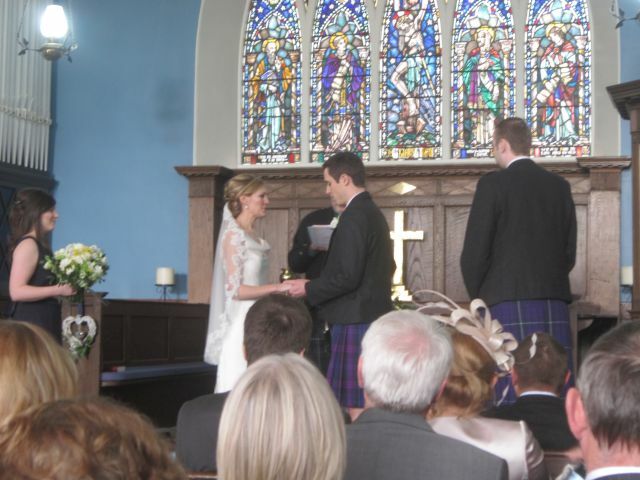 His fieldwork in North-East Scotland has included sacred singing, free-reed instrumentalists, singers, and monologue performers. 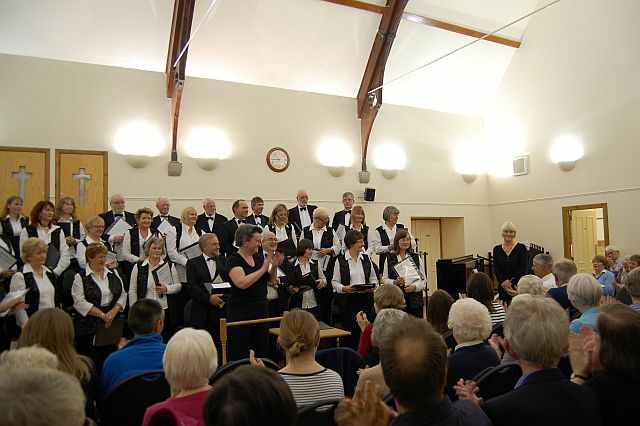 The Inverurie Choral Society’s 2016 summer concert, entitled ‘Melodies from the Movies’ took place in the Inverurie Town Hall on the 4th of June. For this special concert, borrowing musical inspiration from the world of cinema, the society teamed up with Strathburn Primary School choir. The concert was very well attended and both the choirs and the audience seemed to be in good spirits, perhaps due to the beautiful weather on the evening. 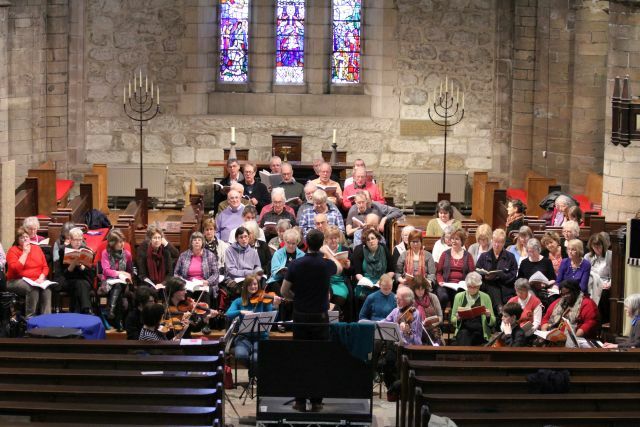 Having attended several Inverurie Choral Society concerts in the past I knew to expect a high level of ability paired with a varied programme of music. 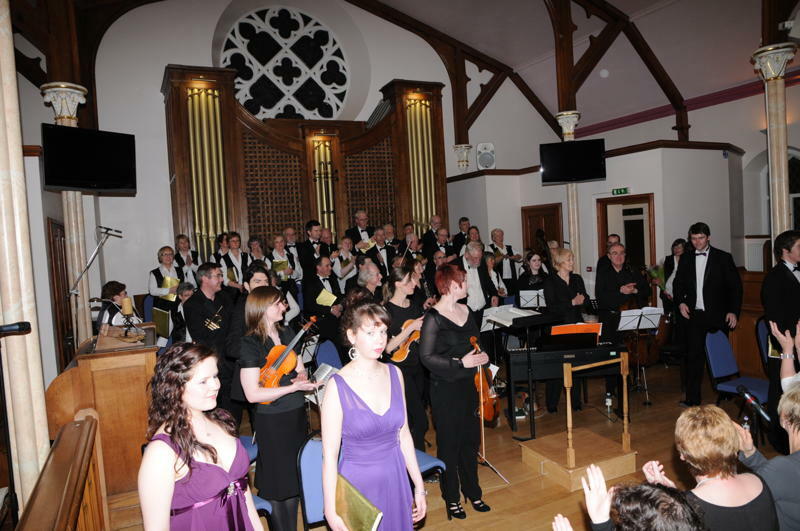 This concert followed in a similar high calibre fashion starting with a selection of tunes from ‘The Sound of Music’. Instantly I was reminded of the warm and balanced tone that the choir produces. This was followed by the famous ‘Moon River’ from ‘Breakfast at Tiffany’s’. Performed in an a capella style this difficult to execute piece was well performed, though perhaps a tad too fast for my taste. A medley of tunes came next which included the theme from ‘Dr Zhivago’, ‘Skyfall’, a classic from ‘Casablanca’ and finishing up with ‘Raindrops Keep Falling on my Head’ from ‘Butch Cassidy and the Sundance Kid’. 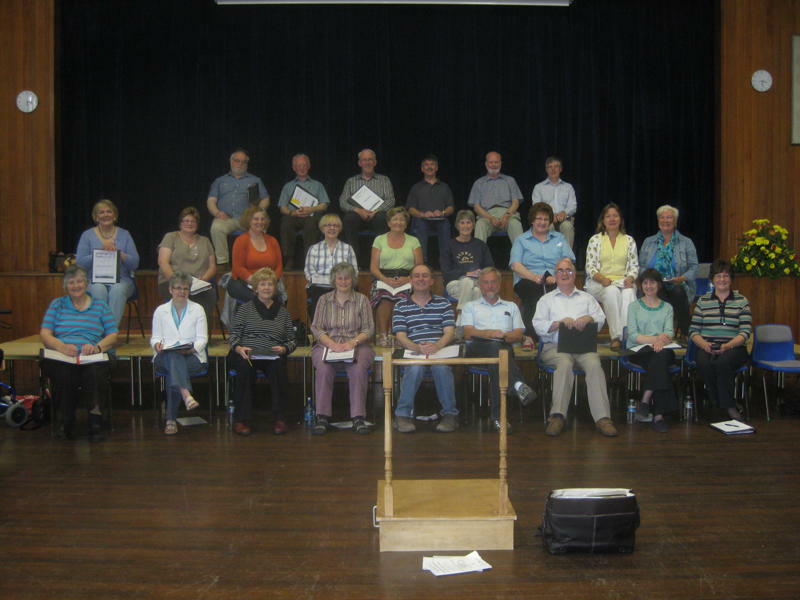 These tunes juxtaposition a number of greatly different musical styles, however the Choral Society made sure that they worked well together and performed each one with great energy. This more light hearted set of tunes was closely followed by an arrangement of ‘Flowers of the Forest’ from ‘Sunset Song’. This was performed with a beautifully minimalist piano accompaniment and was paired with the soothing ‘Into the West’ from ‘Lord of the Rings’. At this point of the evening the Inverurie Choral Society left the stage to allow the Strathburn Primary School choir to delight us with a medley of Disney Classics. It must be said the choir sang wonderfully showing great energy, a lovely tone and enthusiasm in bundles. They sang without printed music and did not falter, doing themselves and their musical director Ruth Simpson proud! 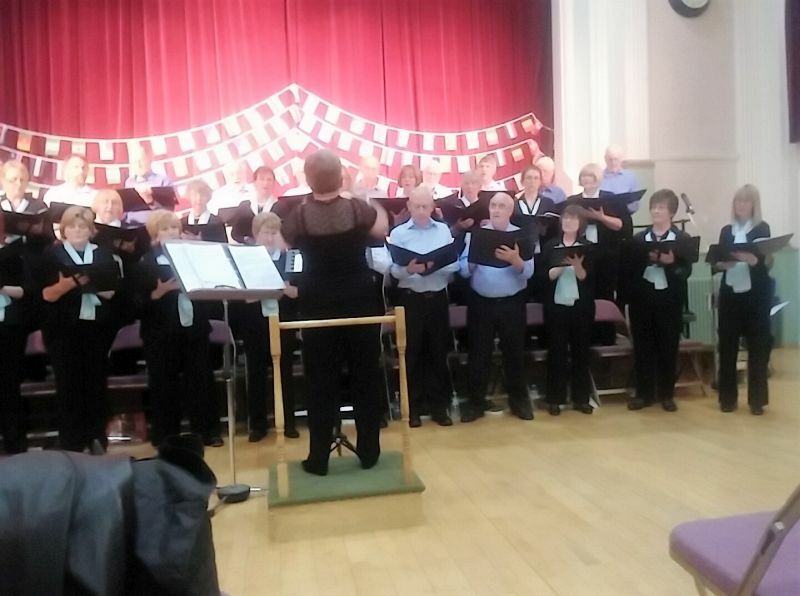 The first half of the evening was brought to a close with a challenging selection of extracts from ‘Les Miserables’ that was performed well by Inverurie Choral Society. After the obligatory interval ice cream a light hearted ‘Ascot Gavotte’ from ‘My Fair Lady’ reintroduced the audience for the second half. Special guest violinist Finlay Morse provided an instrumental interlude playing the touching ‘Ashoken Farewell’ from ‘Civil War’ before the choir set forth singing another medley of light hearted and contrasting tunes from ‘Oklahoma’, ‘Calamity Jane’, ‘Fidler on the Roof’ and ‘Carousel’. The Strathburn choir once again took to the stage to perform a second selection of Disney classics, this time including ‘You’ve got a Friend in me’, ‘When you Wish Upon a Star’, ‘Supercalifragilisticexpialidocious’ and ‘Circle of Life’. They did not fail to impress! 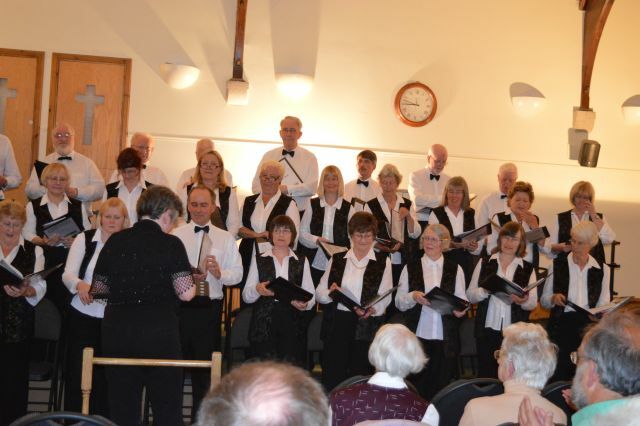 Any concert needs to be finished with a crowd pleaser and for this Inverurie Choral Society chose to perform many of the classic ABBA songs from the musical ‘Mama Mia’. While these could have been executed in a more light hearted style by the choir, musically they were hard to fault and definitely provided a suitable end to a great evening. 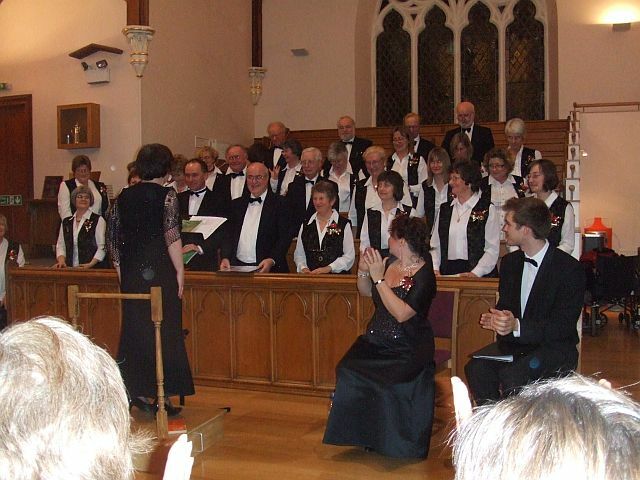 Thus concluded another very well performed evening of music from the Inverurie Choral Society expertly conducted by Moira Hunter and accompanied by pianist Isobel Burnie. Margaret Hearne deserves special mention for providing informative and humourous introductions to the pieces. "Welcome to members of Inverurie Choral Society who are delighted to be singing for you tonight in support of local flood relief. The singers are beginning with the “Ascot Gavotte” from Lerner & Loewe’s My Fair Lady - check the classy accents! This is followed by “Away from the Roll of the Sea,” a lovely ballad by Allister MacGillivray, the well-known Canadian folk-song writer and composer. 3. What shall we do with the drunken sailor? And finally get your hankies out for an extract from “Les Miserables,” the block-busting show from Boublil & Schönberg. 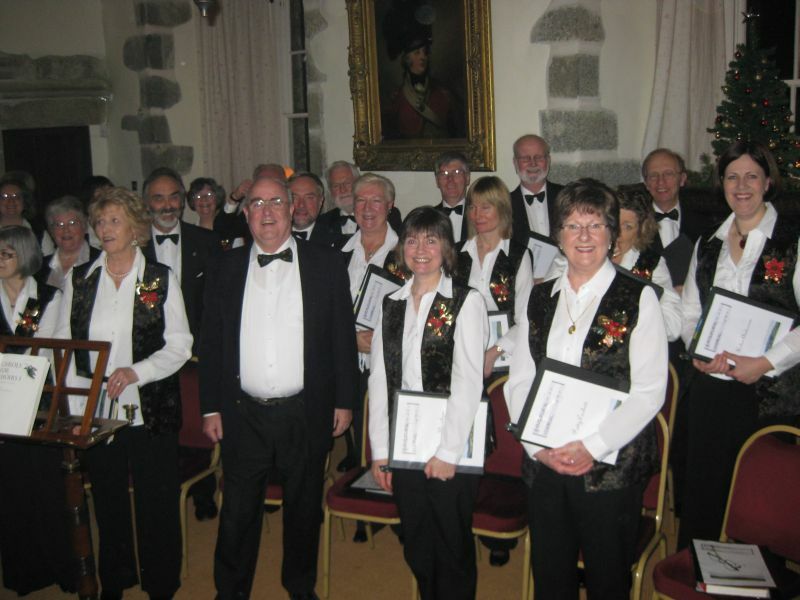 To hear more from Inverurie Choral Society, come back here to the Town Hall for “Melodies from the Movies” on Saturday 4th June 2016." 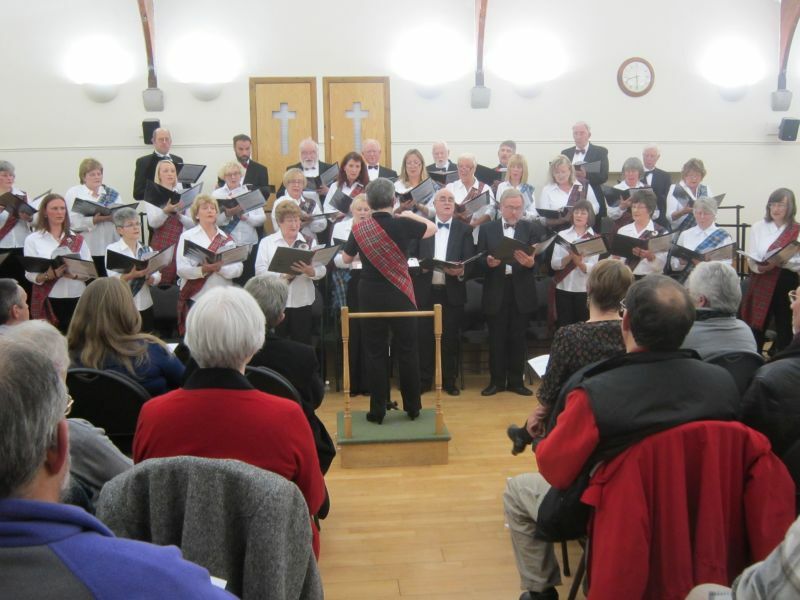 On a cold, frosty Saturday 12th December 2015 at the Acorn Centre, the Inverurie Choral Society presented its Annual Christmas Concert. This year featured the Little Credo Mass in C, (K257) by Wolfgang Amadeus Mozart. The choir had never sung this piece before so it was to be a treat for those in the audience who had never heard it, or ever even heard of, this particular Mass. The Mass is made up of six sections, Kyrie, Gloria, Credo, Sanctus, Benedictus and Agnus Dei and is sung in Latin. It was one of Mozart’s earliest major works, and the young genius embedded many new features, which in the context were the equivalent of pop music of the day. 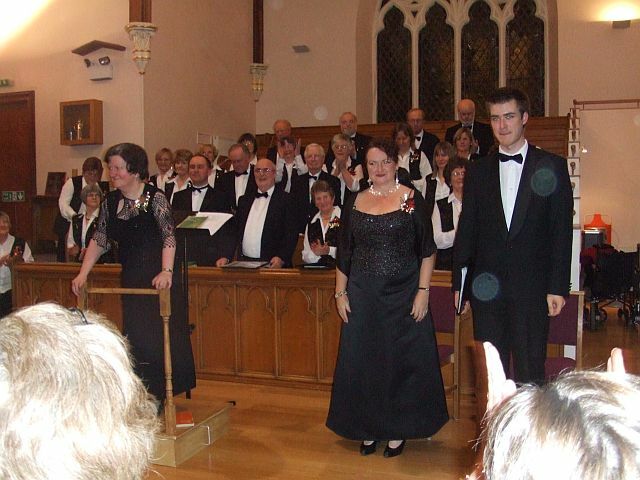 The soloists were Moira Docherty (Soprano), Anna Hamilton (Alto), Chris Wallace (Tenor), Gordon Jack (Bass) accompanied by Gordon Cooper on the organ. Moira Hunter the Choir’s Musical Director, who has only recently retired from Cults Academy after more than three decades, seemed to have lots of energy and conducted with the whole ensemble confidently. The opening Kyrie set the tone for the evening. The opening phrases were succinct and crisp. The superb voice of Moira Docherty soared into Gloria with the choir gaining confidence especially with the final amen before the Credo. In this, the first high “Credo” was sung very confidently and accurately. The small number of tenors occasionally stumbled but in this passage they found their self-belief and produced some excellent sounds. The four soloists soloist took over before the choir joined them with a very complicated and demanding passage which required a lot of concentration and spot-on timings. The Sanctus with “Hosanna in Excelis Deo” was very well tackled, with the altos following the sopranos like an echo. The Benedictus was started by the quartet. The high notes of the ladies were grounded by the basses giving the choir confidence when they joined in with a secure reprise of “Hosanna “. The Mass ended with the Agnus Dei where the quite difficult “dominus pace mundi” caused a few stumbles but all finished well with the final “dona nobis pacem”. The choir should be proud of this first attempt. The overall sound they produced was very melodious and rounded. It was not an easy mass to perform and they did very well. After a short interval you could almost feel the choir relax as they sailed, unaccompanied, into Ding, Dong, Merrily on High, Gloucestershire Wassail, Away in a Manger and O Little One Sweet. Each carol was word and beat perfect. The organist joined in for the next carols – Candlelight Carol by Rutter and Sans Day Carol arranged by Rutter before a really excellent unaccompanied Angels from the Realms of Glory, a beautiful Holly and the Ivy and a lively, zippy Zither Carol. Moira Docherty gave a hauntingly ,spine-tingling O Holy Night before the choir launched into the popular Shepherds’ Farewell and Torches. Anna Hamilton stirred the audience with “Little Road to Bethlem” before the concert ended with Stille Nacht. It was a very happy audience which left the Acorn Centre humming and buzzing and no doubt looking forward to the choir’s next performance. 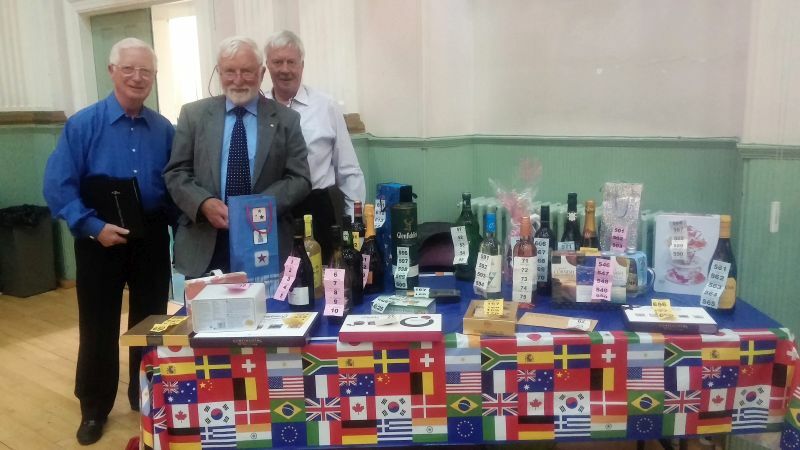 While the wind blew in strong gusts nearly knocking the pedestrians over in Inverurie on the evening of Saturday 6 June , all was still inside the Town Hall as the audience settled to hear the Inverurie Choral Society’s Summer Concert - Songs of the Seas. The evening started quietly with the melodic ‘ Away from the Roll of the Sea’ by MacGillivray followed by the powerful ‘Blow the Wind Southerly’ in an arrangement by Hunter. In the following ‘Voyagers Chorus from Idomeneo’ by Mozart, the solo soprano rose to the occasion and the ladies successfully tackled ‘The Spinning Chorus form Wagner’s The Flying Dutchman. Well known Scottish songs were on hand with the males heaving away on the Mingulay Boat and the ladies enjoying the Eriskay Love Lilt till the whole choir ended up in the Skye Boat Song. Two A Capella numbers followed. Jephson’s “The Arethusa” and Sangster’s ‘What shall we do with the Drunken Sailor were both sung with gusto and enjoyment with the drunken last verse leaving the audience in stitches. Shenandoah and When the Boat Comes In gave the ladies another chance to show their range with the slow movements of the rolling river and the light, quick, staccato “dance for the daddy”. The Medley from Titanic the Musical brought the first half to an end portraying the hopes and aspirations of the passengers. Those on the lower decks were dreaming of the jobs they might get while the wealthier were enjoying the occasion. The ragtime number was brilliant and almost had the audience up on their feet. It was almost a shame that it ended. By the second half, dedicated to Gilbert & Sullivan’s HMS Pinafore and The Pirates of Penzance, the choir had begun to relax and enjoy themselves. 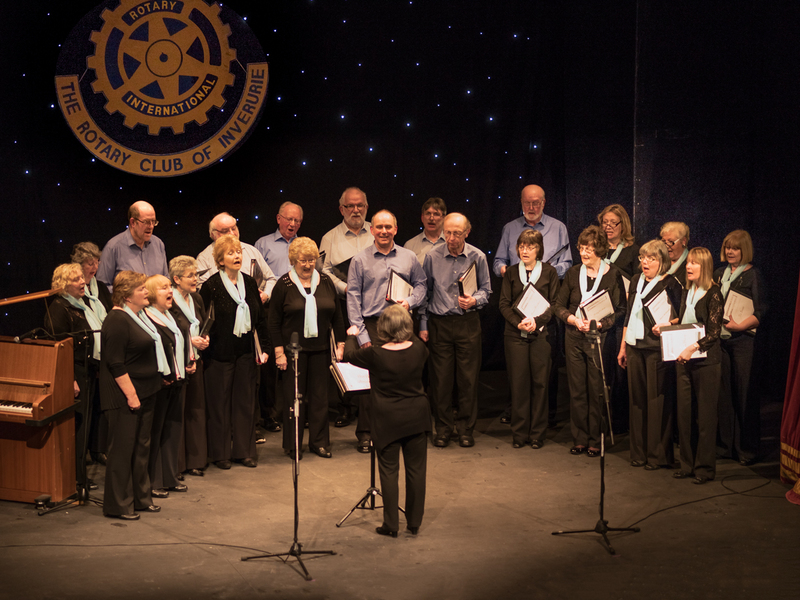 The choral numbers proved that Inverurie choir is at its best when it sings ‘ensemble’. 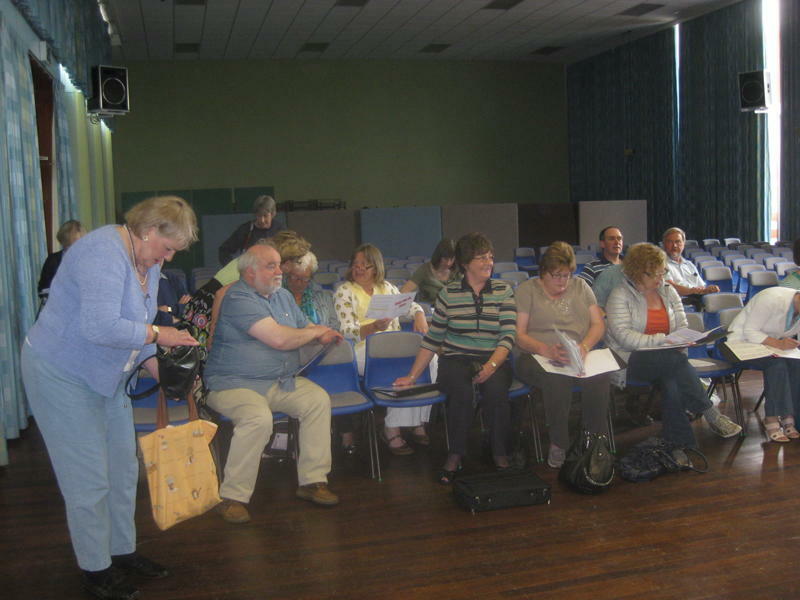 The members feel more confident, look less at their books, more at the conductor (Moira Hunter) following her instructions and so perform the very tricky musical entries and exits exactly and are able therefore to keep the momentum flowing. Poor little Buttercup (Morag Ryan) sang her mournful song beautifully and Mabel (Anna Hamilton) sent her Poor Wandering One ringing up to the rafters with its soaring coloratura. On the male side the Pirate King (Ken Lawton) was very plaintive in his apology for being a pirate while the Police Sergeant(Joe Wallace) let is all know that his lot was not a happy one – almost stealing the show with getting the audience to join in the lament of his woes. The final number where the police are being persuaded, indeed ordered to apprehend the pirates and if necessary die in the process (!) is very complicated with the ladies, the men, Ruth(Tracey Stewart) and the Major General(Sally Lawton) all singing different parts, needs careful timing to make it work and on this occasion it all went perfectly and ended the evening on a rousing note. The piano accompanist Isobel Burnie was an asset to the whole performance. The Choir should be feeling proud that they had given a successful performance sending the audience home humming. On a sunny but breezy, Sunday 1st March 2015, a few ICS members had a warm welcome from staff and residents of Badenscoth Care Home. 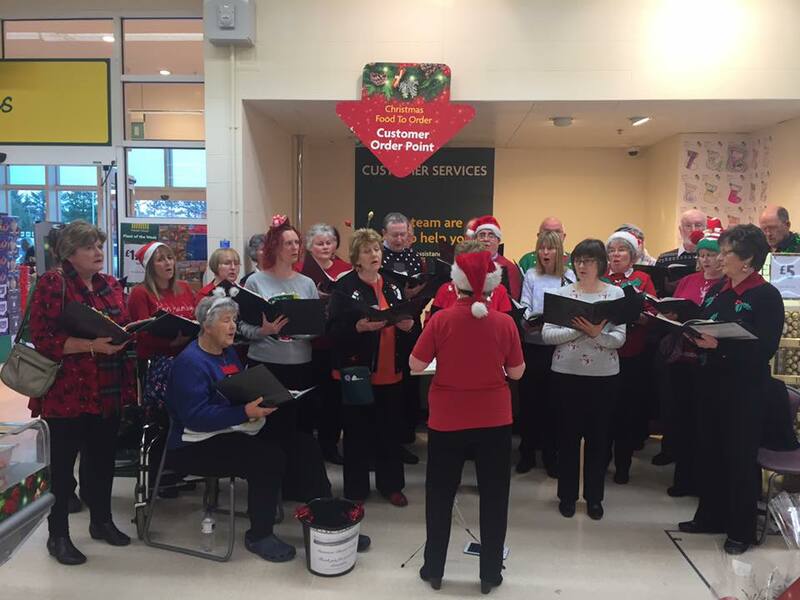 Inverurie Choral Society and Home-Start Garioch have just enjoyed sharing the proceeds of a joint fundraising event, a morning of Christmas Carol singing and Bag-packing, held on 20th December at Morrison’s in Inverurie. The final “Big Saturday Shop” before Christmas can be a fraught occasion for everyone, but the tuneful Carols and helpful filling of customers’ shopping bags ensured that there were smiles on faces! 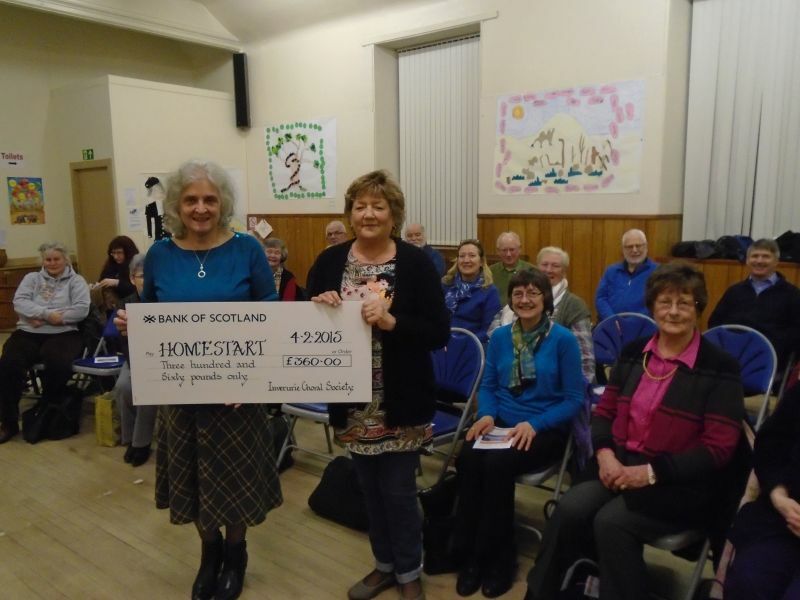 Jackie Loder, Home-Start Garioch Vice Chair, accepted a cheque from Jenny Greener, Chair Inverurie Choral Society, on Wednesday 11 February at the Choir Practice in the West Church Hall. 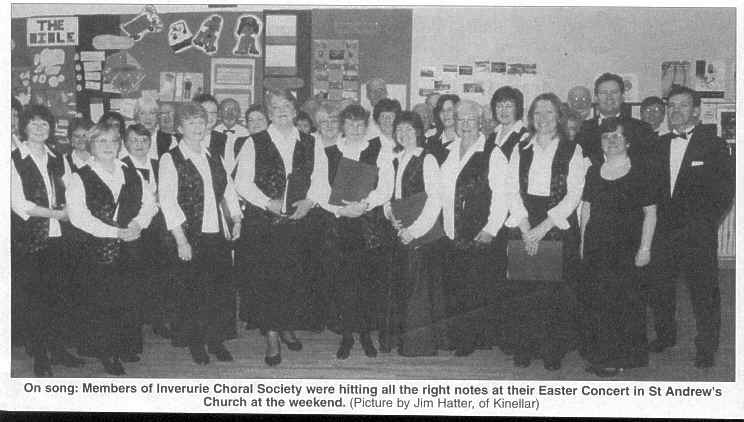 Inverurie Choral Society has been entertaining audiences in the Garioch for more than fifteen years. 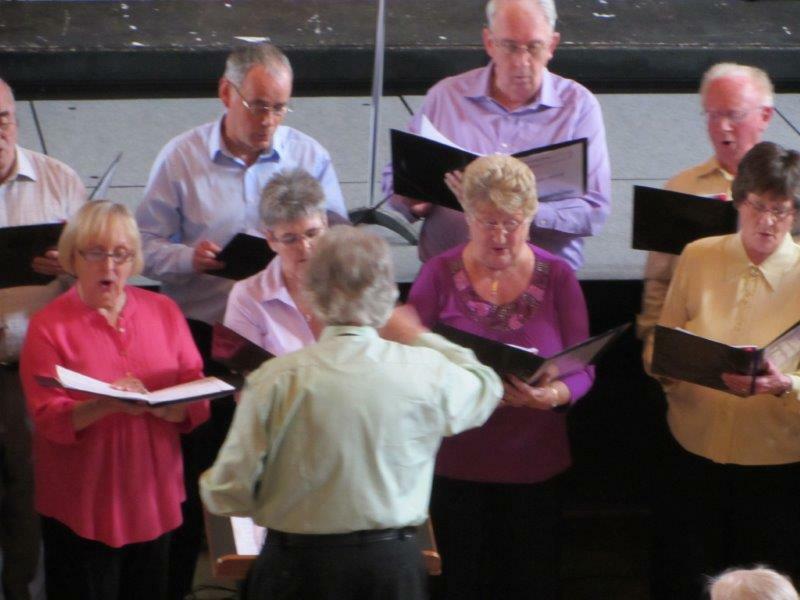 The funds raised will enable the Choir to stage a further concert on Saturday 6 June in the Town Hall. 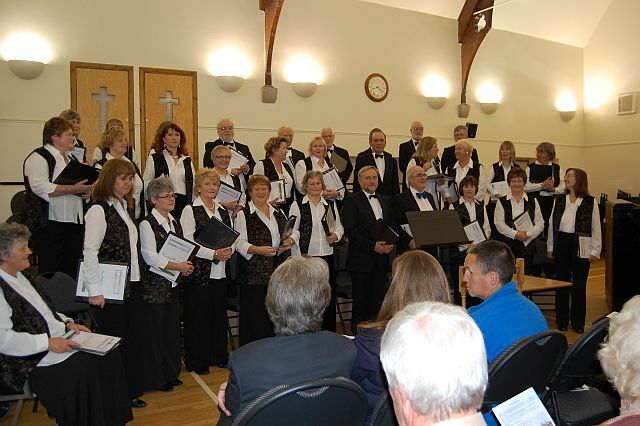 Provisionally entitled “Songs of the Sea”, the concert will include a medley from the musical “Titanic” and some well-known choruses from Gilbert and Sullivan operattas “The Pirates of Penzance” and “HMS Pinafore.” Home-Start Garioch, the local family support charity, is also celebrating fifteen years of working in the Garioch area. These funds will enable Home-Start Garioch to explore fresh avenues of development in their work with local families where there are young children, including recruitment and training of more volunteers. 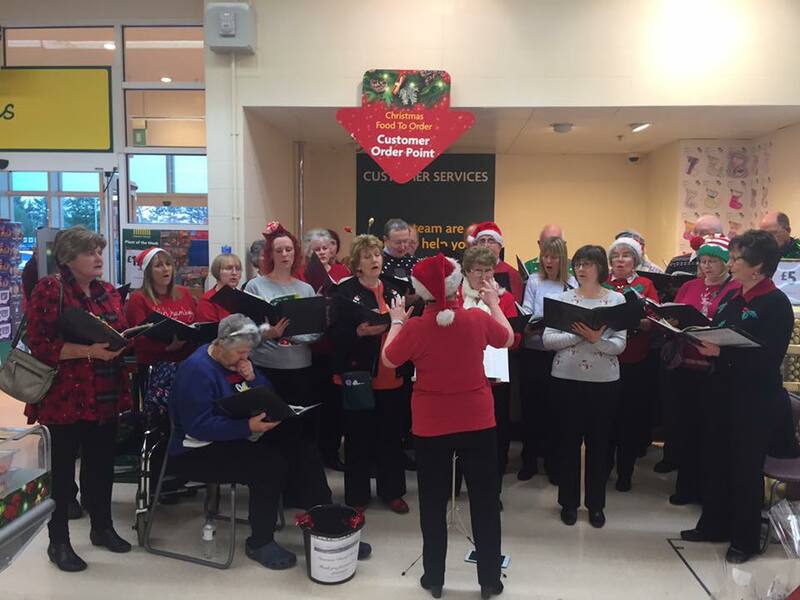 Saturday was morning was spent at Morrison's Inverurie singing carols and bag packing. A very big "Thank You" to Moira and all of you singers who turned out to sing at these venues. Steve, the senior manager at Morrison's, said he got lots of favourable customer comments on the live carol singing, and the atmosphere in the shop certainly seemed to us to be happy and relaxed. Extra thanks to those of you who were also at the tills, along with Home-Start Volunteers, and especially to Rob and Joe, our two bucket boys, for charming even more small change out of people's pockets. The total sum raised at Morrison's was £720.39The Morrison's event was done with Home-Start Garioch and we will update you in the New Year re disbursing the proceeds. Patty suggested that the caption should read "Thank you for singing at Morrison's". I was going to replace the word "shopping" with "singing" but I felt that the expression is protected and I don't want to get into any trouble!! Thanks Patty for the photograph. Saturday 15th November 2014 - "Music from the Great War"
On Saturday evening, the Inverurie Choral Society gave their tribute in Remembrance of those fallen in the First World War in their concert ‘Music from the Great War’ at the Acorn Centre, Inverurie. Performing to a packed house, they were ably supported by children of the Primary 6/7 Choir from Strathburn Primary School, soloist soprano Anna Hamilton and narrator Margaret Hearne. 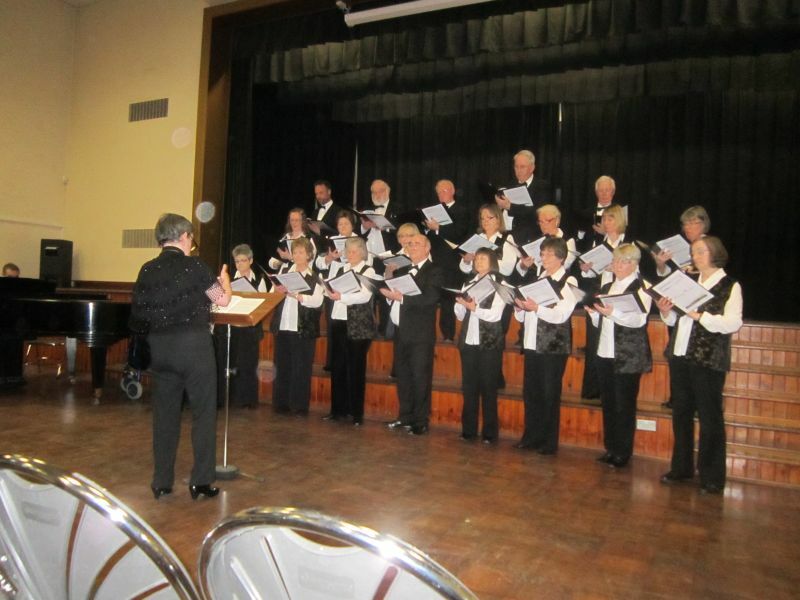 The concert was a celebration of the beautiful music, inspired poetry, uplifting airs and cheery songs which came out of the dark days and horrible circumstances of the First World War. 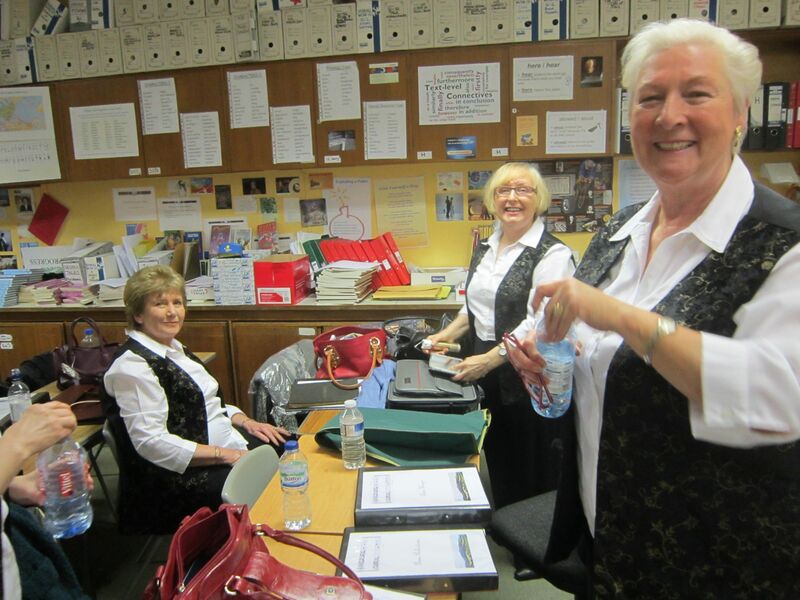 Moira Hunter, Musical Director of the Inverurie Choral Society, as always, organised her troops well. The Choir, opening with Elgar’s elegiac “As Torrents in Summer” sang with feeling and a broad range of tone and melody. It filled the auditorium later with a mix of moving, uplifting and amusing songs. The addition of Poetry and narrative, very expressively delivered by Margaret Hearne, helped draw the audience into the spirit of the times and remind them of the powerful feelings young men can express in difficult circumstances. The extract from Lewis Grassic Gibbon’s “Sunset Song” read over the choir singing “Tunes from the Trenches” was particularly evocative. The children from Strathburn School were a revelation. Ruth Wight, Depute Head at the school, their conductor, can be very proud of the way they performed on the night, especially their rendition of “Alexander’s Ragtime Band.” To be asked to perform in an auditorium, in front of 150 people, most of whom were strangers and in the company of professional and expert singers, must have been daunting but they really rose to the occasion. They sang with exactness, clarity, and such fun that everyone was captivated. If anyone needed to be reminded that young people are our future, then the Acorn centre was the place to be on Saturday night. This was a serious concert very well performed by all concerned. To look back and show how uplifting the human spirit can be in times of adversity was a laudable aim and was carried off with great success. The masterstroke was to involve children. Nobody could have predicted just how good they were going to be. Well done to Inverurie Choral Society and Strathburn School. The whole event was superbly accompanied by Blair Cargill on the piano. 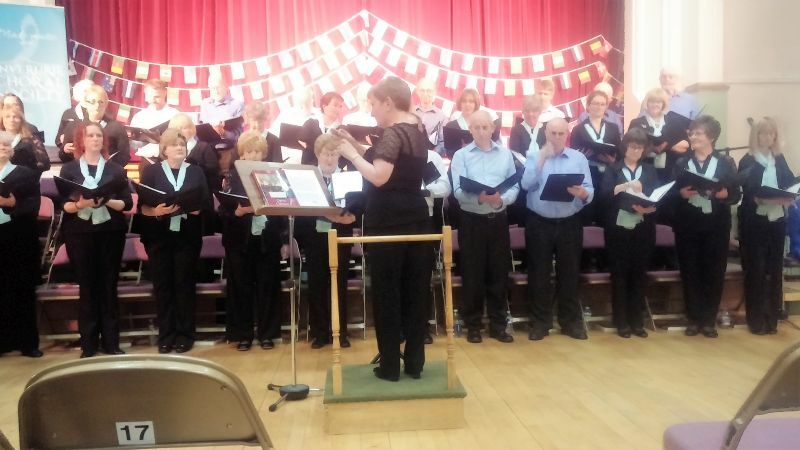 The Inverurie Choral Society’s annual concert was held on the 7th of June in Kemnay Church Centre. The venue is a picturesque building which provided a perfect backdrop, both visually and acoustically, for a night of choral delights. The Society’s varied set started with the Welsh composer Karl Jenkins’ ‘Requiem’. This 2005 composition juxtaposes movements involving Japanese haikus thematically focused on death with the traditional movements of a Requiem. Through the mixture of Latin and Japanese texts a rich musical experience was created. The choir began the Requiem in a solemn manner which was emphasized by the surrounding of the church centre. One of the most notable elements of this section was the well-rehearsed melismatic singing of the choir being bound in statement and imitation with the accompanying flute. As the Requiem continued it took the audience through a number of different atmospheres and moods such as the fast paced, syncopated ‘Dies Irae’ section which created a sense of urgency and the tearful ‘Lacrimosa’. Both were well communicated by the choir. From a vocal point of view a stand out part of the performance was the ‘Pie Jesu’ which was sung with a beautiful balance of voices. The choir managed the challenging and contemporary Requiem wonderfully showing a good use of the voices available as well as keen direction and arrangement for the accompanying piano, flute. cello and drums. I am sure that the audience and the musicians themselves would agree that the element of drama created during the Japanese haiku sections was top class. At first these were sung by female voice alone accompanied by an ostinato on piano and counter melody provided by the instrumental section. This dropping of the bass and tenor parts allowed the sweetness of the female voices to really shine. Further into the composition the female voices, singing in Japanese, were joined by the male voices, singing in Latin. This layering of text created a spine tingling effect and the choir succeeded in keeping the music in its duality of modern and classic while providing great imagery of the scenarios described by the Japanese text. The second half of the performance proved to be a much more light hearted and traditional affair consisting of two compositions by John Rutter, ‘I Will Sing With The Spirit’ and ‘A Clare Benediction’, and Paul Mealor’s ‘Wherever You Are’. While these did not possess the same level of interest as in the first half of the performance they were very well sung with the choir showing a great tone and use of dynamic. On your behalf, I would like to thank Dr Paul Tierney for the gentle way in which he guided us through the day with warmth, good humour and seemingly endless patience. We wish him well in his London Marathon participation next Sunday in aid of Children with Cancer UK. You can support Paul at http://uk.virginmoneygiving.com/PaulTierney. 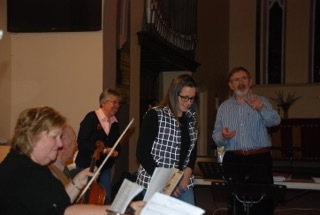 Our accompanist Christine Moore and the talented orchestra organised by Paul and led by Alexandra Morrison also deserve our thanks for so generously sharing their time and talents with us. While I found myself acting as the public face of the event, you will have been aware that there was a support team who quietly ensured that everything ran smoothly in the background. 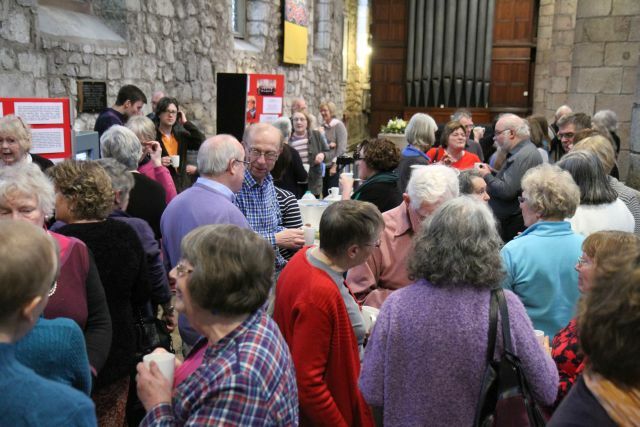 I would like to pay tribute to my co-organisers, our Session Clerk Alan Grant and Elspeth Ross whose catering team (the ladies of our Women's Group) kept us sustained with essential teas and coffees and wonderful soup and cakes. Finally, our Cathedral Manager Judith Norton offered invaluable guidance in advance and immense support on the day. Thank you all. It was a wonderful team effort. We had a hugely enjoyable day and I am delighted to let you know that we have raised over £1400 for Lifestraw water filters for Malawi. We could never have imagined such a response and we are overwhelmed by the generosity shown by yourselves, by members of St Machar's and visitors. Thank you very much indeed. This year 2014, the Aberdeenshire Music Festival was staged at Portlethen Academy. The organisers, chaired by Roger Reed, noted that this was the third time they had been at Portlethen in the twenty-five years of the Festival’s existence. For many reasons the Festival has been declining and this year featured only four choirs. In days past the choirs reached double figures. Having said that, it was a case of never mind the width, feel the quality. 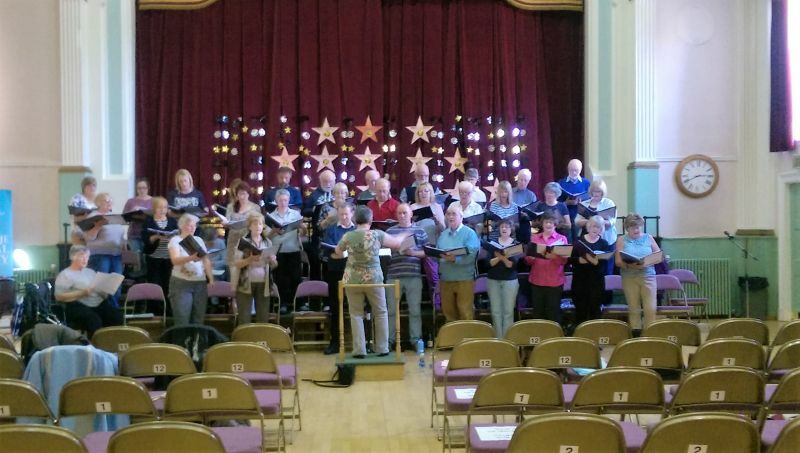 The groups, Inverurie Choral Society, Aberdeen Orpheus Choir, Silver City Singers and Stonehaven Chorus entered into the spirit of the event. When Edward Caswell, our musical director for the day, started on us, I felt the sounds developed impressively. The main fare was Praise the Lord (Handel) and The Tither Morn (John Hearne). The latter was new and John, who was hovering around most of the day was able to hear it sung for the first time and declared himself very pleased with the result. This is always good for singers to hear from a composer. For practical reasons Handel was not around to witness our rendition of the air from his Solomon. As a timid tenor I felt I struggled throughout, but I was impressed when my colleagues and all the other sections seemed to carry off some quite difficult parts with bravura. The afternoon session, we were practised with considerable skill by Edward, who apparently spends a lot of time coaxing young groups as well as top flight foreign choirs in his day job, was to my mind, not easy. We really had to work hard to get the notes right, and as Eric Morecambe might have said, sing them in the right order. By tea time I think we were all ready to practice our own party pieces and then tuck into a substantial meal. Opening the evening concert with the massed choirs and the principal fare, felt good. If I am being honest, my personal feeling was that it went well, but another attempt might have improved it. The Inverurie Choral had their chance to start the show, and we took the Introit from Karl Jenkins’ Requiem. We had been practicing this for a while now, and in my opinion did not let Moira Hunter, our director down. With this comforting feeling we launched into Loch Lomond and Kirkwall Bay with exuberance, and judging by the reaction of our audience, a knowledgeable and critical bunch, we passed the test, and relished the applause. 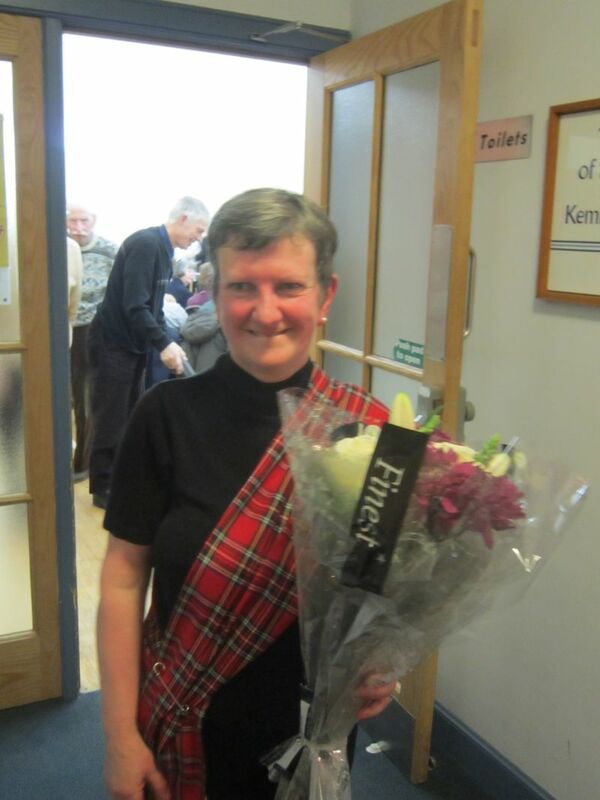 Jane Murray led the Aberdeen Orpheus Choir into the Kyrie from the Mass in B Flat by Hummel. It was not a piece I was personally familiar with, but I expect Inverurie will chance it in the future. I do not think it was easy, but the Orpheus choir made a good fist of it. The Hebrew Folk Songs (Kala Kalla) took some understanding and I was not certain whether I understood it, but we all enjoyed Randy Newman’s “You’ve got a friend in me”, which they rounded off with. The Silver City Singers were different again and wonderfully so. Starting with “Sh-boom” and segueing into “Catch a Falling Star”, Perry Como’s hit from the fifties, the group exuded confidence and sheer pleasure. The first couple of choirs offered a more classical style. These chaps fed the audience fun and we really appreciated it - especially when they completed their repertoire and gave us an extra item which we could all enjoy and join in; the Beatles “When I’m Sixty Four”. This we did with gusto. Musical Director of the Festival, Inverurie based, Dr John Hearne, then took us though a journey encompassing Wales, Skye and Iceland accompanied by The Stonehaven Chorus. For our benefit they sang the Welsh items in English and did so with aplomb. His own arrangement of “The Seagull”, a Skye folk song was quite tricky, especially with the strange gull sounds which peppered the item, but I liked it. Reflecting his time as a teacher in Iceland, the hymn “Nu Hverfur Sol I Haf” concluded the concert. Or so we thought. One of the tenors, dressed as a yokel, or we might say, Orra Loon took the floor and sang about “McGinty’s, Meal and Ale”. It was great fun and in the programme notes the chorus was written and we all joined in. Though we had had a great day we all left in thoughtful mood, because the future of the Festival is in some doubt. A committee was elected to consider its future. We hope they will come up with a solution. 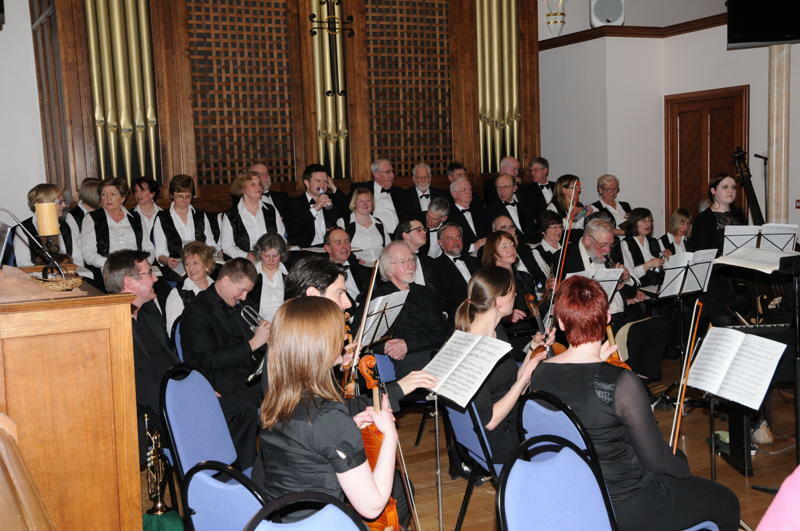 On Sunday 9th June 2013 in Inverurie Town Hall, Inverurie Orchestra and Inverurie Choral Society performed a joint concert. This was the second such event, the previous being two years ago when they featured great choruses from the operas. This evening’s programme was devoted to the music of Edward Elgar. It included The Sea Pictures and The Music Makers, often featured together on CD, Pomp and Circumstance Marches Number 1 & 2 and the Cockaigne Overture. A typically ambitious programme for the conductor Dr Paul Tierney and Choral Society Musical Director Moira Hunter.. 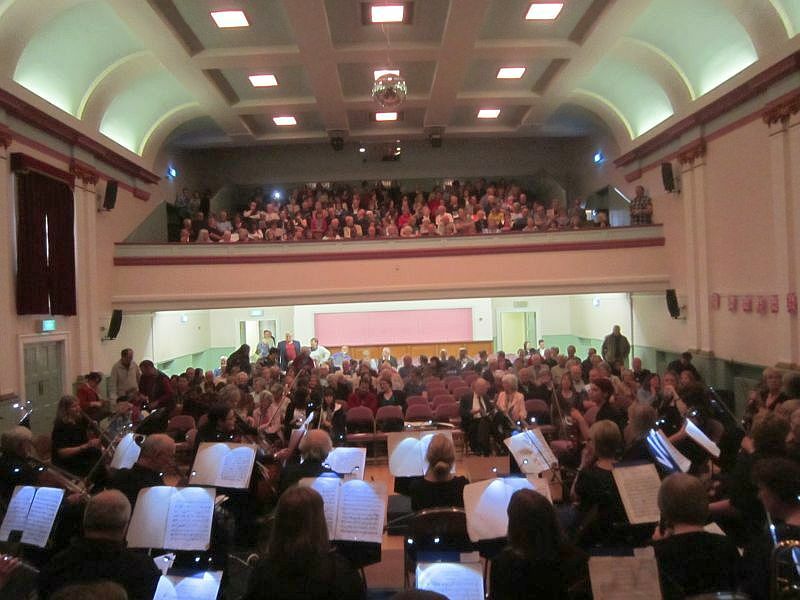 The Town Hall was almost full and with a combined force of 80 in the orchestra and choir it was a night to remember. The two Union Jacks at the back of the stage, made a striking backdrop to the performance and not a few tartan and Scottish flags brought by Elgar aficionados in the audience helped with the atmosphere. Elgar’s Cockaigne Overture started the evening. It is a piece which certainly tested all the musicians. It aimed to give a vision of London in 1900, a city bustling with activity and effort. The music reflected this and was an item which merited a longer study to get all its meanings. However the highlight of the first half was The Sea Pictures for mezzo soprano and orchestra (leader - Nicola Auchnie). This set of five songs about the sea was beautifully performed by Heather Ireson whose intonation and feeling for the music was remarkable. The poems painted wonderful visions of the sea and its impact on those contemplating it. Savage in places they also told of great love and longing. Indeed Heather’s rendition of Where Corals Lie, was evocative of the great Dame Janet Baker such was the emotion she generated. With some excellent playing by the orchestra, the quality of the performance was often well equal to that of a professional recording. The Music Makers, an extended single movement of Arthur O’Shaugnessy’s ode featured in the second half. Although a challenging work, it was performed with flair by the Choral Society choir and orchestra with Heather Ireson again featuring in the final section. Elgar connoisseurs would have enjoyed the references to Nimrod from The Enigma Variations and The Devil’s Chorus from The Dream of Gerontius. For those less familiar with either the poem or the music then there could be some reservations. For the alto section of the choir which often unfairly gets overlooked because of the drama generated by the other parts, this was a really well performed item. The sopranos more than held their own. The basses and tenors did very well in the more dramatic sections but just occasionally were a little indistinct. This would have been a problem for those in the audience whose hearing was not the greatest. This thoroughly enjoyable evening was brought appropriately to a close by Pomp and Circumstance Number 1. Paul Tierney led everyone in the hall in the Land of Hope and Glory chorus, so well known from the last night of the Proms. The audience in Inverurie more than matched those at London’s Albert Hall in their enthusiastic participation. As the photo beneath shows, they had a great time. Well done to you all. Thanks Patty for the picture. It turned out the right way after all!! 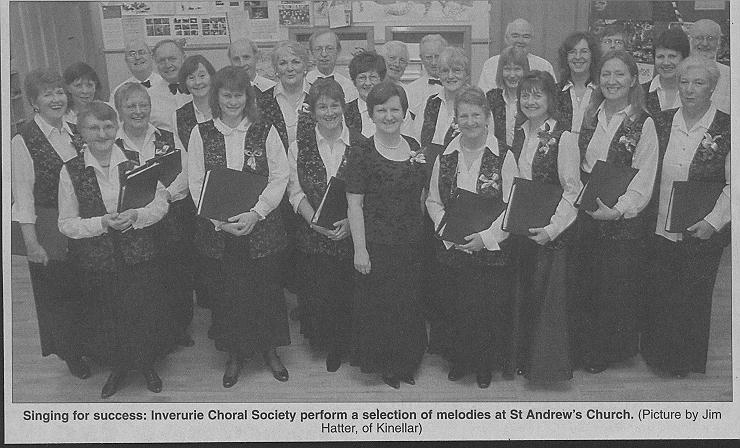 Inverurie Choral Society was one of four choirs to take part in the 2013 Aberdeenshire Singing Festival. The Festival returned to the Gordon Schools in Huntly where it has been staged three times in the past and it is a popular venue. The Festival Musical Director was Dr John Hearne. 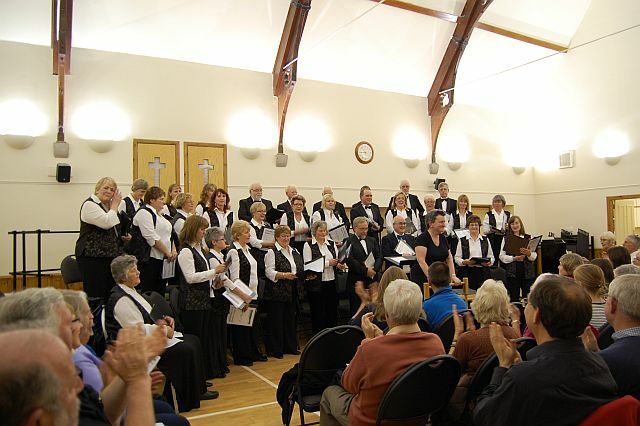 The other choirs were Peterhead Choral Society, Buckie Choral Union and Aberdeen Orpheus Choir. 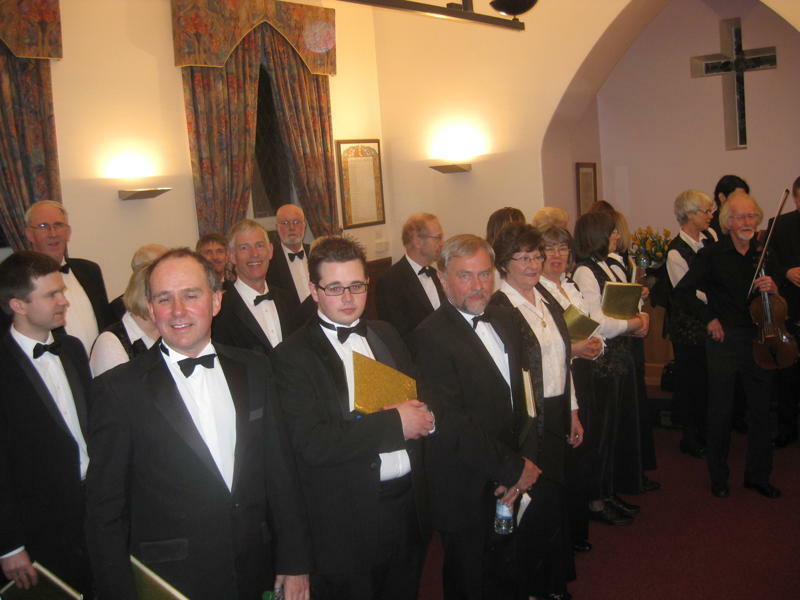 There were a number of individual entrants and they represented another three choirs. The format of the day is that all the choirs act as a single unit and they are rehearsed in several pieces by an invited guest conductor and many eminent individuals have undertaken the task. 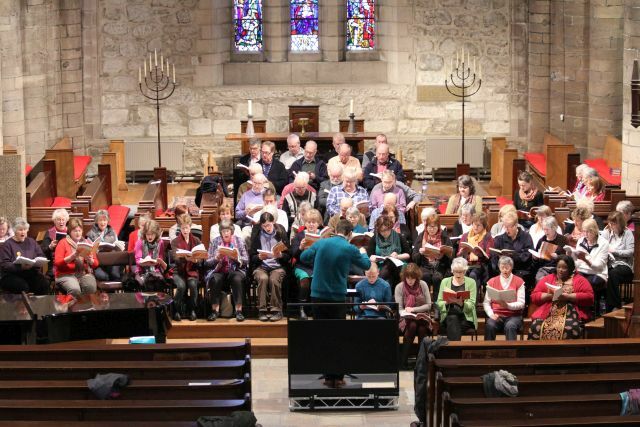 Then in the evening each of the choirs will perform something from their repertoire before the combined voices sing the items rehearsed in the afternoon. On this occasion Ralph Allwood was the guest Conductor. He spent 26 years as the Director of Music at Eton college and is well known for being a judge at many festivals and was one of the judges in the recent TV series in which Gareth Malone persuaded workers in prominent companies to sing in choirs. The music for the combined choirs were taken from Handel’s Messiah (Surely and Hallelujah) plus a traditional spiritual “Ev’ry time I feel the Spirit” arranged by Bob Chilcott. None of these are easy sings, but Ralph, who has a distinctive style, got through to all the singers, even the traditionally small numbers of tenors (a perennial problem in all choirs). The result in the concert was, if we are being honest, a bit mixed. The Handel works went well, but the spiritual needed a second go! Individually the choirs presented totally different offerings. 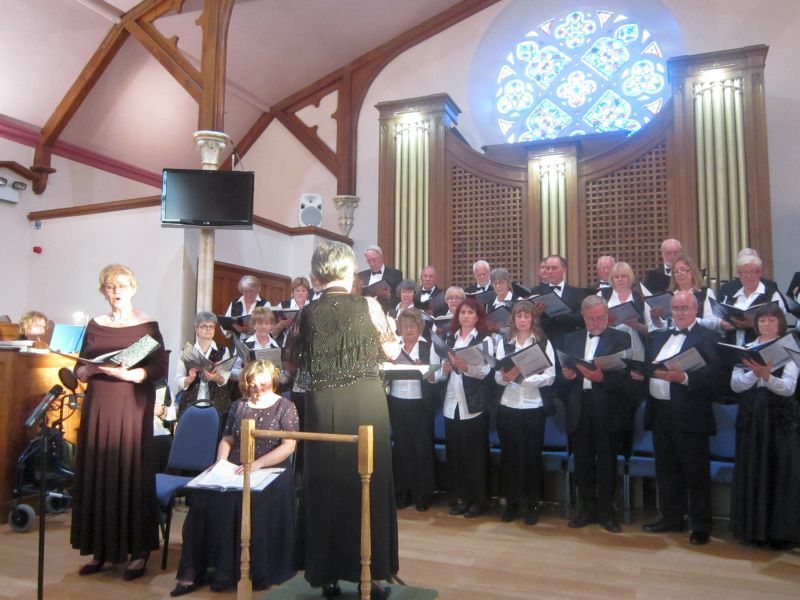 Peterhead, which is a choir establish in the 19th century, sang two traditional airs arranged by their director (Alistair MacDonald). They were The Bonnie Lass of Fyvie and Wild Mountain Thyme. They complemented these with Bruckner’s Locus Iste. The overall effect was pleasing. 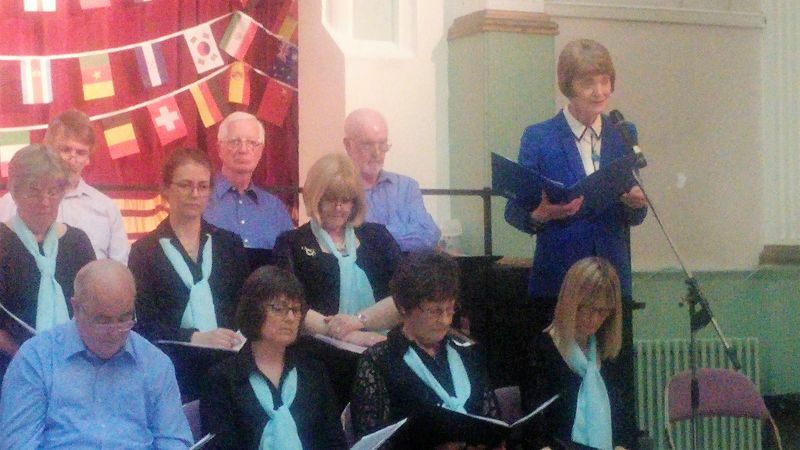 The Buckie Choral Union, which was all female was conducted by Anne Corbet and they sang three movements from Francisco Nunez’s ‘Misa Pequena” (Small Mass), in Spanish. They were taxing pieces and the singers’ efforts were very impressive. The Aberdeen Orpheus Choir is a big choir and both looked well and sang beautifully. 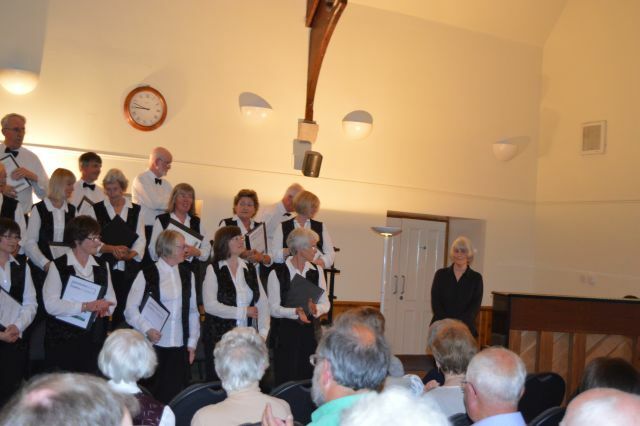 They had a considerable programme with traditional, modern, classical and Abba music and earned well deserved applause. 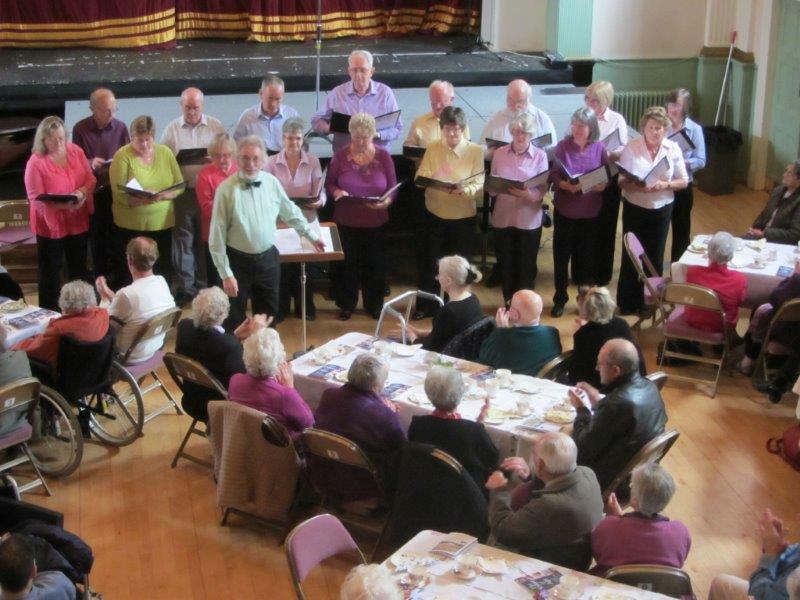 It fell to Inverurie Choral Society to start off the programme and they did so with a topical rendition of a Les Miserables medley. It was conducted by director Moira Hunter. Because of commitments and illness the choir was somewhat depleted. 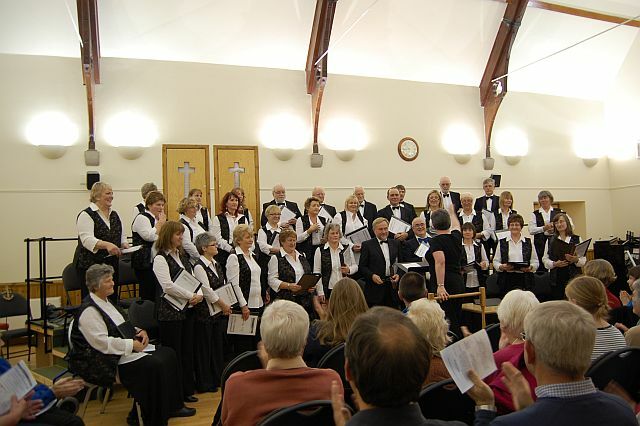 As the writer of this article was in the choir no opinion of how they came over is possible, but he can say that the choir was pleased with its performance and thoroughly enjoyed both the concert and the day. Please pass on my thanks to the Choral Society members who performed at the KA this evening. You had in the audience members of the Rotary Glee Club, and a musicians and they asked that I passed on to your society that the performance was absolutely right for the evening, and that you gave a wonderful performance. When I gave my final thanks, I said that since 1998 you surely had never given a better performance, it was a very sincere comment. 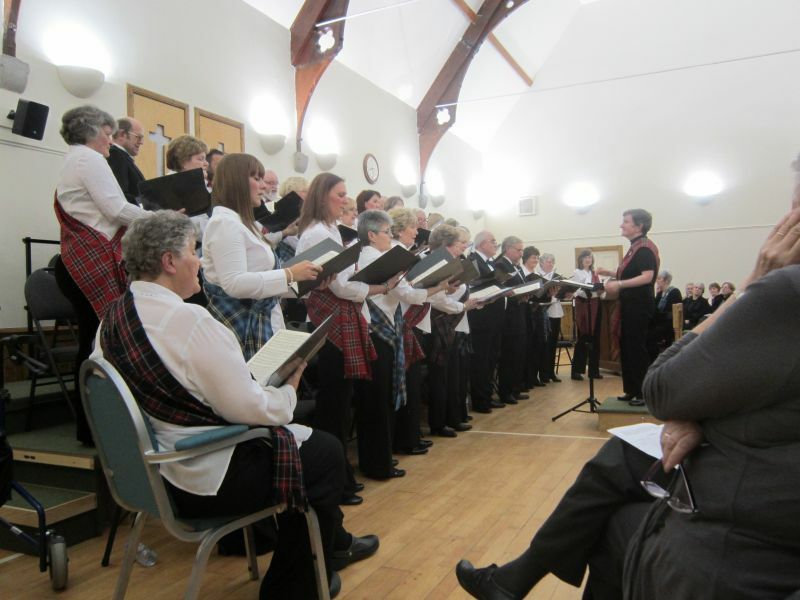 Inverurie Choral Society took to the stage again for the first time since June, on Saturday night 24th November at Kemnay Church Centre, performing traditional Scottish music in a production entitled "Auld Scotia's Shore". On a bitterly cold and frosty evening, revellers filled the Kemnay Church Centre car park and headed indoors into the church hall. It proved an excellent venue for such an event with its contemporary grandeur and high ceilings. Led by Moira Hunter and accompanied on piano, snare drum and fiddle, the choir dressed in dickie bow suits (men) and tartan sashes (ladies) respectively then set about entertaining the capacity hall with 'ole classics such as "My Luve is Like a Red, Red Rose" and doing a fine rendition of "O Whistle and I'll Come to You" before setting into a foot stamping version of "McPherson's Farewell". The latter sounded terrific with the hall's acoustics and came at you like a runaway train. Along with the piano music page-turner being in fine form, the first session concluded without as much as a hiccup. Interval came and went and we set into a more liquorice allsorts performance in the second half, including some fiddle music from Louise Jolly. Even though she may not agree she gave a very fine performance proving to be quite the crowd favourite. Doric poem recitals by Anne Kelly were a worthy inclusion with a very humorous poetic anecdote told about Granny's Bucket. The choir stood up tall again to polish off the evening the with two quick fire numbers concluding a chirpy "The Dashing White Sergeant". As the clock climbed its way up to nine o'clock above the heads of the bass singers on the back wall, it was time to indulge in a cup of tea before facing reality and heading out into the starry night to discover whether the car would start first time, or not! The long standing Inverurie Choral Society’s bi-annual concerts have taken a turn to baroque with their recent concert on Saturday 26th May at the Acorn Centre, Inverurie.. A Baroque Evening was conducted by Moira Hunter and the Society undertook a challenging programme consisting of a first half of Giovanni Battista Pergolesi’s delightful Magnificat and then selection of numbers from Purcell’s Dido and Aeneas followed by a second half of Vivaldi’s Gloria in its entirety. 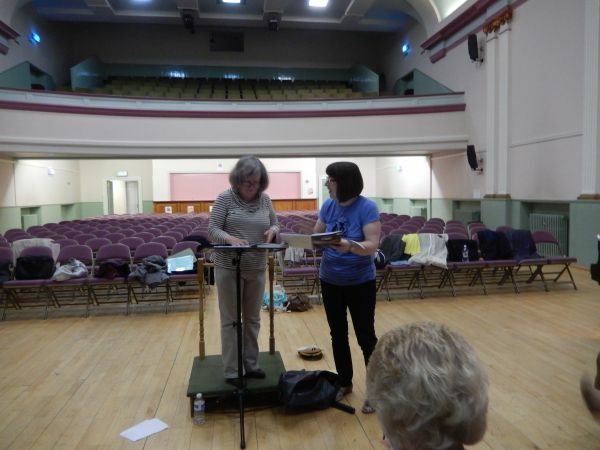 Soloists were Carole Sim Sayce (Soprano) and Eileen Robertson (Contra. Alto) and Organ accompaniment was provided by Ed Jones. GB Pergolesi does not have nearly the same reputation as Purcell or Vivaldi. In fact I had never heard any of his works before the performance and so I went to the Baroque evening looking forward to a good introduction into a lesser known composer’s works. And a good Introduction it was indeed. The choir had obviously practiced the piece well and should be very proud of themselves for not only a good performance but also introducing a number of people to the music of Pergolesi. The Magnificat really worked well with the atmosphere of the Acorn Centre. Being a beautiful day the sun was low in the sky and cast long shadows over the seating. If it was not for the modern surrounding one could have been in the 18th century. 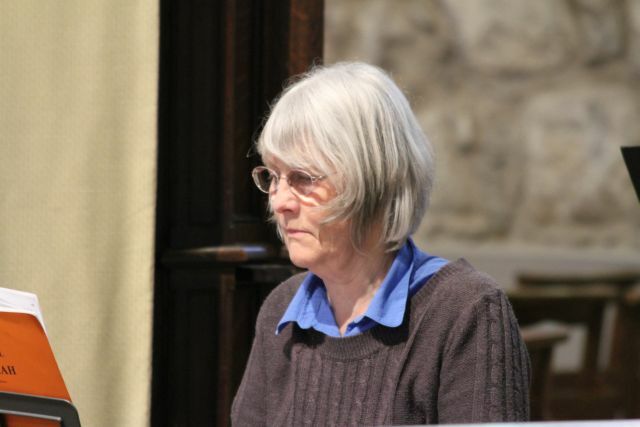 Carole Sim Sayce performed her solo sections well with beautiful dictation. Unfortunately, it did not prove to be Eileen Robertson’s day as she encountered problems which continued through the performance. A further Pergolesi Piece was performed being Se tu m'ami performed by Soprano Soloist Carole Sim Sayce. This was again a strong performance of a moving composition. A selection of compositions from Purcell’s Dido and Aeneas provided a more familiar footing for the audience. The chosen numbers were; In a Deep Vaulted Cell (a chorus which appears at the end of the first act of the opera), When I Am Laid in Earth (a lament sung by Dido), and With Drooping Wings (a chorus which echoes the chromaticism found in Dido’s previous lament). The pieces were on the whole well performed and very well received. The Choirs sombre interpretation of ‘With Drooping Wings’ made for a thoughtful end to the first half. Vivaldi’s instantly recognisable Gloria served as the finale for the evening. Despite a slow start to the piece the choir quickly regained their footing and showed that they were able to perform not only well but with an expressive and impressive dynamic range. Carole Sim Sayce and Eileen Robertson’s duet in the ‘Laudamus Te’ section was delightful and the beauty of the counterpoint was quite invigorating. Throughout the composition the delicacy of the counter point was well contrasted with the grandeur of the choir. This was particularly obvious in Domine Deus, Agnus Dei where the soloist takes the driving seat and works an antiphonal texture between themselves and the choir. 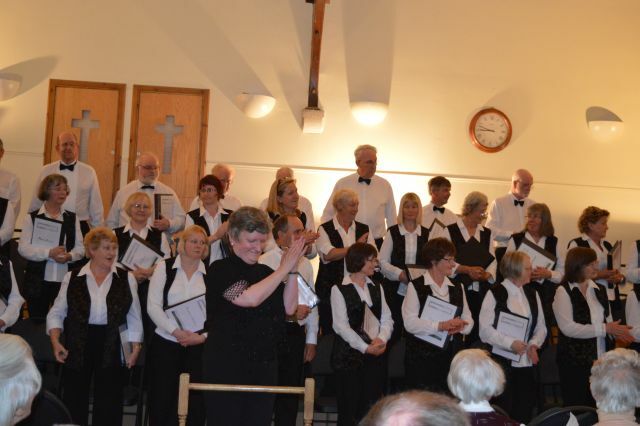 The night was a success and I am sure that everyone can agree that the choir performed admirably, with much praise being given to Moira Hunter for the strong directions which is so obviously provided to the choir. 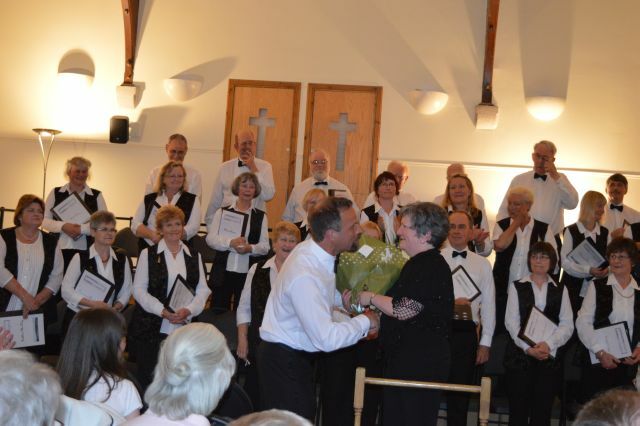 May the concerts provided by the Inverurie Choral Society continue to be as good as this one! 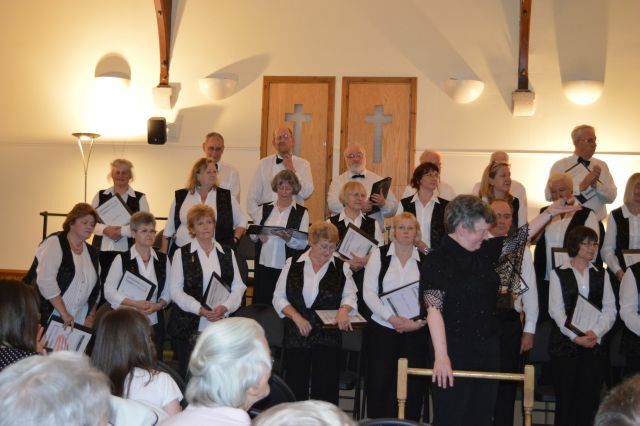 Inverurie Choral Society had a couple of firsts when they presented their charity concert “Something for Everyone” in aid of Monty’s Maggie Appeal, Aberdeen at the Kirk Centre Kemnay on Saturday 29 October. 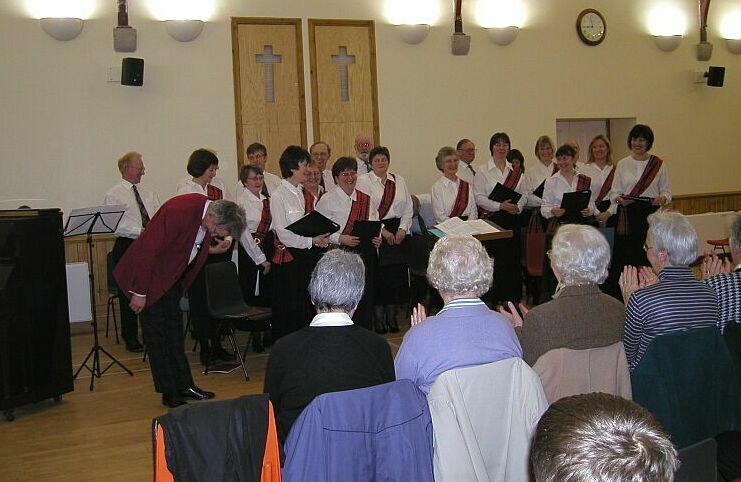 Their recently purchased setting was given its first airing and proved to be a great success in both its ease in being set up and the ability it gave to both the members of the choir who were all able to see their conductor Moira Hunter clearly and thereby able to follow her instructions and allowed the audience to view the choir in total. The first choice was also a first performance. “In Windsor Forest” by Vaughan Williams had been adapted for the opera “Sir John in Love”. Five pieces were chosen with the sopranos and altos starting off with ˜The Conspiracy” (Sigh no more, Ladies). Not the easiest piece to open with and the ladies worked really hard. The tenors and basses had an easier time with “Drinking Song” (Back and side go bare) and by the third item “Falstaff and the Fairies” (Round about in a fair ring-a) the choir had begun to relax a bit especially with the “oooooh” giving all present goose bumps with the ghostly sound. The soprano soloist was excellent and the tricky “pinch him” was tackled very well. “Wedding Chorus” (See the chariot at hand) required great concentration and the choir lost its way a little but the soft ending was very good. The final “Epilogue” (Whether men do laugh or weep) was an extremely difficult piece and praise must be given for the attempt made. Benjamin Britten’s “The Evening Primrose”, which followed, was complicated and tackled well while ˜All things Bright and Beautiful” arranged by John Rutter was a real joy to listen to. It was excellent. The first half ended with ˜Sanctus” from “The Armed Man” by Karl Jenkins. The choir has performed this in the past and the confidence they felt with the piece showed in the way they presented it. It made a very profound impression with the sharpness and clarity of the notes. 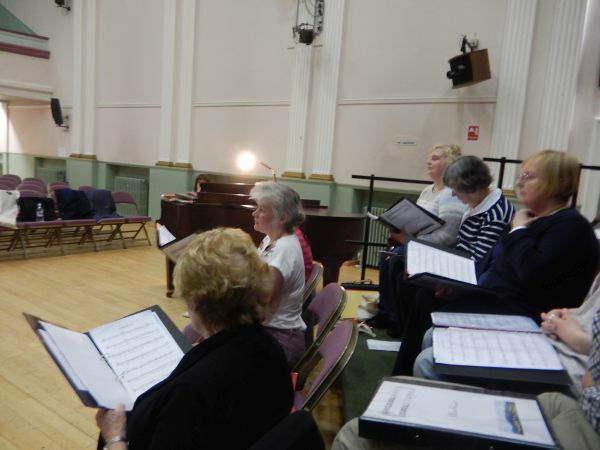 After the break the choir enjoyed themselves with the “Ascot Gavotte” from My Fair Lady and “Call Me Madam” “You’re Just In love” before a “Mini Trip Round Scotland”. This took us from the Clyde, through a haunting Glencoe, then with the ladies to the Back o’ Bennachie where the Gaddie Rins before ending up en masse in Kirkwall Bay . The concert ended with medley from “Les Miserables”. The haunting “I dreamed a dream” (well tackled by the altos who were much fewer in numbers than the sopranos who seem to get all the best airs) led on to “Castle on a Cloud” - a nicely rounded sound. The basses started ”Do you hear the people sing” beautifully with the tenors excellently following them. “On my own” was perfect. “God on high hear my prayer” struggled a little but “Take my hand” and the final “Do you hear the people sing” were awe inspiring and left the audience on a high. 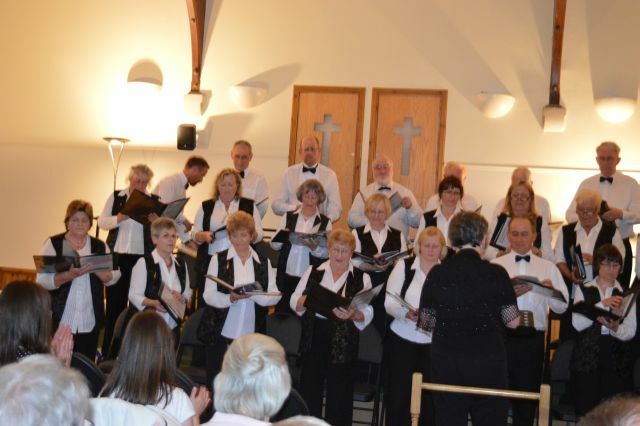 It was an excellent evening’s entertainment and praise must be given to a choir which is prepared to tackle such difficult and demanding new works. The highlight of the evening for me was “All things Bright and Beautiful”. I think this was their first public performance of Rutter's difficult hymn, which is delightful and light if sung well, as it was this evening, but discordant if not spot on. This was the first time that we were able to use our new staging - and good it looks too. Thanks to John Smith and Douglas Harper who forwarded me these photo's. 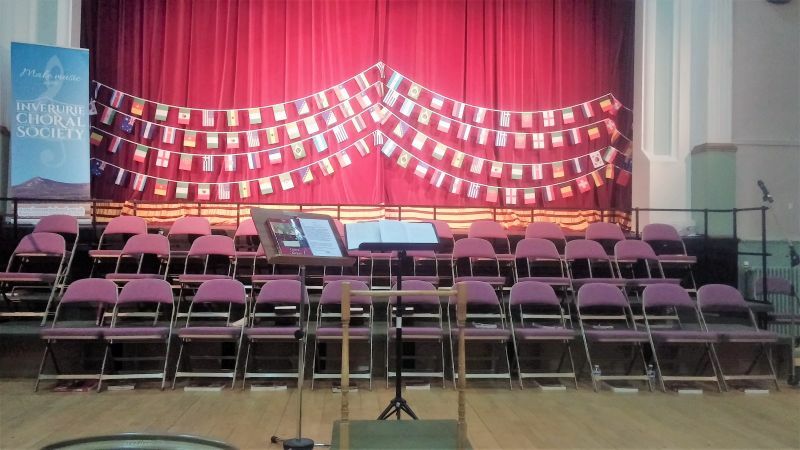 On Saturday 4 June Inverurie Choral Society presented its summer concert – Songs from the Shows – to a large audience in the hall at Inverurie Academy. The programme started with a selection of Rodgers and Hammerstein on Broadway (including Carousel, South Pacific Oklahoma Call Me Madam) before going on with Boys from Syracuse, Miss Saigon and West Side Story. After a rather shaky start with ‘The Hills are Alive to the Sound of Music’( not an easy song to sing at the best of times), through ‘Oh what a beautiful morning’ the choir began to feel its feet with the ladies spirited ‘I’m gonna wash that man right out of my hair’ and the gents robust ‘There is nothin’ like a dame’. ‘When I Marry Mister Snow’ introduced us to Anna Hamilton (soprano) while Michael Barrie (tenor) started with ‘Some Enchanted Evening’. Together they enchanted with ‘People will say we’re in love’, their voices harmonising beautifully. The choir’s ‘You’re just in love’ from Call Me Madam was tackled more confidently with the sopranos and contraltos counteracting the tenors and bases with verve. Anna returned with ‘Falling in Love with Love’ from Boys from Syracuse and she and Michael wowed with ‘Sun and Moon’ from Miss Saigon before the West Side Story selection opened by Michael with a heartfelt ‘Maria’. The choir followed with ‘Tonight’, ‘I Feel Pretty’ giving the sopranos and contraltos the chance to shine before tackling ‘One Hand One Heart’. The final number ‘America’ calls from precise entries and very good diction to work, and the choir made a very good go of it with the bases countering the sopranos and the tenors having responding to the altos. After the interval a much more confident choir returned to the stage with a selection from My Fair Lady through Forty Second Street and a delightful duet from Anna and Michael of ‘All I Ask of You’ from Phantom of the Opera. Then came the show stopping numbers from Les Miserables. It was as if the choir had suddenly believed that they really could sing and felt confident enough to relax and enjoy themselves. ‘At The End of the Day’ led on to an excellent ‘I Dreamed a Dream’ which was followed by ‘Castle on a Cloud’ and almost topped by ‘Do You Hear the People Sing’. The plaintive solos ‘On My Own’ (Anna) and ‘Bring Him Home’ (Michael) almost brought tears to the eyes but the reprise ‘Do You Hear The People Sing’ was a heart stopper and sent both the choir and the audience home on an emotional high. Director Moira Hunter must have been delighted with the performance and it was good to see her back in charge. Christine Moore’s excellent accompaniment at the piano allowed the choir to shine. I write to thank you for your kind donation of £1,016.74 received as a result of the money raised from the performance of Karl Jenkins 'The Armed Man' by the Inverurie Choral Society on the 8th November. This is a very generous gift from which our Veterans shall benefit. I would be most grateful if you could pass on our thanks to all members of the Choral Society. Thank you so much for your support. As I know you are aware, Combat Stress is increasingly reliant on volunteer fundraising in order to maintain the unique service we provide to ex-Service men and women who have been psychologically injured through active service. Over the last four years we have seen a 66% increase in the number of new Veterans seeking our help. On average, Veterans come to us fourteen years after leaving the Armed Services. Many are in a desperate situation and many have started to self-medicate with alcohol and/or drugs. We are concerned about the level of future demand from those involved in recent operations in Iraq and Afghanistan - this potentially huge growth in new Veterans is likely to swamp our already modest resources. So, thank you so much for helping to make our work possible. Your continued support really will make a difference to the help we can offer a particularly needful - but often overlooked - group of Veterans as they rebuild their lives. Robert Burns really did have it right when he averred that the best made plans of mice and men gang aft agley. When, in the balmy days of summer, Aberdeen City Council invited the Inverurie Choral Society to join the Bon Accord Silver Band in two Christmas afternoon concerts in the Winter Gardens nobody thought of snow. Well, why would one? 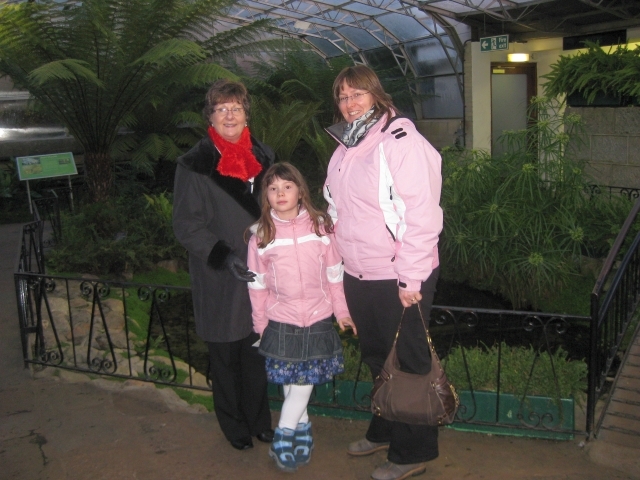 After all, the event would be held inside the great glasshouse which houses a myriad of healthy looking plants. But, the participants still have to get there. Both groups have members scattered about the city and shire. Two of those furthest from the venue were Adrian Law and John Smith of Turriff. Both gentlemen had agreed to set out by car at the back of 11am to get to Duthie Park in time. That, as it happened was the exact time when the snow recommenced. The prospect of an accident or simply getting stuck in the snow was not enticing so the virtue of getting the bus to Aberdeen become very attractive. It was the right decision for they passed one accident and the road was very tricky. Furthermore they thanked goodness for old age bus passes! As they arrived at the venue the singing and band music could be heard from outside the winter gardens and the two tenors found that they were in company as the tuba player for the Bon Accord was also struggling in with his instrument. To the amusement of the audience all three squeezed into their places and joined in the concert. The Bon Accord band is the premier brass/silver band in Scotland and they were proud to note that they will be competing in Vienna in 2010 for a world championship and representing the nation. They will be facing, amongst others, the famous Black Dyke Mills Band from England. On Bon Accord’s performance today they will certainly give a good account of themselves. 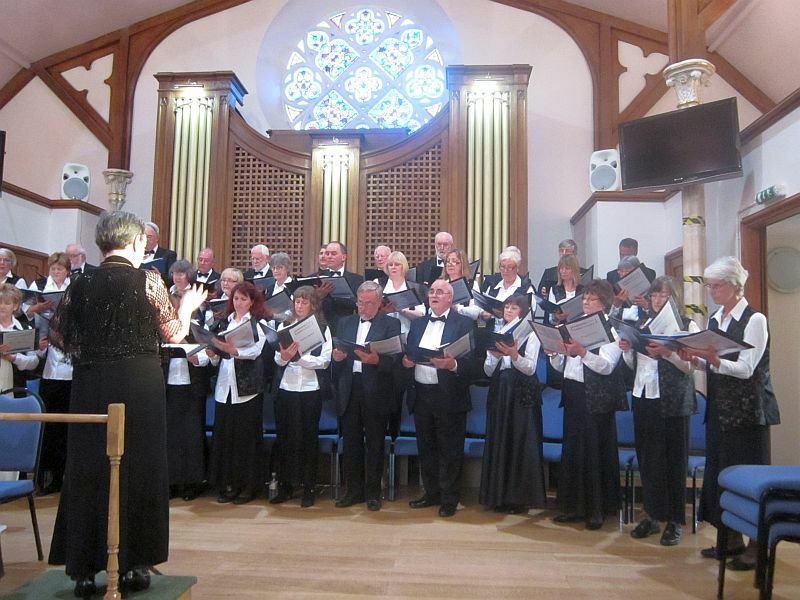 The songs that they accompanied the Inverurie Choral Society under the baton of Paul Tierney included John Taverner’s The Lamb and the traditional medieval song Adam Lay Ybounden. A number of the popular and regular carols were also sung. 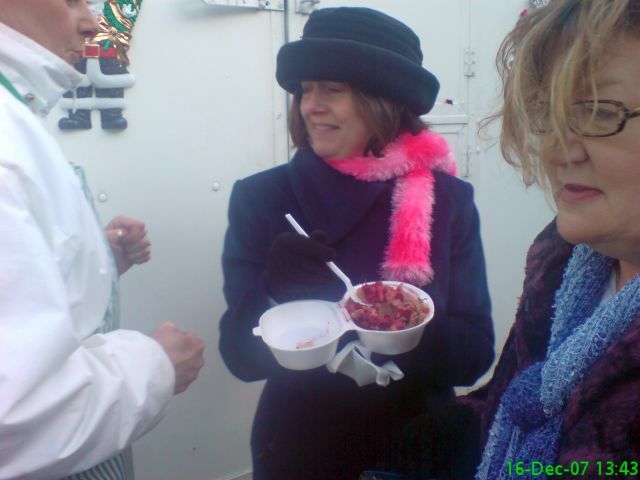 Of course, having a good number of the public attending the event meant that ICS and the whole audience took part in quite a few community carols, as well as Christmas hits from Slade and others – which continue to find favour with the populace. It is for others to judge whether the singing was perfect but as an event it certainly worked for the Choir and Band. The cold seats we sat on and the granite floors which froze our feet as we stood to sing simply meant that the mulled wine and mince pies laid on by Aberdeen City Council were even more appreciated. 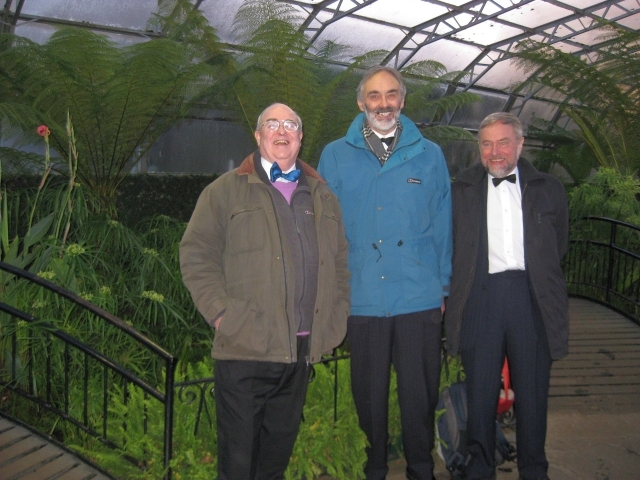 It was good fun, and even though the snow was fair pelting down as we left the Winter Gardens it seemed just right and appropriate. 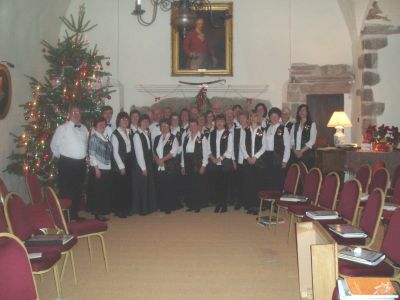 Inverurie Choral Society commenced their annual seasonal outings with a choral concert at Castle Fraser on Tuesday 8th of December 2009. 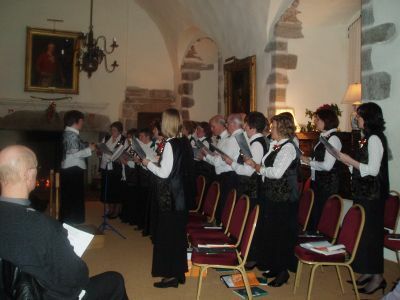 In conjunction with the National Trust for Scotland (NTS), the society has performed at the old castle for the past five or six years and it has become a popular event for the choir. 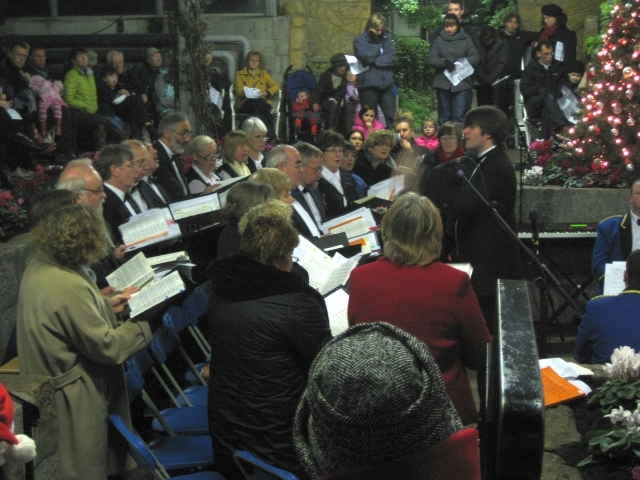 This year, under their current Musical Director Paul Tierney, the programme consisted of many of the regular and popular carols. The choral society has always traditionally included a couple of new items in their Christmas concert line up and Paul had suggested two special pieces. The first by the well known English composer John Taverner who based it on William Blake’s poem, "The Lamb", and an American carol by the composer, Morten Lauridsen, called "O Magnum Mysterium". Neither are particularly easy, but regular singers are usually up for a challenge and plainly some homework had had to be undertaken outwith the usual rehearsals. Singing at Castle Fraser has its moments. Firstly the choir were accompanied on a piano seemingly as ancient as it surroundings, and which had, to put it delicately, lost some of its original sharpness. Secondly the log fire which warms the Great Hall where the Choral Society performed and is highly popular with visitors can plays havoc with ones vocal chords. And, finally to create the right Victorian ambience the lighting is dimmed, which gives a new slant on the concept of musical sight reading! Nevertheless, the choir members thoroughly enjoyed themselves and, as one of the singers myself, I believe I can say that Inverurie Choral acquitted itself reasonably well. They were rewarded by being able to join the paying audience to mulled wine and mince pies in the elegant drawing room adjacent to the Great Hall courtesy of the NTS. 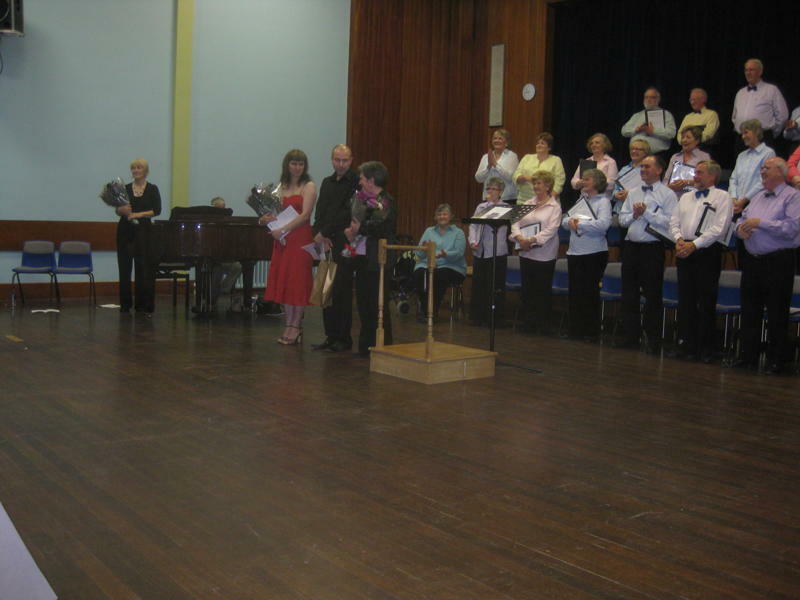 A good sized audience was with me at a special performance of Karl Jenkins’ millennium commission “The Armed Man: A Mass for Peace” at the Acorn Centre, Inverurie on Remembrance Sunday 8th November 2009. It was a performance which conveyed the horror of war and the effects it has on people, not least the combatants. The opening was menacing. The beat of a drum builds up the atmosphere in its insistence and is joined by organ and trumpets, and eventually the whole ensemble in proclaiming the menacing advance of the army. Then suddenly and incongruently we hear the call to prayers in Arabic as from the muezzin in a mosque (a particularly strange sound in a Scottish Presbyterian Church). This is followed by the Kyrie sung beautifully by Heather Ireson (Mezzo soprano) and the chorus. Then the male members of the choir sang, a cappella, a Gregorian chant “Save me from Bloody Men”. Without the support of the orchestra I have to admit that valiant though their efforts were, and the sound by the men was impressive, there was a certain raggedness in couple their entries. Not so the singing of the Sanctus. Haunting at first, it rose to an exultant Hosanna, before subsiding to a tranquil finale. This led to a prayer by the combatants for strength to die. The next three sections drew from a number of classical sources including the Indian Mahabharata and Japanese writings, all of which dramatically expose the sheer horror and ugliness of war in all its forms. The music and singing here was, powerful, deeply emotional and often deliberately discordant There followed a serene Agnus Dei, and a plaintive poem by a survivor , then a beautiful Benedictus ( though here again the emotions seem to have got to the singers for the opening was a little shaky.) Finally a glorious proclamation that “Better is Peace than Evermore War”, which was confidently sung. It was a sentiment that is unarguable. This was a great evening. The mass was sung in a wonderful venue. I felt surrounded by sound in an intimate space. The singing overall was strong and sure, reflecting the powerful nature of the work and the obvious efforts in rehearsal. The small orchestra (Mike King and Julian Slater; trumpet, Michelle Boardman and Joe Whiteman; Percussion, and Ed Jones; Cello), and organ in the expressive hands of George Chittenden, added depth and a further dimension to a great piece. The Inverurie Choral Society and Paul Tierney will have a lot to be pleased about in the way they worked this evening. “I thoroughly enjoyed your concert on Saturday evening. I really liked the French programme and in particular Cantique de Jean Racine was beautifully performed. The Requiem is a much more challenging work to sing than people think with quite a number of exposed passages, especially for the tenors! 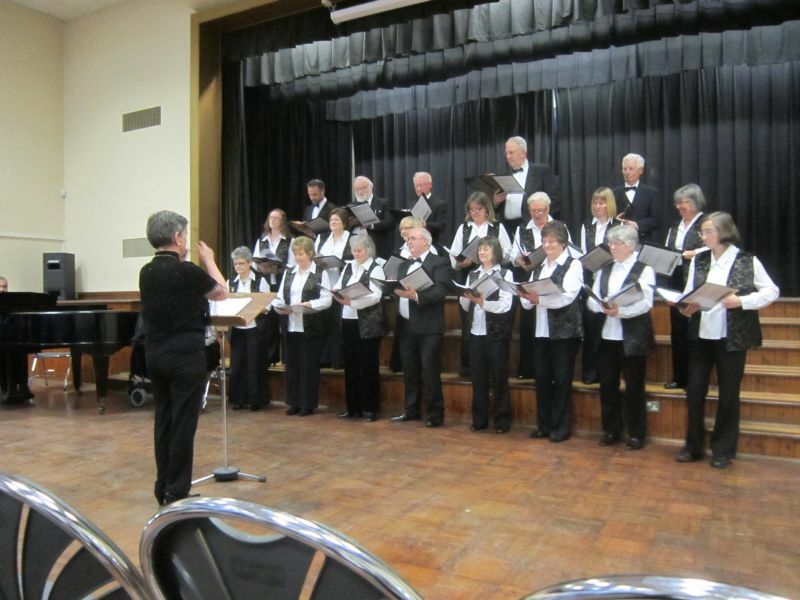 They did well with such small numbers and the choir pulled a difficult work off successfully – well done! Your soloists were very good and Moira does a wonderful job with complete control over the performance and very precise, expressive conducting. Quite by chance I was fortunate enough to attend an Evening of Christmas Music performed by members of the Inverurie Choral Society on Wednesday 17th December at the Acorn Centre, Inverurie West Church. There was a good sized audience but sadly few young folk. Musical Director Moira Hunter conducted the choir with great vigour and enthusiasm keen to get the best out of the singers. The soloists for the evening were Claire Bleasdale (alto) who had a lovely rounded mellow tone and Colin Brockie (bass) who had a clear and very confident voice. It was a well balanced programme with the first half being excerpts form Bach’s Weihnactsoratorium (BVM 248) followed after the interval by a selection of traditional carols. I felt the choir were just a little uncertain in the first chorus of the oratorio and not quite gelling. Perhaps they were not quite warmed up, but after that all was well. The choruses and chorales sung by the choir were interspersed by arias and recitatives from each of the soloists. Claire started with Prepare Thyself, Zion confidently and with the right power. I was, and I suspect others in the audience were also, very impressed with the almost casual and quite beautiful singing of the young bass, Colin. He started with Mighty Lord, Strongest King. It was seemingly effortless, clear and though the words in old German may not have been easily translated, they were sung with superb clarity and diction. Many of the carols were familiar but it was pleasing to hear some new to me. I especially liked the ladies of the choir singing Willock’s “How Far Is It to Bethlehem”. It was sung with a lovely smooth and gentle tone. I liked Claire’s rendition of Madonna and Child and it was pleasure to hear Colin singing “O Holy Night” a popular song. We in the audience were invited to sing a couple of carols and I can report that they were sung with obvious enjoyment. In the Grand Hall, we entertained an audience with a combination of Carols and a couple of pieces from the Bach's Christmas Oratorio which will be sung in our forthcoming Christmas Concert, "An Evening of Christmas Music", on 17th December 2009 at the Acorn Centre, Inverurie at 7.30 pm. Although we had 3 call offs at short notice due to this "bug" that seems to be doing the rounds at the moment, the choir gave their best with a pleasant selection of musical pieces. Moira was struggling with a croaky voice sadly was unable to vocally assist us as she usually does. After the concert, which seemed to be well received, the NTS provided mulled wine and minced pies to all who attended the concert. 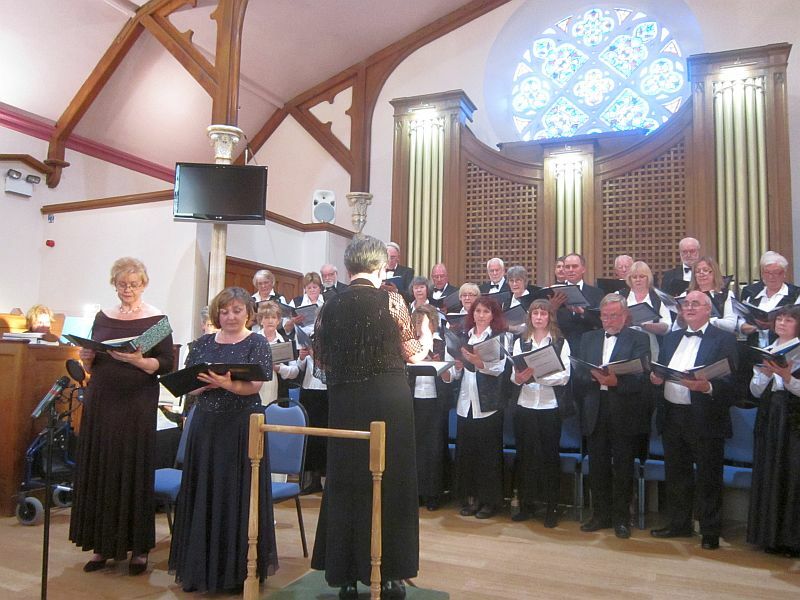 Inverurie Choral Society celebrated its 10th Anniversary with a concert containing pieces old and new. 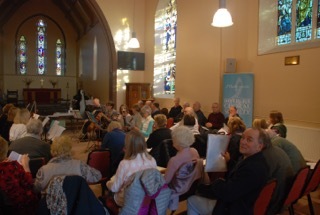 The Town Hall was full to hear the Magnificat by John Rutter, the premiere of Bennachie by John Hearne and a selection of other pieces performed by the choir, with Gillian Jack (soprano) and Blair Cargill (piano). John Rutter is well known as a choral composer. This setting of the Magnificat dates from 1990 and contains movements of contrasting styles. In this performance, the more reflective movements, some with the soprano soloist, sounded better than the more robust movements. John Hearne, a renowned composer, lives locally and his setting of words by James S Wood was a 10th Anniversary commission by the Society. The poem Bennachie is a reflection on the writer’s love of and involvement with the hill immediately by Inverurie. The choir obviously enjoyed singing the deceptively simple melodies and rhythms, which sometimes seemed to be a musical alliteration to the words. It finished with a gloriously majestic ending to match the scenery. Dr Woods’ relatives, some present in the audience, must have enjoyed this performance. It was imaginatively prefaced with the O gin I were where Gadie rins in the arrangement by Tom Johnston. The rest of the concert consisted of pieces selected from the last ten years of performances. 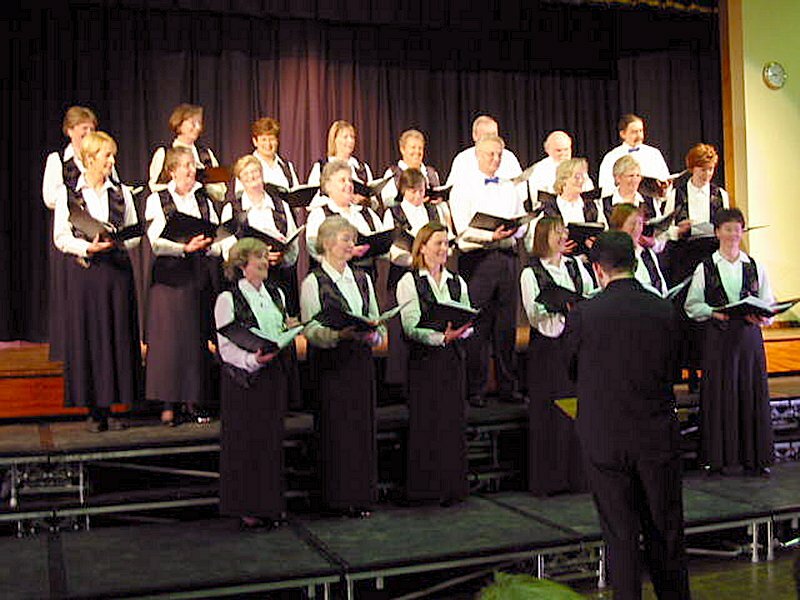 These demonstrated the impressive range of the choir, singing in several languages and also unaccompanied, from the well-known setting of Ave Verum Corpus by Mozart and an excerpt from The Armed Man – A Mass for Peace by Karl Jenkins to a vocal version of Finlandia by Jean Sibelius and the popular number, Vilia from The Merry Widow by Franz Lehar. The audience had to sing for its supper as well – in an infectious arrangement of a Russian song, Kaleenka, by the conductor, Moira Hunter! The evening was an enjoyable success, even if the choir was occasionally stretched by some of the difficult technical demands of the Magnificat. People left the hall humming the many beautiful melodies performed for us. 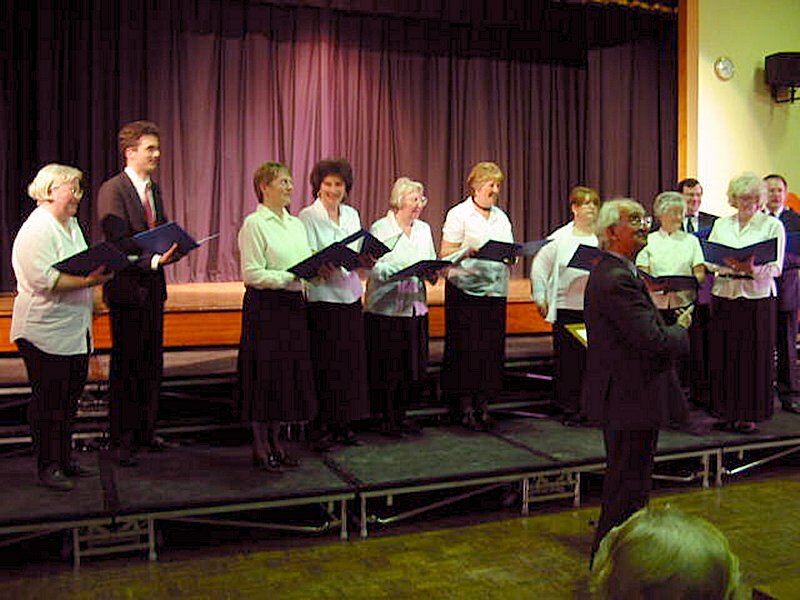 A total of eight choirs took part in the 2008 Aberdeenshire Singing Festival which was held this year at Mackie Academy in Stonehaven. 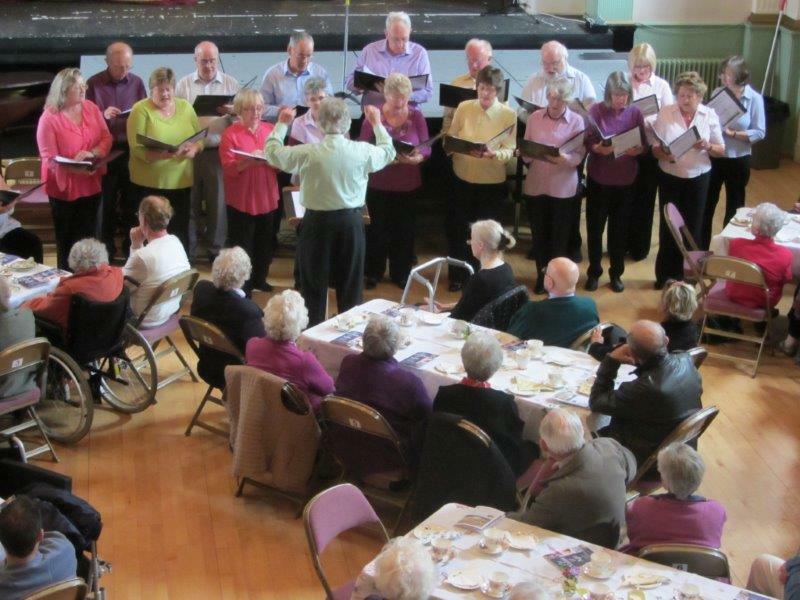 Inverurie Choral Society, The Spectrum Singers of Kemnay, and Peterhead Choral Society represented the Northern area. 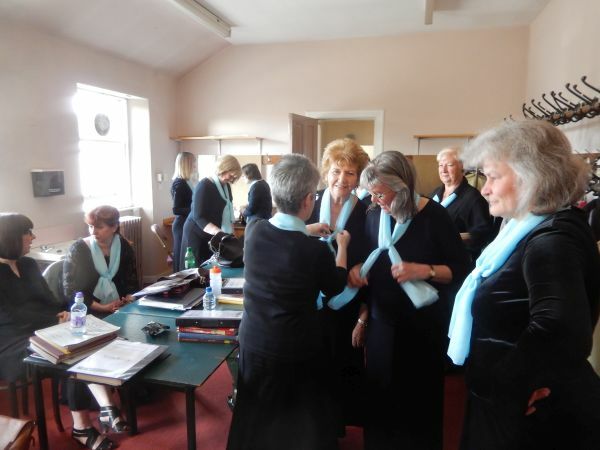 Other choirs came from Stonehaven itself, Aberdeen and Deeside. This annual event celebrated its twentieth anniversary on this occasion and by popular acclaim the guest conductor was Mike Brewer who is the Director of the National Youth Choirs of Great Britain. Mike is a very busy chap and before getting up on the rostrum to lead a master class of the eight choirs, he had literally just flown in from Australia just twenty-four hours previously and still found time to take a class at Cults Academy on the Friday. Again to considerable appreciation. The afternoon took the form of a master class by Mike at which we all sang two chorales from Bach’s St Matthew Passion, Awake the Harp from Haydn’s Creation and a vigorous and exciting introduction to an African chorus of Hamba Lulu. To get a couple of hundred, eager yet slightly nervous North East singers to throw away their reserve and really immerse themselves into the latter was a feat in itself. A feat truly accomplished. 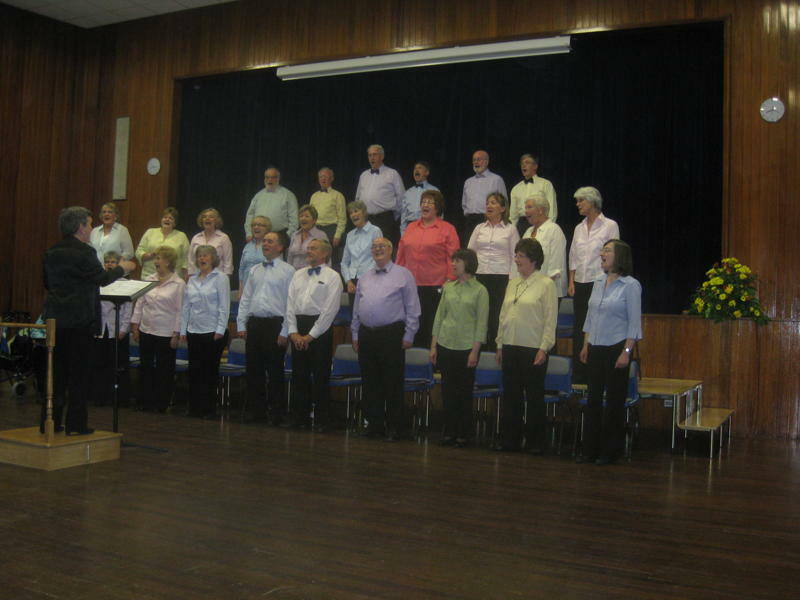 In the evening we had the concert which included the rehearsed items plus the party pieces from each of the choirs. The range of music was eclectic. 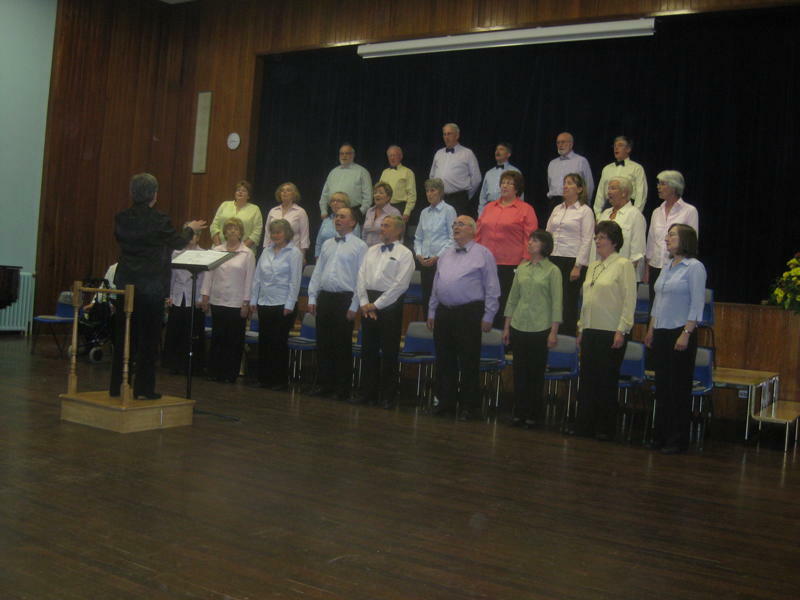 Abba numbers (Banchory Singers) rubbed shoulders with Barbershop (Granite City Chorus). 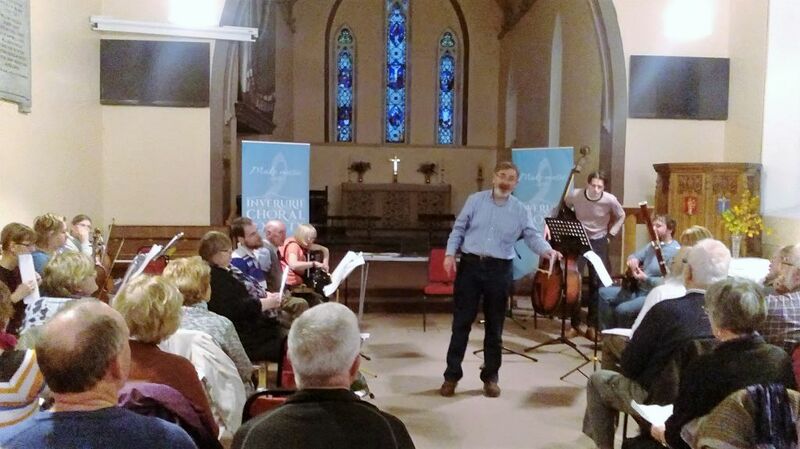 Stonehaven impressed with Ave Maria in Russian by Rachmaninov as well as Onward Christian Soldiers (in Welsh!). A formerly all female group The Linties from Tarland who now admit men sang Italian, African and Robert Burns numbers! 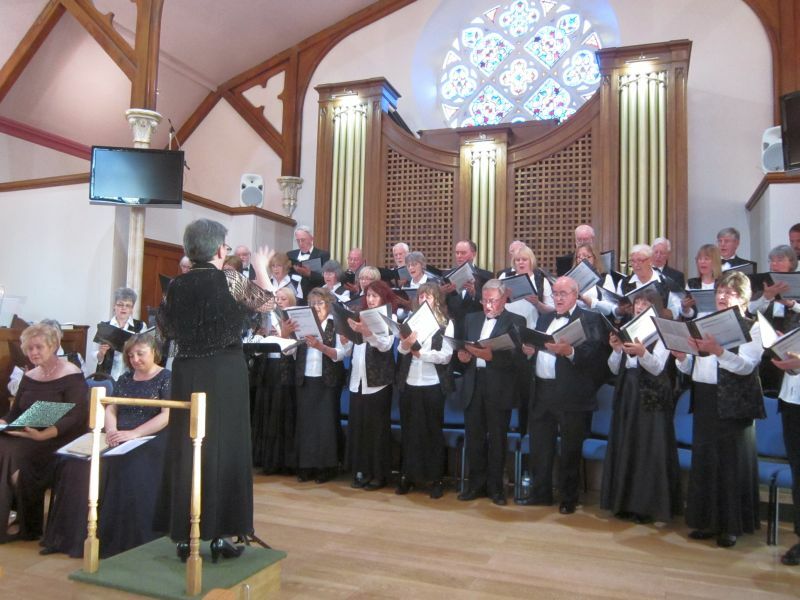 Peterhead, a choir established for over 100 years entertained with madrigals and traditional Scottish airs. It fell to the newest choir the Spectrum Singers to impress with an interesting variation of Mozart’s Ave Verum Corpus and Alshlosha D’Varim from the Jewish Morality tales. This group is based at the Community centre in Kemnay and is in their second year. 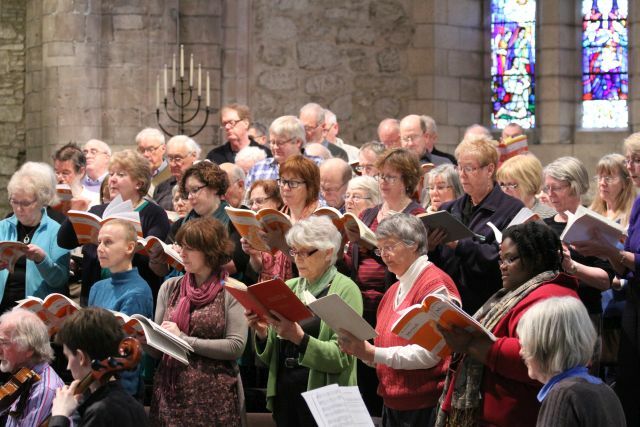 For us in the Inverurie Choral Society which celebrates ten years in June, we opened with The Hymn Before Action from Karl Jenkins, a really rousing piece, before tackling Magnificat Anima Mea from John Rutter’s Magnificat. I personally hoped that we succeeded in engaging the audience of our peers but I know most of our members were nervous with this item. Choirs which sing to each other know that every other person in the audience is a potential critic. Anyway our Conductor Moira Hunter plainly knew what she was doing when she included the Russian song Kaleenka as our final piece. It was a real foot-stomper and everyone joined in to our relief. Dr John Hearne, the musical director of the Festival would, we feel sure, have been pleased at the whole event. 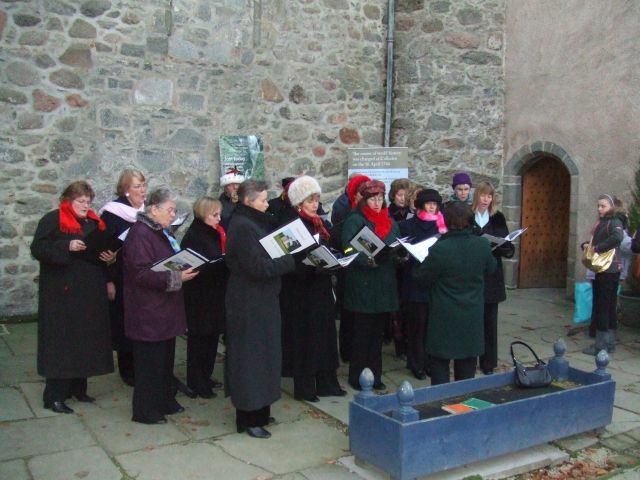 On a very cold but clear December Sunday, the choir were invited by the NTS to sing at Castle Fraser. 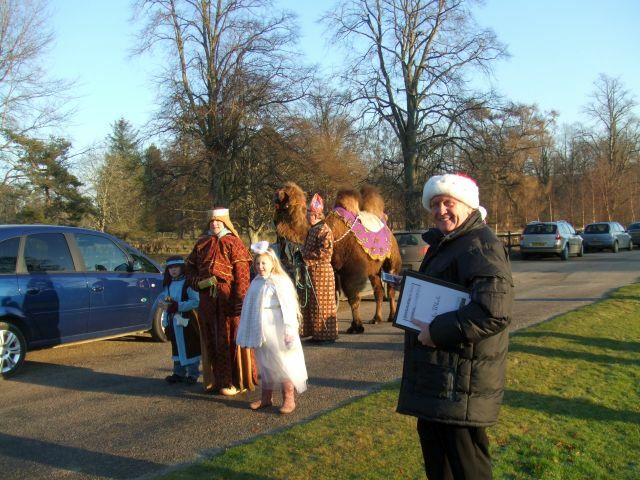 Starting with a parade of Camel(s), Josephs, Mary's, wise men, angels, shepherds et al, we processed around the Castle entering the Courtyard where we sang carols (not once but twice) Thermals were certainly the order of the day. Between outside performances, a selection of carols were sang in the Main Hall, where the children were invited to sing with us in "Away in a Manger". Very luckily the fire was lit and some sense of feeling returned before the second parade. 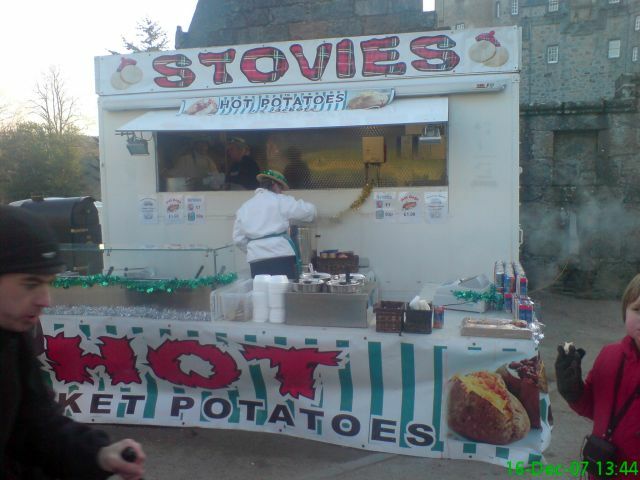 Luckily, there was a Hot Food stall outside where most of the choir warmed themselves up with Stovie (and fine Stovies they were!). I am attaching a little montage of some of the photos that I and John Smith took. Unusually, I feature in one or two. Normally, I have photographic immunity because I am behind the lens. "What a wonderful evening" said one of the audience. "A Night at The Operetta" was an unqualified success. 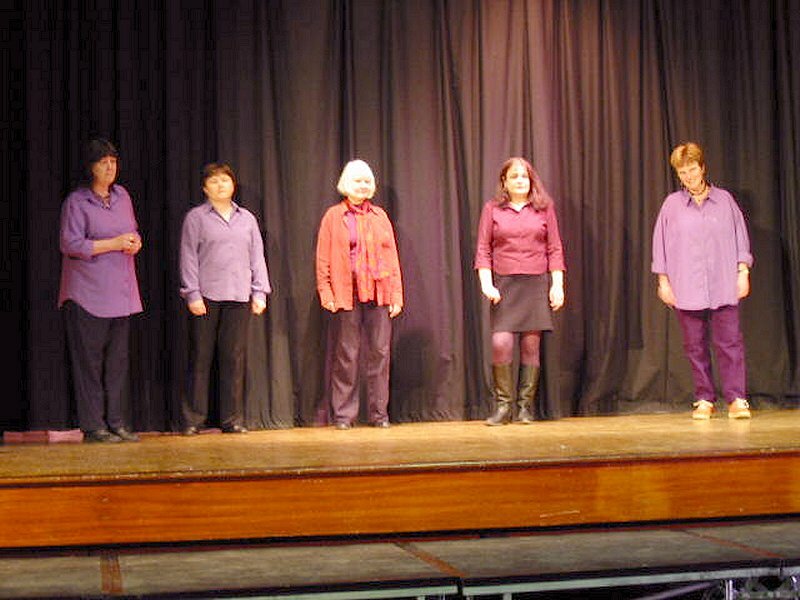 With the superb assistance of "Moira's other lot", the Simpson Singers, a broad spectrum of songs were sung, all to the delight of the audience. By the way, I have been asked where the Simpson Singers got their name. On further investigation, it is a choice of two. They were named after either Archibald Simpson, the famous Aberdonian Architect, responsible for designing much of Union Street and the Music Hall or the JD Wetherspoon's Pub Archibald Simpson where they used to meet after their practices. I know which one I am likely to believe. I leave it up to you!! Anyway, I digress. Back to the concert The feedback after the show was very positive and the audience felt they were really entertained, although some did admit to remembering the songs when they were first sung. The evening was split onto two halves. The first half was a selection of Gilbert & Sullivan. From the lesser known Utopia Ltd to The Mikado and the Pirates of Penzance (Haddo's Opera for 2008 - plug guys). After the interval, pieces from Die Fledermaus, The Merry Widow, The Desert Song and finally a selection of Waltzes where both Choirs joined together for a rousing finale. Next Year (2008) will be our tenth anniversary so something special is being gathered together for a performance in Inverurie Town Hall. 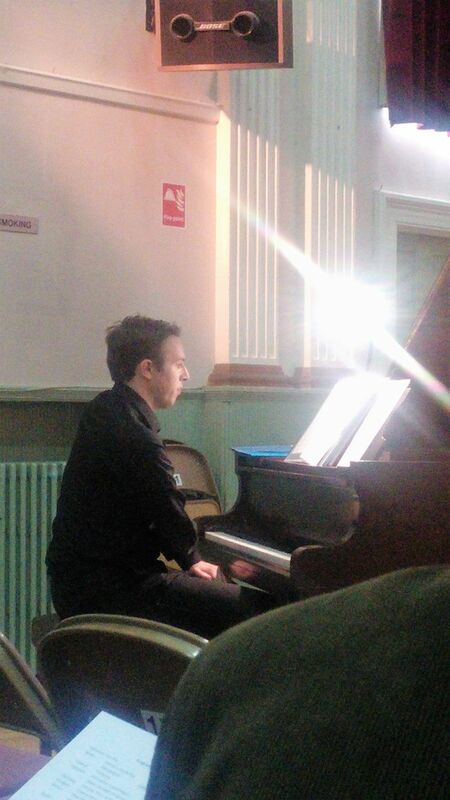 An evening of music by "living" composers was presented at Inverurie Academy. The main work, The Armed Man - A Mass for Peace was preceded by three of John Rutter's Anthems, All Things Bright and Beautiful, A Clare Benediction and For the Beauty of the Earth. The main part of the concert was Karl Jenkins, The Armed Man - A Mass for Peace. The varied composition of the work certainly stretched the choir but it was a satisfying piece of work to sing. Sadly it was necessary to omit two sections of the work. 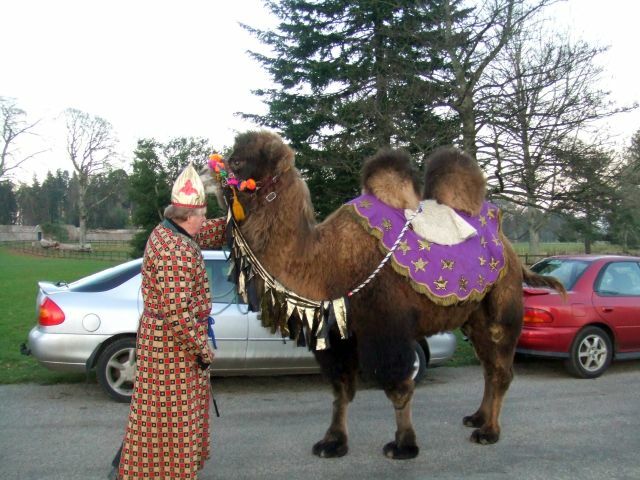 The "Call to Prayers" was not technically able to be performed although an Arabic speaker offered coaching. After hearing that section on the CD, it was very apparent why most amateur choirs omit that section. 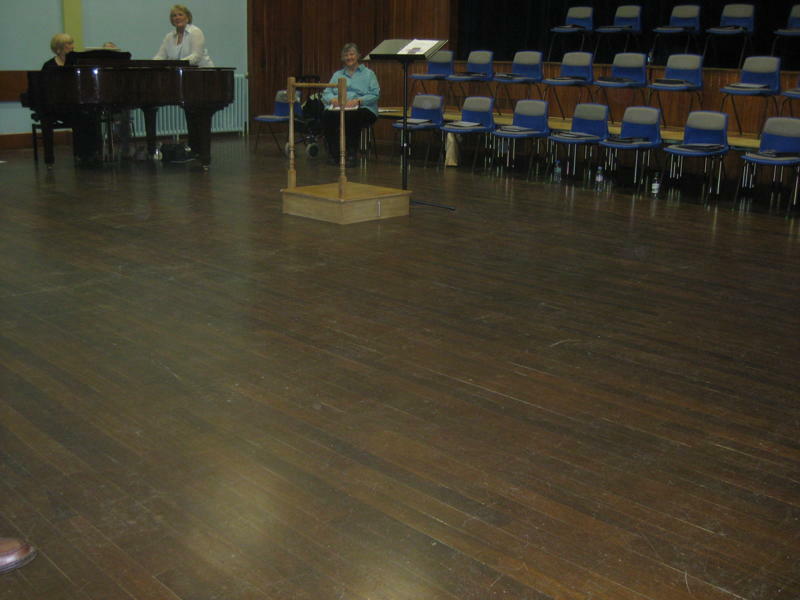 Inverurie Academy hall was sectioned off with the section being totally filled by the audience. It certainly made for a more intimite, if that is the word, interaction between the choir and the audience. Refreshments were shared at the end of the concert. There were many positive compliments for the concert. One of the highlights was the loud bang of the drum before the "Hosanna" was sung in the Benedictus. The audience was positively caressed with the soft singing of the Benedictus but awaken with a start by drum. Having experienced that section of the music in the dress rehearsal the previous night, the choir knew what was to come. However, the audience didn't and it was apparent that at that point, many left their seats in the air for an instant! We all look forward to our Summer Concert, "An Evening at the Operetta" and are rehearsing for it as I write this piece. 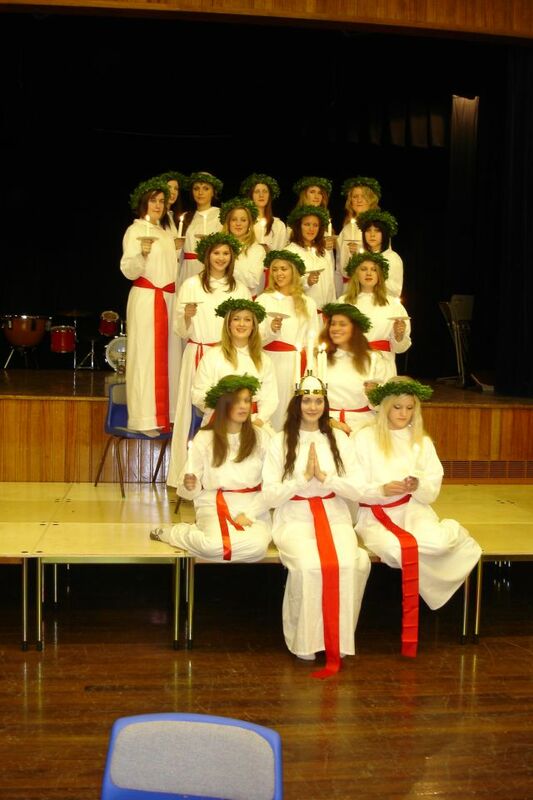 The lights were all out or dimmed in Inverurie Academy when a troop of white-clad young women each carrying a lighted candle and following a tall girl also draped in white and wearing a crown of seven lighted candles came into the hall singing to Santa Lucia. It was both ethereal in looks and charmingly pleasant on the ear. The girls were from the Karlsbergs Music Gymnasium in Amal in Southern Sweden and were opening a special concert to celebrate the 6th century Italian martyr. It was slightly surprising to hear the Swedish words sung to Sul mare luccica” the Neapolitan song. Of course the words were totally different. The Naples song notes the stars shining on the sea and asks the favours of St Lucia to protect them. The traditional Swedish words tell of darkness and the importance of candles to ward off evil. The choir then faced the audience and went through a repertoire of traditional songs associated with the feast of St Lucia, which falls on the 13th of December. There was a welcoming song to the people whom the girls would meet as they process around their villages and towns and a welcome also to the Saint herself, who provides the light to the villagers in this dark time of the year. It is the responsibility of the young women to follow and protect Lucia. All the pieces so far sung had a hymn-like quality and the next item “God morgon god morgon” which almost translates into English is a folksong greeting each other in the darkness. This instantly changed the character of the singing and would be recognised as a folksong in any language. The theme of the concert then also changed and appropriately we went all Christmassy. There was a special song which boys in the processions usually sing to St Stephen and the Scottish carol “Baloo Lammy” was followed by “There is a New Rose”. 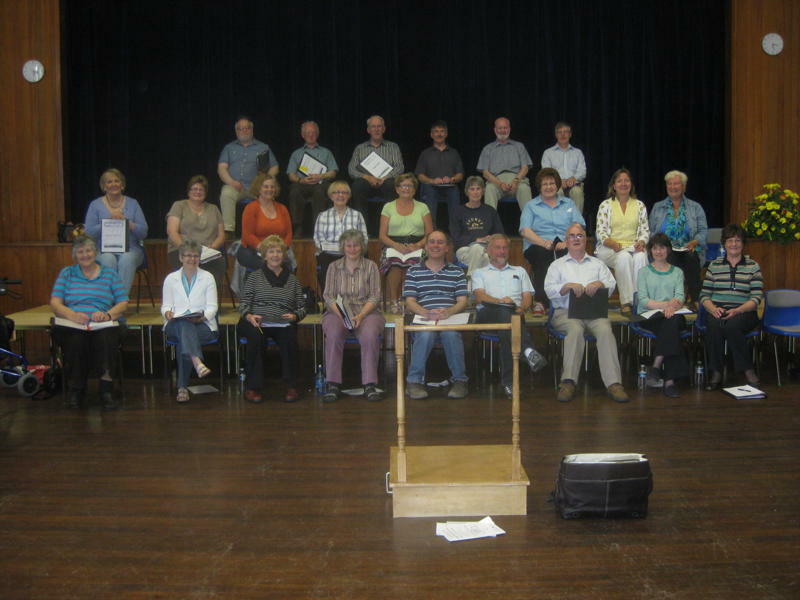 This latter was of particular interest to the other choir in the concert; Inverurie Choral Society. They have adopted “Es Ist Ein Ros Entsprungen” as a regular item in their programmes and it was interesting to hear the Swedish version, “Det ar en ros utsprungen” even though it was sung to a different air. Silent Night is beautiful in any language and their “Stilla Natt” lived up to expectations. The girls ended their programme with several traditional and modern pieces, one of which sang of lighting a candle for the children of the earth. The clarity of the singing, the youthful exuberance and the traditional atmosphere made for a very entertaining first half. As I sang in the second half of the concert with the Inverurie Choral Society it is not possible to comment on how well we sang. What I can say is that though we were not competing per se, we knew we had been set a standard and hoped and prayed that we acquitted ourselves. 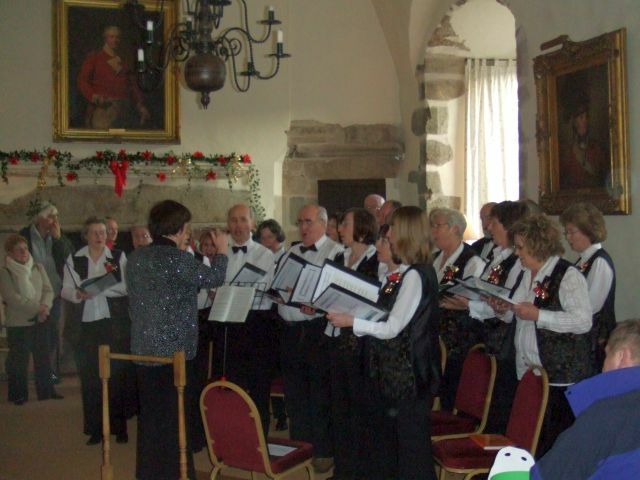 The programme we went through was a variation on that we had performed already at Castle Fraser the previous Monday and Tuesday evenings and were due to repeat at a Christmas Fair again the next day, Sunday. What I do know is that we enjoyed singing to the young ladies who had sung so well for us and the rest of the audience. The youngsters were visiting Aberdeenshire as part of the SusSET programme. 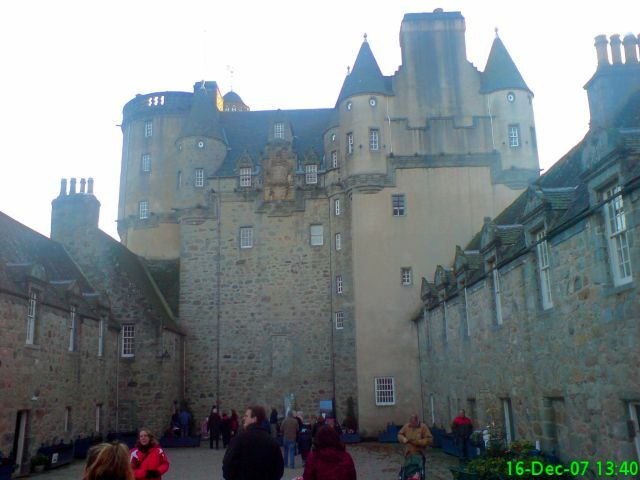 Two very pleasant evenings were spent singing at the National Trust for Scotland Carol Week at Castle Fraser. Apart from the dreadfully out of tune piano and the dim lighting, it was a pleasure to sing for the NTS at Castle Fraser. The wonderful ambience of the Great Hall and the crackling log fire lent themselves to the interesting and varied programme produced by Moira. A couple of pieces from "Armed Man" and John Rutter were sung as an advert to the main concert in February. Sadly there was a very nasty bout of flu going around which laid low quite a few of the choir but all the rest upped their work rate to produce a performance much appreciated by the audience. 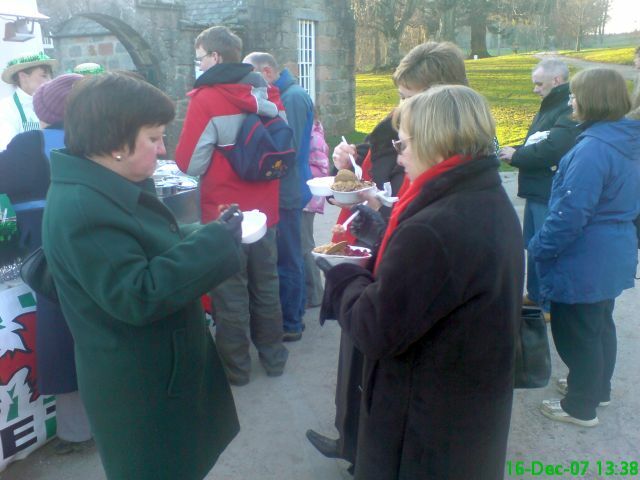 At the end of the performance, hot punch and mince pies were offered by the NTS which were very welcome. 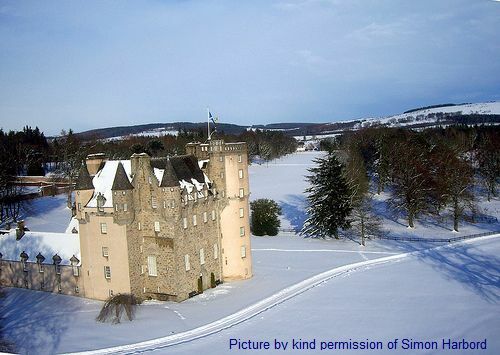 The rep at Castle Fraser has asked us back to sing again for Christmas 2007. 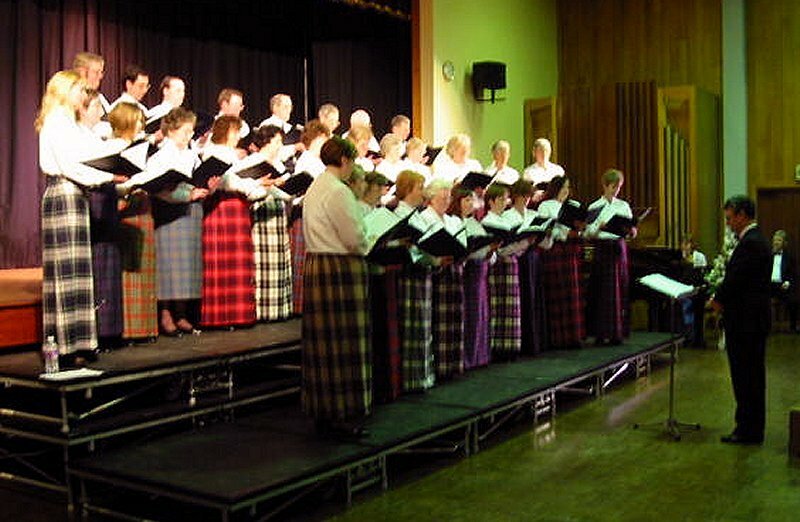 After the very successful audio/visual presentation of the Summer Concert, 2005, "A Scottish Panorama", the committee decided to broaden our vista and take in Europe and traditional songs and dances from around Europe. Not that the Society was seen to do European Dances but were heard singing dance songs. Several of the songs were sung in their native language and to that end we had a Russian and Finnish coach to assist us in our pronunciation. We were very lucky to have the exceedingly talented Jumash Poulsen, accompanied by his Mother, Ainur as our guest artist. For one so young, his talent is incredible. His mastering of the violin belied his lack of years. Certainly a name for the future. 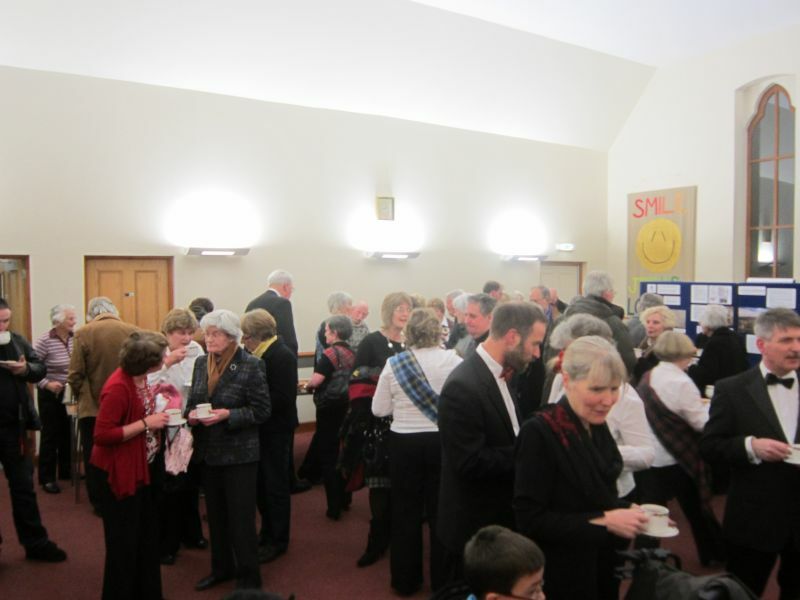 After the concert, light refreshments were available to the audience and choir alike. So, Scotland first, then Europe. The World next perhaps? Sadly no, as the concert of 2007 promises excerpts from light opera and operetta. We were invited to entertain an audience who were offered mulled wine, mince pies, chestnuts and chocolates for the flavour of Christmas. Again the performance, totally unaccompanied, was split into two parts. When we arrived, the location we were expecting to sing from was taken by a huge Christmas Tree. We were taken to the Ambassador Suite where a mini stage had been erected and tables set for the evening. 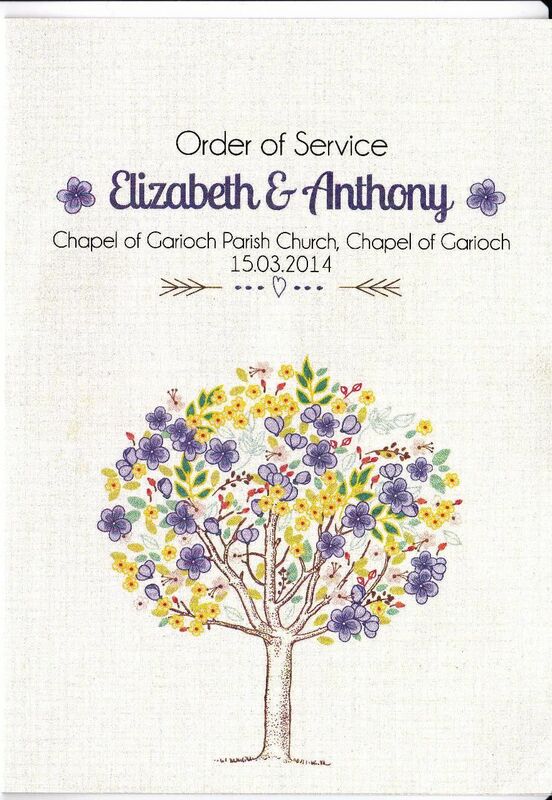 I think the event, laid on by the Thainstone House Hotel, was under or incorrectly advertised. The number of people who came for the evening was very disappointing since we probably had the largest turn out of the choir this Christmas. 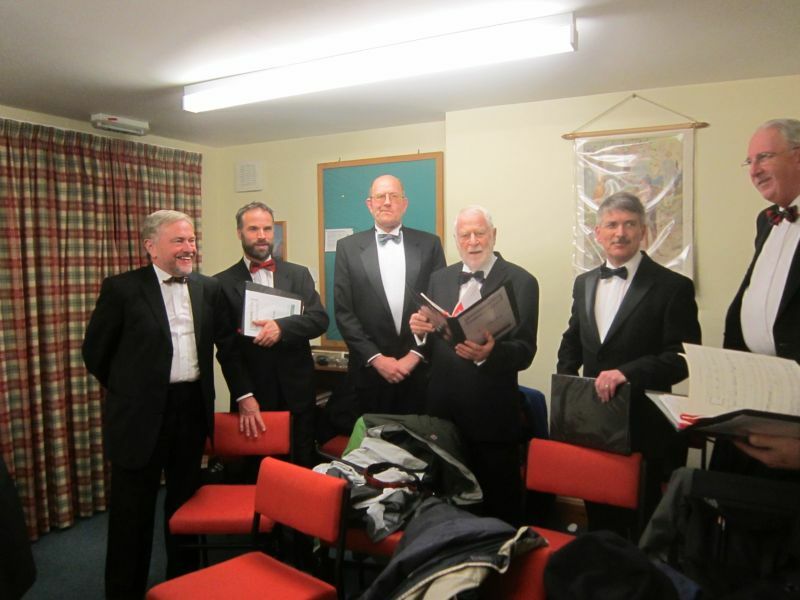 However we soldiered on and did both sections of the carols. The acoustics were very difficult as the room was totally carpeted from wall to wall. Certainly on this occasion the choir significantly outnumbered the audience. Those of us who were there will know what I mean. However it is just as easy (or difficult) to sing to one as it is to one hundred. 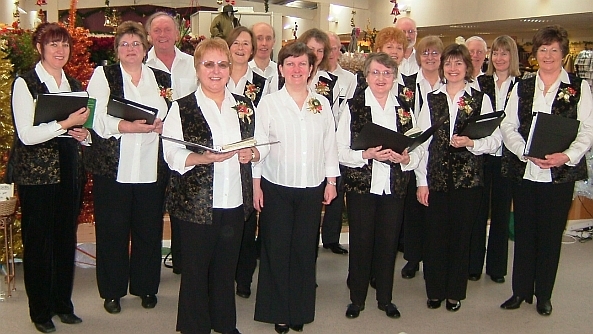 As last year, we were invited to sing carols to the customers in the Garden Centre restaurant. Two 30 minute sessions, unaccompanied, were sung but this year we were singing in the restaurant. Instead of a repeat of carols, two different sets of carols were sung so those who stayed the full hour (and there were some) were entertained to our Christmas Repertoire. 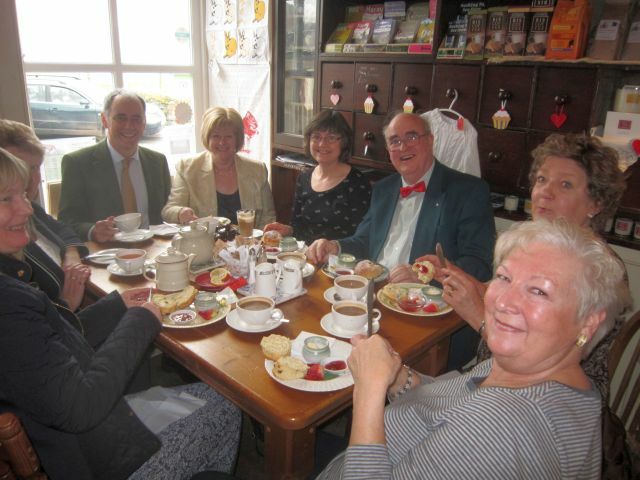 We were provided with refreshments at "half time" by the Garden Centre which were very welcome. Again the response we got from the customers was encouraging. 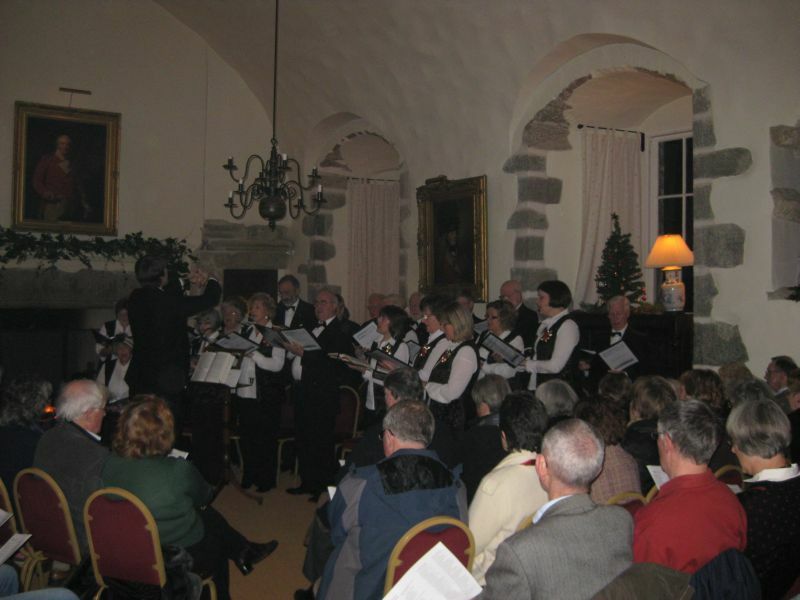 As part of the National Trust's Christmas Festivities, we were invited to sing carols to a sell out audience at Castle Fraser. The evening was carol singing by us followed by mulled wine and mince pies. An entrance was made into the Great Hall singing the Gloucestershire Wassail as we took up our seats. An hour of carol singing was appreciated by the audience which came from all around the area. It was a lovely hall to sing in, though the piano could have done with some tuning for the few carols we needed the piano. Most of the singing was done unaccompanied. It was nice to mix with the audience afterwards who were appreciative of the whole evening. We look forward to being invited back again some time. 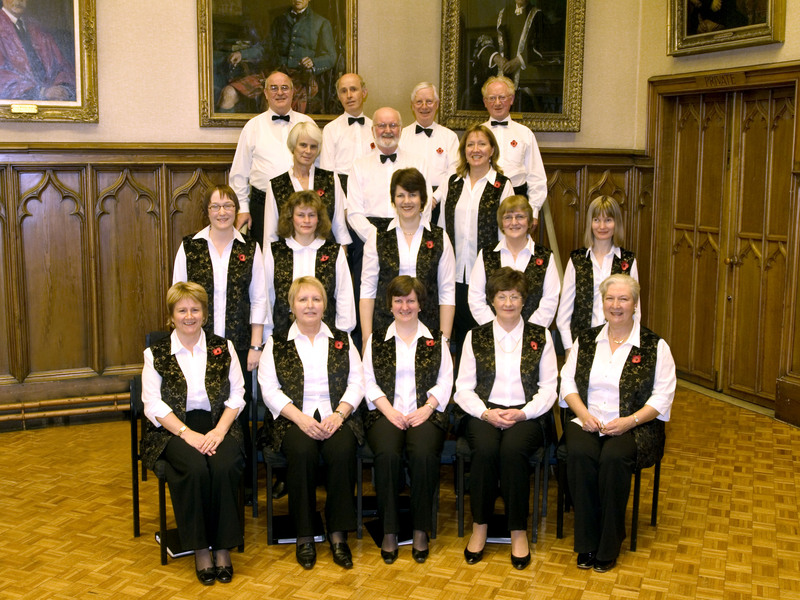 The 12th November, 2005 saw the Inverurie Choral Society at Aberdeen's Mitchell Hall as guests of the Bon Accord Silver Band and their regular conductor Duncan Beckley for their 5th Annual Concert. 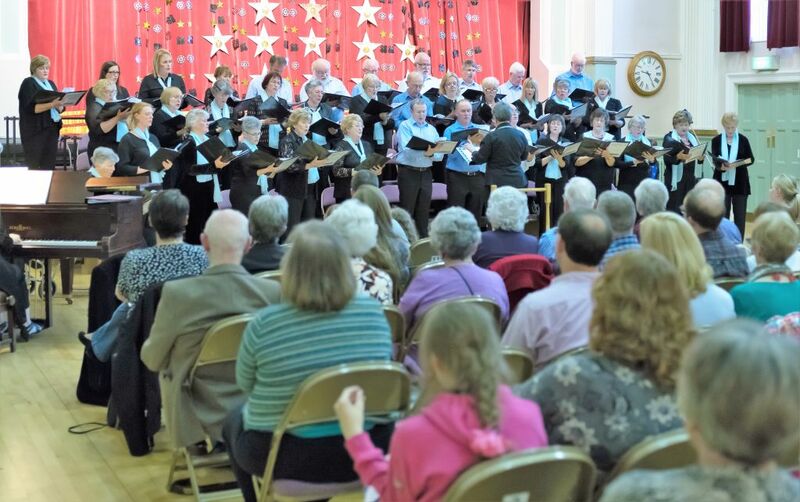 Conceived out of the idea to expand the Choir's horizons, capabilities and local presence, and to have some fun in doing so, the concert proved to be a well attended success. From the outset, so as not to make any inroads on the choir's rehearsal schedule for the Durufle concert, it was agreed that there be just two pieces where the choir would join the Band. These were the "Hymn to the Fallen" from the film "Saving Private Ryan" and a newly worked out choral addition to Peter Graham's "Gaelforce". Saving Private Ryan is undoubtedly well up in the ranks of the great films of the modern era. The film tells the story of a group of US soldiers during the Second World War making the ultimate sacrifice whilst attempting to bring back the eponymous Private Ryan from behind enemy lines. The centrepiece of the score is the beautiful Hymn to the Fallen, which in the years since the films release has become a memorial for all the soldiers who sacrificed themselves on the altar of freedom in not just the Normandy Invasion of 6th June 1944, but for all who fell during that war. It was thus entirely appropriate that we performed the piece during the Remembrance weekend. Adapted from John Williams' score by Sandy Smith of the Grimethorpe Colliery Band, the "Hymn to the Fallen" makes tremendous use of the haunting sounds of a wordless chorus set against the restrained use of the instrumental forces and military beat of the percussion. Whilst slightly fewer in numbers, the choir did this piece proud and it made the concert. That is certainly the comment I have picked up from the audience and the Band itself. The work we put in paid off. Well done everyone ! Our second contribution came at the finale. Originally the intention was to have kept up the movie theme with the rousing Duel of the Fates from Star Wars the Phantom Menace, but Moira and I thought it really would require many more numbers than we could ever muster to bring it off, especially as the Band would have been going at full tilt. So, still with the intention of providing a finale to wow the audience, I thought it an idea to provide a choral setting of the central section of Peter Grahams' "Gaelforce". Moira kindly made the concept a reality in putting words to the score. Irish folk music has undergone something of a renaissance in recent years with the high profile of such as Riverdance. Gaelforce follows in that tradition in using three traditional folk tunes to exploit the full colour and variety possible with the modern band. Adding the choir to the mix made it even more so. Firstly came a setting of the jig "The Rocky Road to Dublin" featuring the Bon Accord Bands' cornet section. Then it was our turn to join the solo flugel horn and band in The Minstrel Boy. The entry for the choir had proved to be problematic in rehearsals, but we got it right and confidently so on the night. Then, finally, it was up to the band supported by some rip roaring percussion to finish the piece with a very Riverdance like setting of "Tossing the Feathers". Before any of the above, we had our own solo spot ! How this crept into things I am still not sure, but it worked well enough with Sullivan's setting of The Long Day Closes and our ever reliable party piece "By the Light of the Silvery Moon". They were ok but I wonder if, after an afternoon of rehearsals with the band in situ whether we were quite sure of the difference it would make of us being on our own in the acoustic of the hall. Still, all in all, it was a wonderful occasion and a success we could well build on. 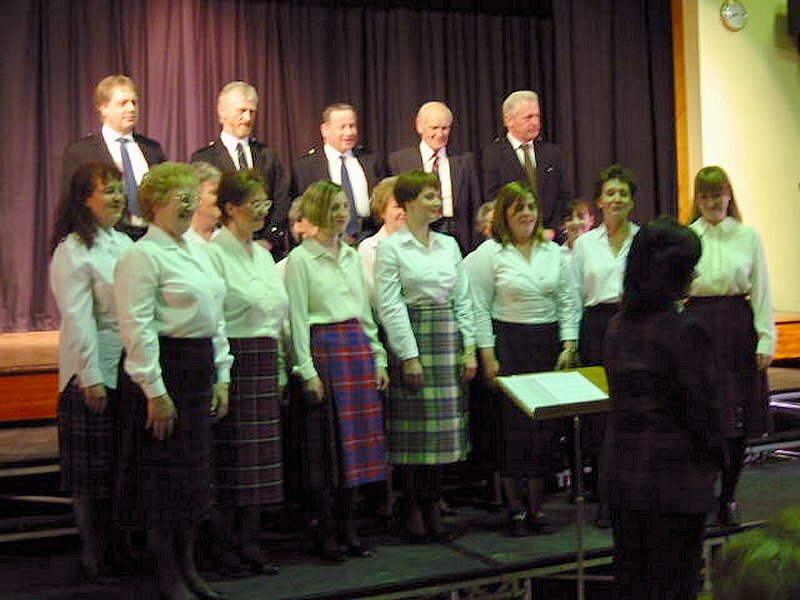 Summer Concert - Kemnay Church Centre - June 2005 - "A Scottish Panorama"
The usual Festival weather (snow) relented this year and allowed a well attended singing festival. 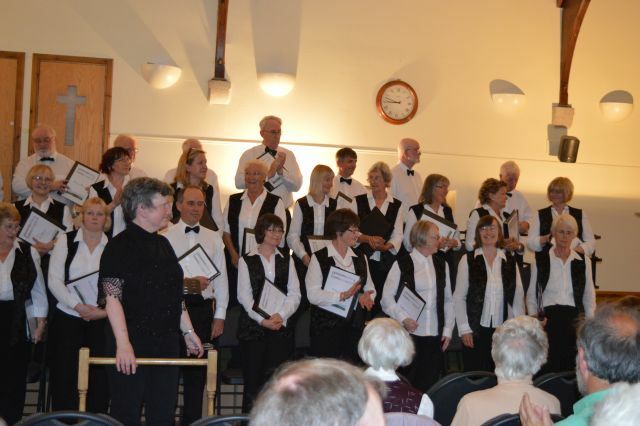 Eleven choirs were represented demonstrating the varied repertoires of local societies. By far the largest section was Haddo choirs who brought with them 3 choirs totalling over a hundred singers. The afternoon was spent in a very amusing workshop with Guest Conductor David Lawrence, where a lot of the techniques of singing were learnt. The attending choirs were: The Linties, Haddo Children's Choir, Inverurie Choral, Haddo Youth Choir, Peterhead Choral, Haddo Choral & Operatic Society, The Banchory Singers, Bennachie Singers, The Stonehaven Chorus, Aberdeen Gaelic Choir and The Granite City Chorus. Sadly, due to outside reasons, we were unable to do three pieces so Durufle's "Kyrie" and Reith's version of "By the Light of the Silvery Moon" were sang by us. Remarks were overheard from one Society's conductor who said "One thing about Inverurie is that they have a very varied choice of music!" At the end of the evening all choirs joined together and gave a performance of Holst's "Now is The Month of Maying" and "O fortuna" from Carmen Burana. Well done to everyone involved and here is to next years festival. 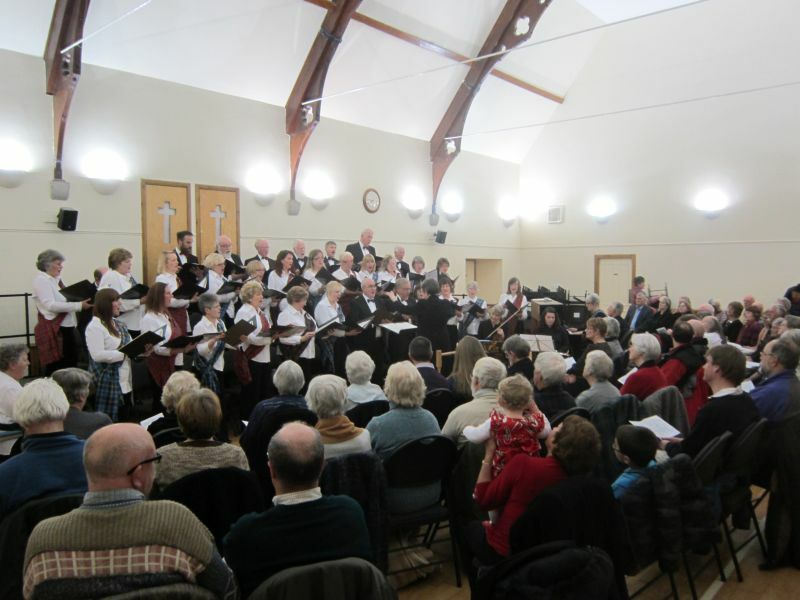 The Inverurie Choral Society performed its annual Christmas Concert at the town’s St Andrew’s Church on the evening of Sunday 5th of December. 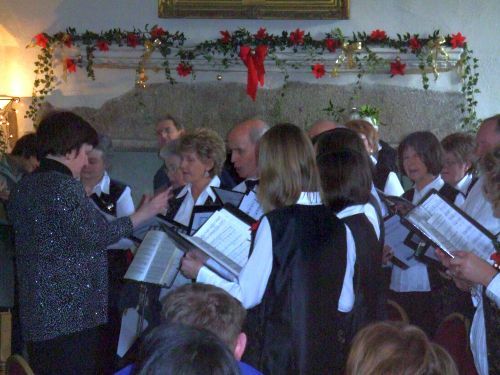 This, the seventh annual yuletide concert, saw the Musical Director Moira Hunter arrange a selection of carols which gave the choir some tricky and satisfying items to get their teeth into as well as allowing the audience that comfortable feeling you get when you can join in the more traditional and popular carols. The accompanying organist was John Forrester. 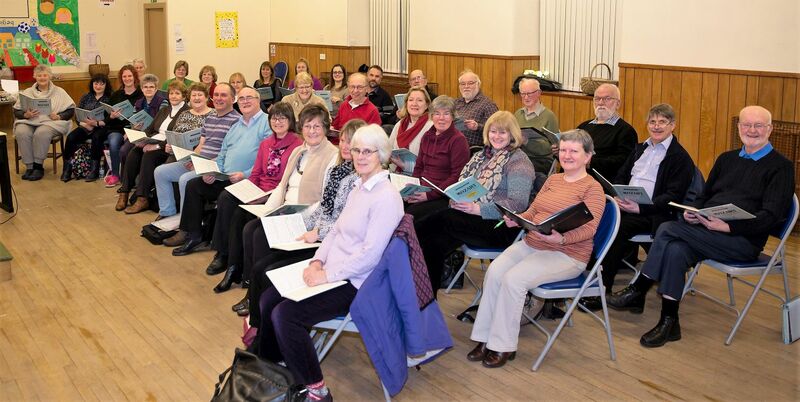 The choir which was established in 1998 under John Hearne, has already had a pretty busy year having taken part in two concerts already this year as well as involving itself and the members in the popular Aberdeenshire Singing festival in March. They have had the confidence to branch out and have produced a CD on which many of the carols that were sung on this occasion feature. 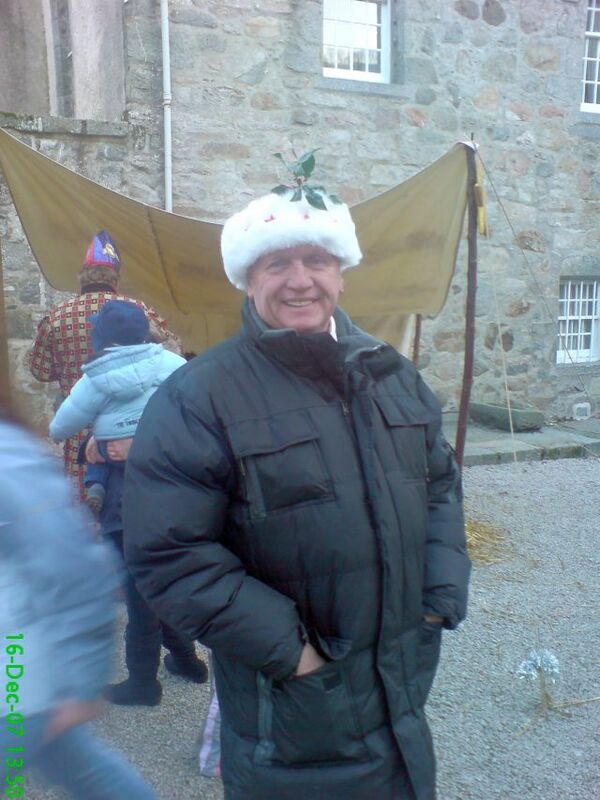 In addition they were requested to give a seasonal feeling at the Inverurie Garden Centre on Saturday afternoon. 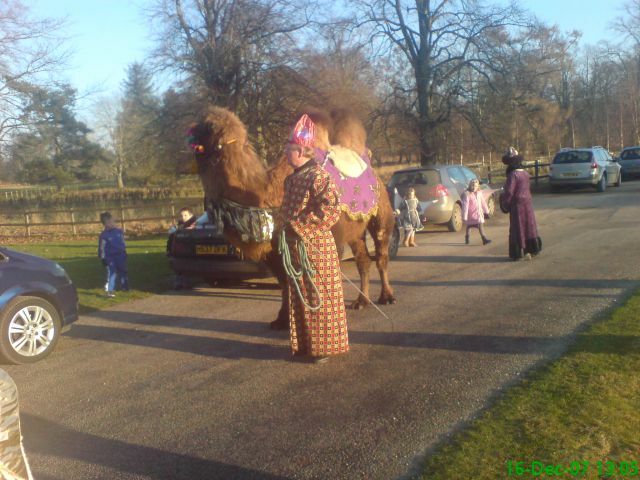 This proved so popular that they have been asked back to perform again on the Saturday before Christmas. Incidentally, Inverurie based John has just been awarded a special Doctorate in Music from the University of Aberystwyth in Wales, in recognition of his contribution to music over the past three decades. One of the most entertaining aspects of singing is getting ones tongue around Latin and even more old forms of English. The carol “Adam Lay Y Bounden” which Boris Ord of Cambridge put to a 16th century air took some getting used to. So did “Myn Lyking” a traditional carol put to music by RR Terry a while ago - the words look recognisable but pronouncing them is an interesting exercise. Even more so was an old Latin carol dating from 1592 and which could easily have earlier antecedents, entitled Gaudete (meaning rejoice). But the effort is usually worth it and from comments from the audience after the Concert the sounds were greatly enjoyed. The CD entitled “Sing Noel” was on sale at the door and gratifyingly they were being snapped up. 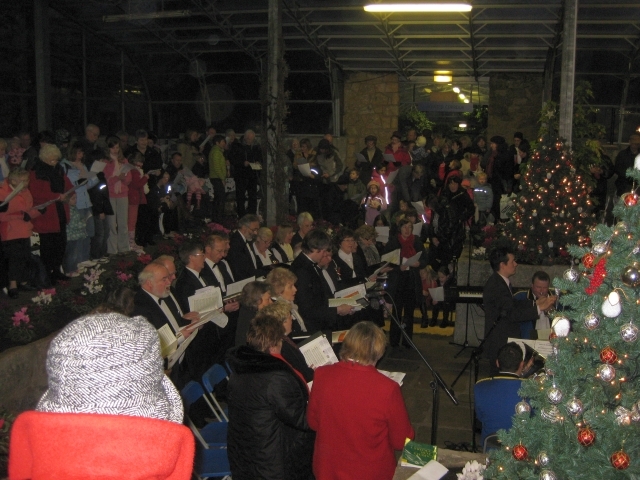 The Choral Society was invited to sing two sessions of carols at the Inverurie Garden Centre on Saturday 4th December 2004. Two thirty minute sessions comprising 10 carols (all unaccompanied) were sung upstairs. A tea break, provided by the Garden Centre was welcome as it was very warm upstairs. Apparently the singing was heard throughout the centre and drew a lot of people upstairs. Very favourable comments were received by patrons of the Centre and the Centre's Management. We have been invited back again for a return session the week before Christmas. 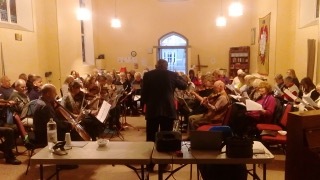 The concert was held on a hot June evening with the sun shining through the church centre windows. I think we were all surprised when we ran out of seats and had to find more chairs for the performance. "Day and Night: A Summer Miscellany" was the title of the concert and that is exactly what was contained within the programme. We were joined for the performance by the Cults Academy Saxophone Quartet and accompanied, where necessary by Andrew Bruce. The youngsters had to be applauded for their saxophone playing and choice of music. It is so good to see young local talent and we hope that they go a long way in their musical career. For a change, some lighter music was added to the performance and it was appreciated by the audience. "Moon River" and "By the Light of the Silvery Moon" were just two of the more modern songs sung by the choir that night. A successful performance, enjoyed by both audience and choral society, ended with Arthur Sullivan's beautiful "The Long Day Closes". 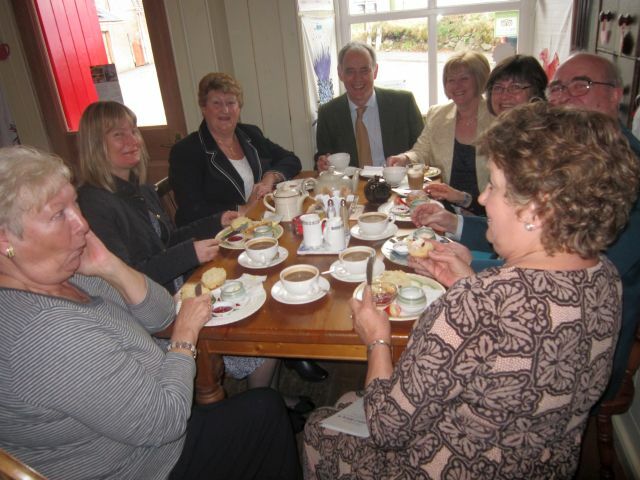 Refreshments were provided after the performance by The Church Centre Ladies. A thoroughly enjoyable evening. The concert consisted of works from Mozart (Ave Verum Corpus) and Bach (2 Chorales from the St Matthews Passion") and the main part of the concert was John Stainers "The Crucifixion". For Stainer's Crucifixion, we were joined by two members of the Aberdeen Opera Company, Peter Weston (Tenor) and David Smail (Bass). 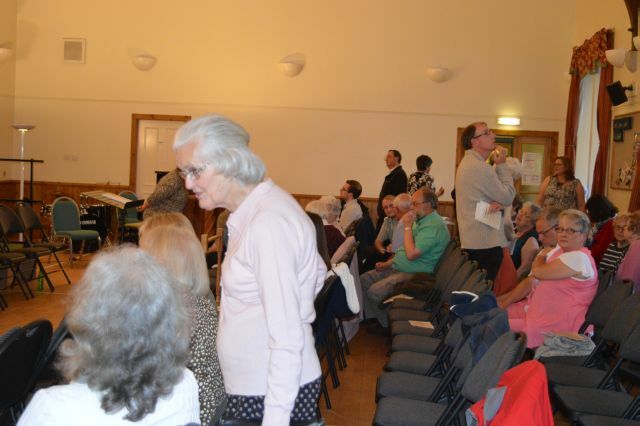 The audience were invited to join in the Chorales. the Organ was played by David Smith. "God So Loved The World" was performed unaccompanied. Whilst St Andrews Church is acoustically quite good, the numbers we had for the concert meant that Moira was difficult to see. Even with a slightly higher dais, it was difficult for all members of the choir to see her all the time (and after all, we should be watching the conductor, shouldn't we?). Moira, you ought to grow another foot (height please) or make your dais a little higher. I felt the concert went very well overall. It was a good sing and the evening was rounded up by drinks and nibbles provided by St Andrews Church. Once again we had beaten the weather although there was the legacy of the previous weeks snow storms still lying on the ground! Our guest conductor this year was Michael Kibblewhite. 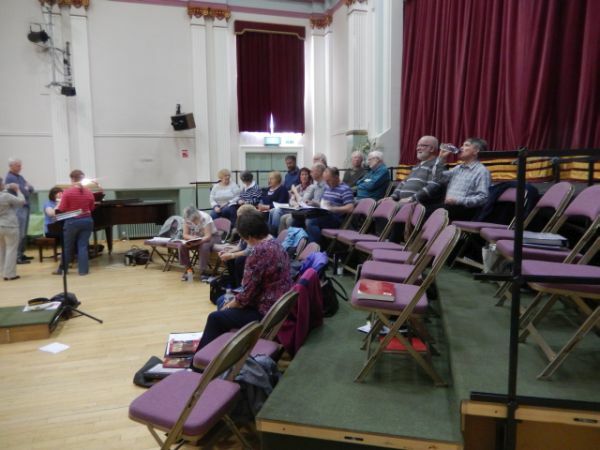 He held an entertaining workshop in the afternoon and rehearsed the 3 combined works - Viva Musica, Rutter's Agnus Dei and Jabula Jesu, a Zulu folk song. The evening concert started at 7.30 pm and we were the first choir on stage. It was in the afternoon that we learnt that Michael Kibblewhite's Great Grandfather (I think) was John Stainer, who wrote "The Crucifixion", a piece of which we were to do that evening. Talk about pressure. the Great Grandson of the composer there in the audience. We did 3 pieces. Mozart's "Ave Verum Corpus", "God so Loved the World" from Stainer's Crucifixion and Freunt's "How lovely sings the Angel Choir". Overall, I felt the performance was OK with a slight indifferent 8 bars in the middle of "God so Loved the World". That particular section had gone without problem in the rehearsal earlier in the day. In all, 9 choirs/choral societies took part. 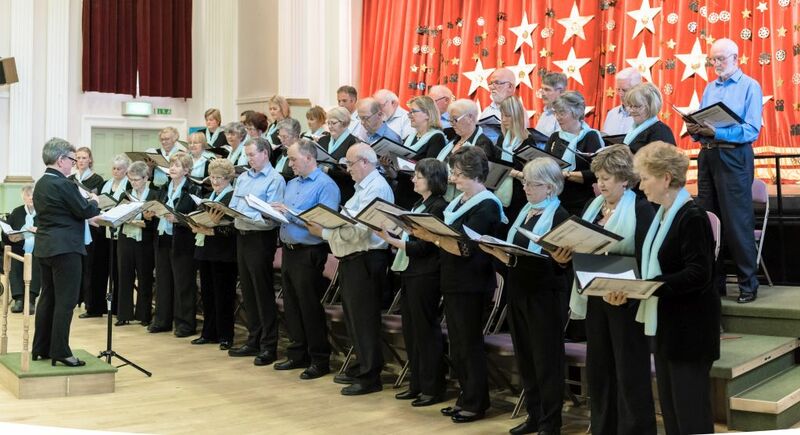 In order of appearance in the evening they were, Inverurie Choral Society, Haddo Children's Choir, The Linties, Haddo Youth Choir, Peterhead Choral Society, Haddo Choral & Operatic Society, Bennachie Singers, Aberdeen Gaelic Choir and The Stonehaven Chorus. The evening finished off with the massed choirs all joining together under the baton of Michael Kibblewhite. Michael even involved the audience in what was an excellent visit to Huntly. On a snowy cold evening, the Christmas Concert was resurrected. Rehearsals were carried out in the afternoon with our soloist, Anna Hamilton and with Donald Hawksworth at the organ. There were one or two concerns about the organ behaving itself and the church itself felt a bit cold but that was out down to the change in temperature outside. As we arrived at 7.30 pm, the church was positively freezing. It was then that we found out that the heating had broken down that morning. However, as is the spirit of Inverurie Choral Society, we will take on all conditions and give our best. 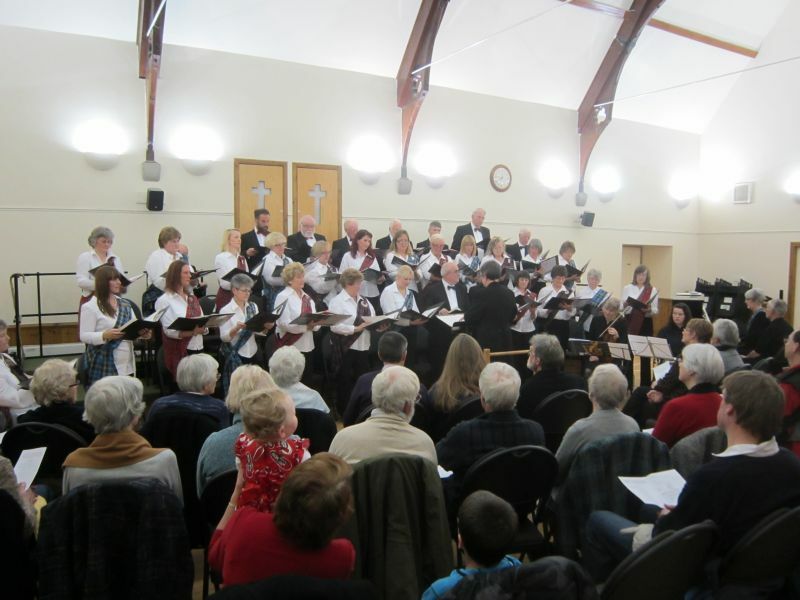 The main piece of the performance was Haydn's Little Organ Mass with extracts from Handel's Messiah, soprano and organ solo's as well as a variety of carols. 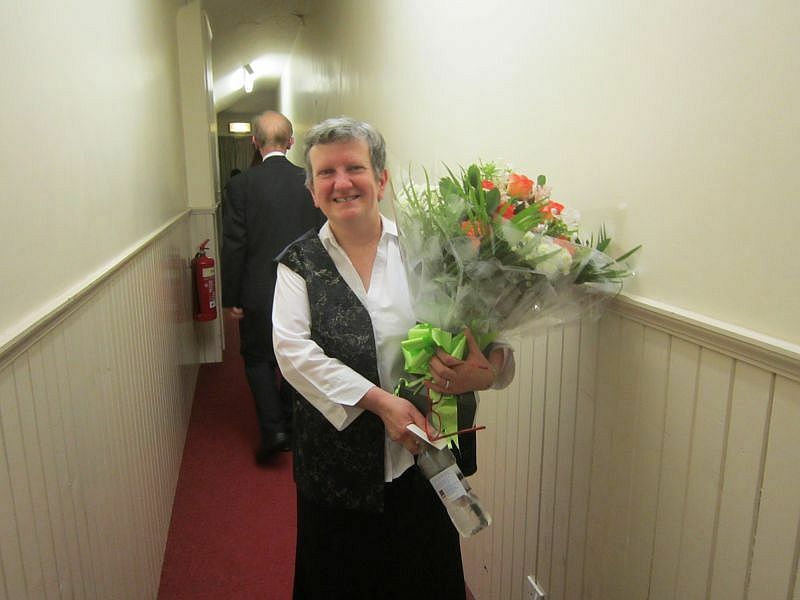 Anna Hamilton had a stunning voice and we thank Moira for managing to get her for our concert. John Hearne has decided move on to other things. 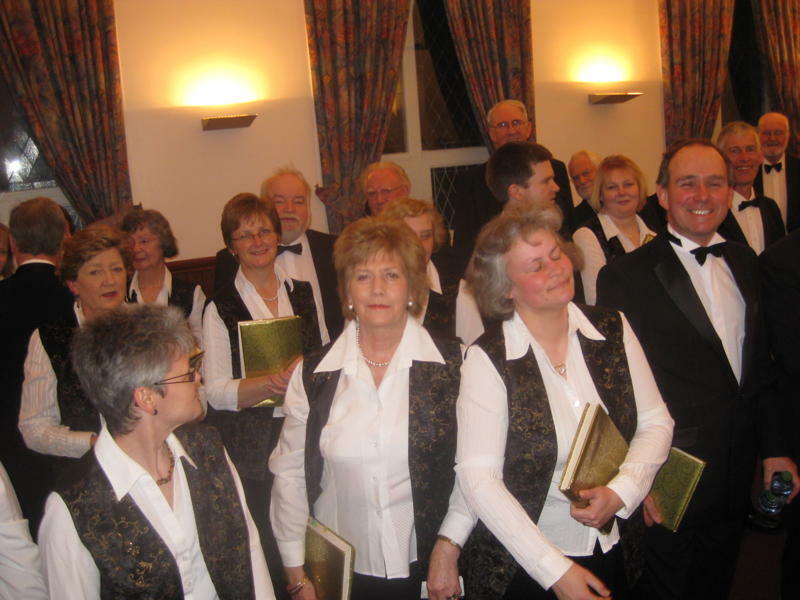 When the Choral Society was formed 5 years ago, John said that he was willing to take us on for 5 years. John has many other responsibilities that he wants to concentrate on - and he is no longer a youngster (sorry John but you can draw your pension now). We have to thank John for taking us from a raw group of singers and blending us into what we are now. We certainly have a reduced number from when we started but we are a keen, dedicated core of singers. Very luckily he has found us a very able successor to him. Moira Hunter was the former director of Aberdeen Opera Company and is being brave enough to take us on. 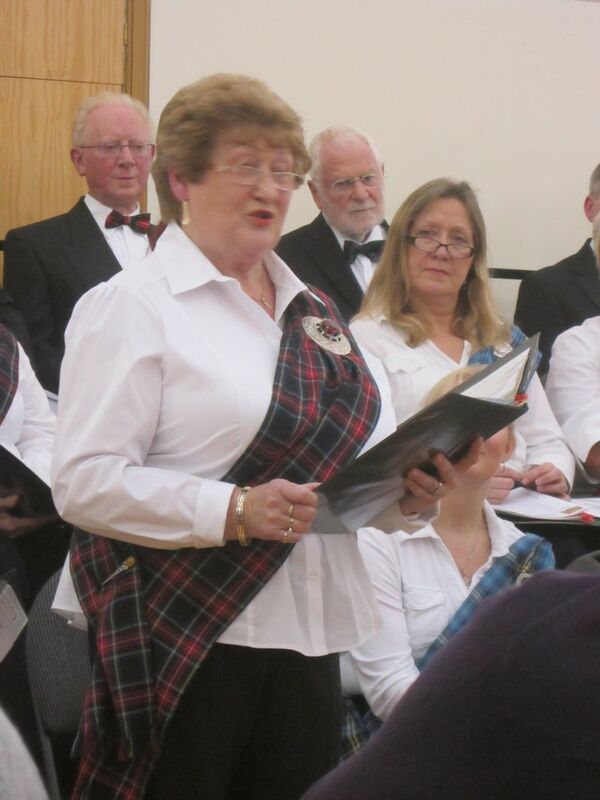 Welcome Moira to Inverurie Choral Society. We may be small but we will do our best for you. 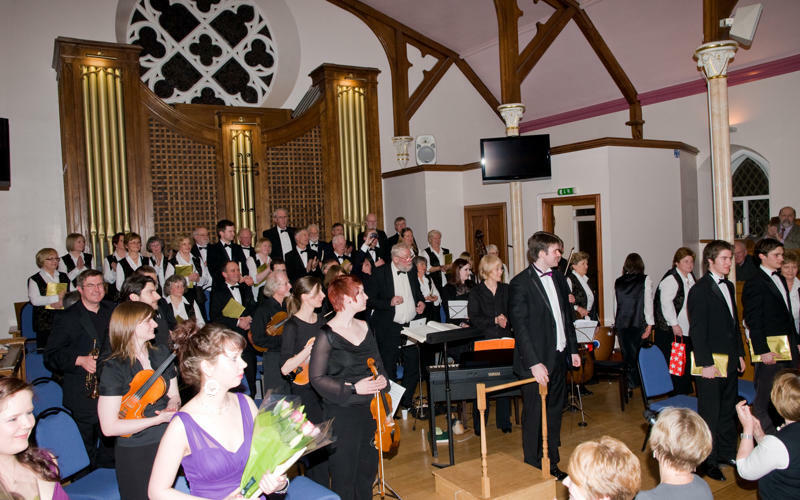 This was the last concert to be conducted by John Hearne as Musical Director of the Society. 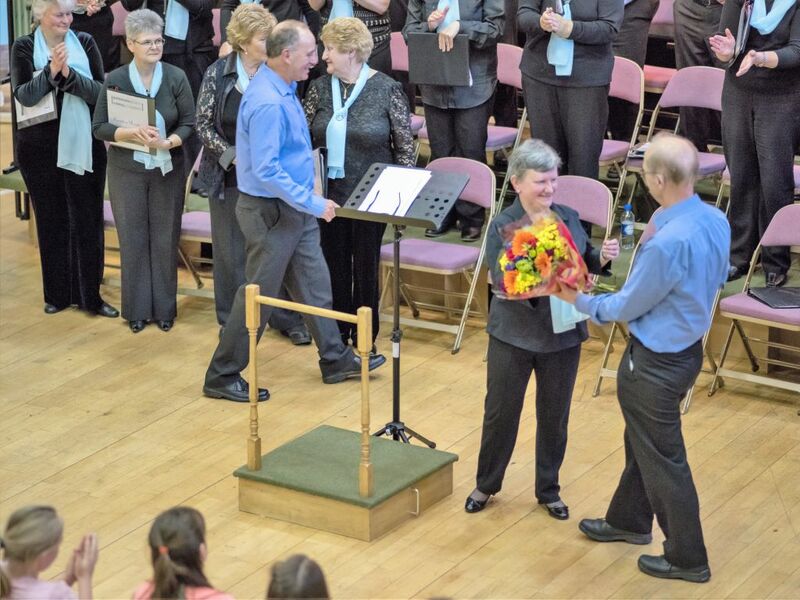 Before the evening's entertainment, the Choral Society presented John with an engraved Musical Director's Stand to thank him for forming our Society. John said in 1998 that he would give us 5 years of his time and experience and helped the society to its present day state. He has handed us over to Moira Hunter, who becomes our new Musical Director. 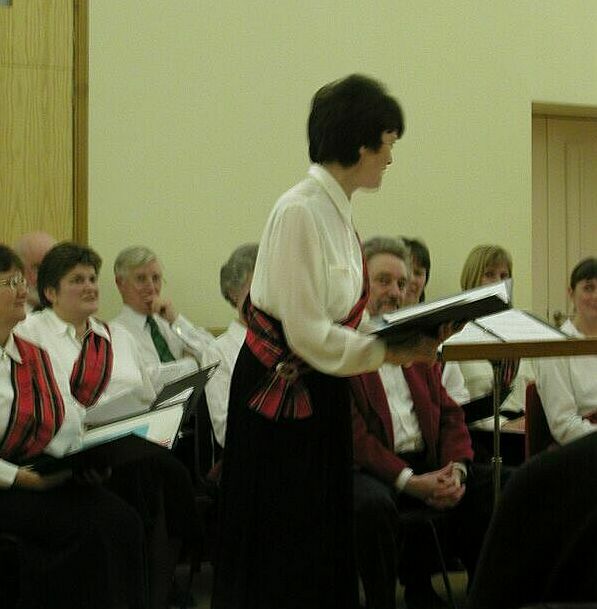 Luckily, Moira was able to sing with us for this concert so experienced us "from the sharp end", so to speak. In front of a good sized audience on a sunny evening at the Chapel of Garioch, The "Summer Schubertiad" started with an unaccompanied rendition of "Holy, Holy, Holy". This set the scene for an evening's entertainment mainly based on Schubert's works. "Psalm 23, The Lord Is My Shepherd" composed by Schubert followed before the main event of the evening, Schubert's Mass in G. We were fortunate to have AVE (Aberdeen Vocal Ensemble) as our guests and Shirley Cummings (soprano), Nick Cameron (tenor) and Brian Gunnee (baritone) took the solo parts in the Mass. AVE then sang Mendelssohn's "Hear My Prayer" with Laura Morley as soloist before the choir sang two Schubert's unison songs "Sea Calm" and "To Music". AVE then sang an eight part harmony to Pearsall's "Lay A Garland". The harmony was beautifully blended with voices of AVE. It is wonderful to hear a group of talented young artists, from all walks of life, sing so well and with confidence. The choral responded with Pearsall's "Who Shall Win My Lady Fair" followed by Callcotts "Go, Idle Boy"
The finale of the concert was a trio of Schubert songs, sung in German. "Tanzen und Springen", "Es bluhen die Maien" and "Der Tanz". 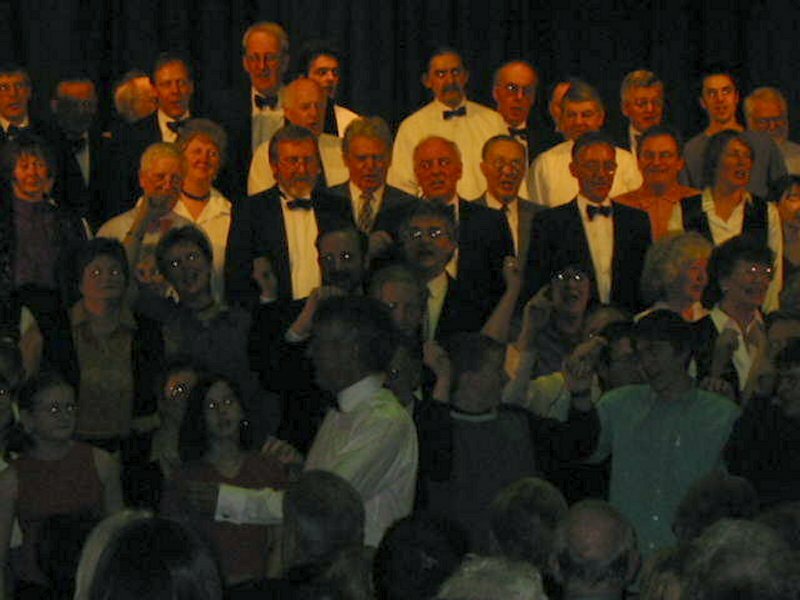 An encore of "Der Tanz" was sung at the end of the concert. John Hearne introduced the pieces of music in his inimitable way which gave the knowledgeable audience a background to the concert. Accompaniment on both organ and piano was, as always, ably performed by Donald Hawksworth. 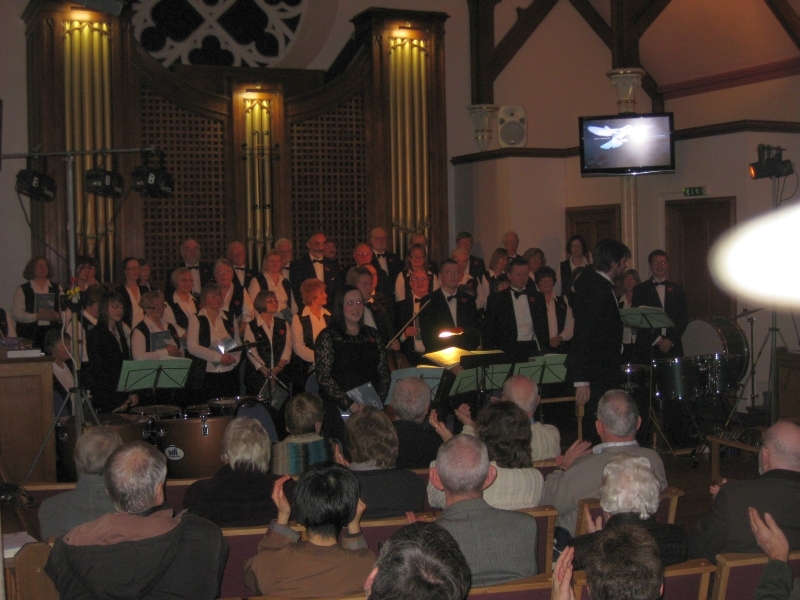 It was a thoroughly enjoyable concert, enjoyed both by the performers and the audience alike. This year, our Musical Director, John Hearne decided that we should celebrate Robert Burns birthday with a "Burns" concert held at the Kemnay Church Centre. 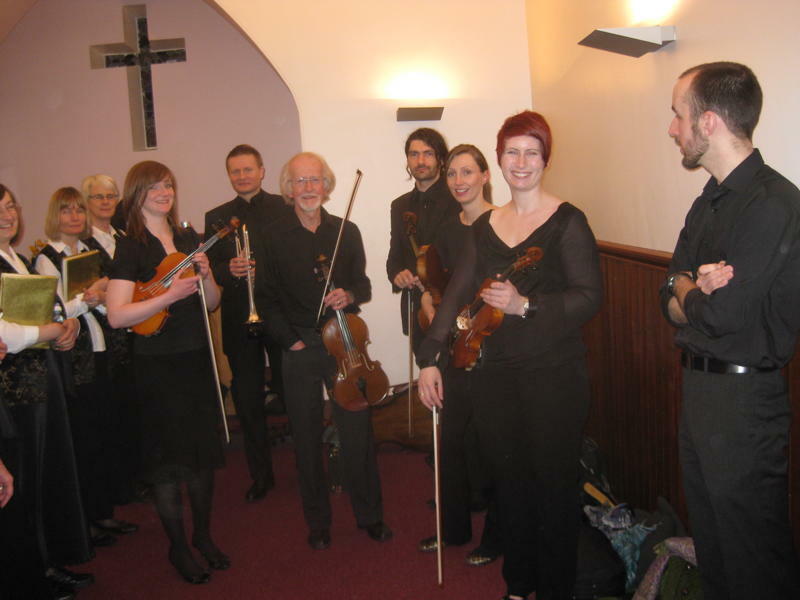 The programme was to include readings of Robbie Burns, guest performances by a local fiddle player and a vocal octet with vocal contributions by the Society. The evening was started by a reading of Burns "Twa Dogs" by Margaret Hearne. Throughout the evening Margaret, who is a drama specialist for Aberdeenshire, read several of Robert Burns' poems. My personal favourite which also had the audience laughing was "The Braw Wooer". 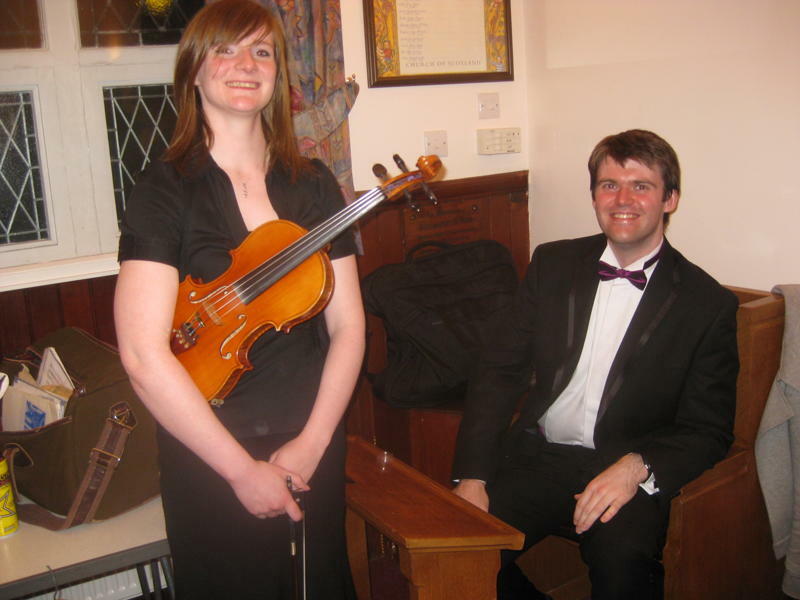 Fiona Thain is a young fiddler and accompanied the Society in a couple of pieces but also gave a couple of solo fiddling renditions. 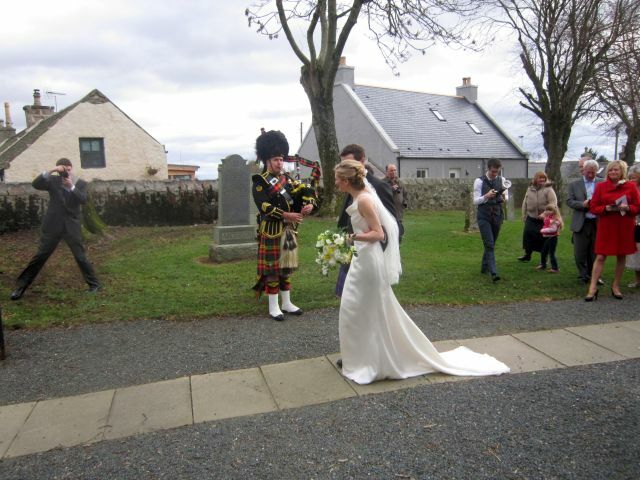 Fiona is from Inverurie Academy and is also a member of Celtacad and The Garioch Fiddlers. 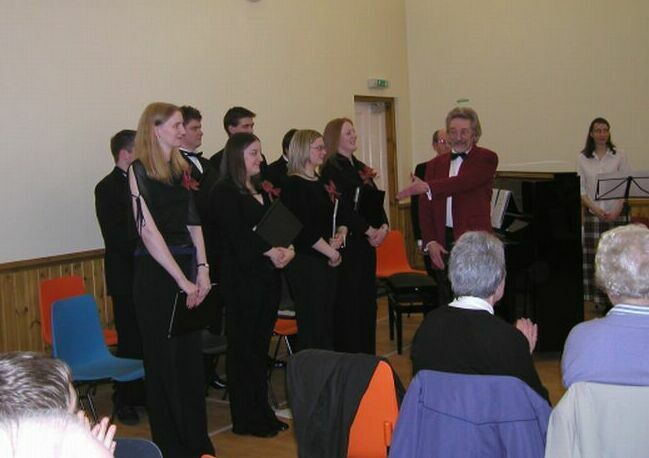 Our other guests were AVE (Aberdeen Vocal Ensemble). 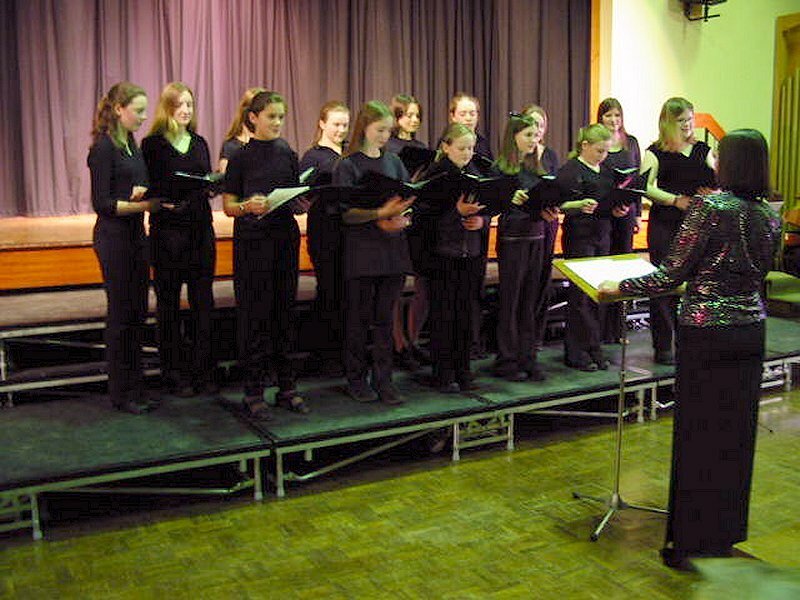 AVE was originally formed in 1999 by the local members of the Total Aberdeen youth Choir. AVE sang several Scots songs and were directed by Brian Gunnee. 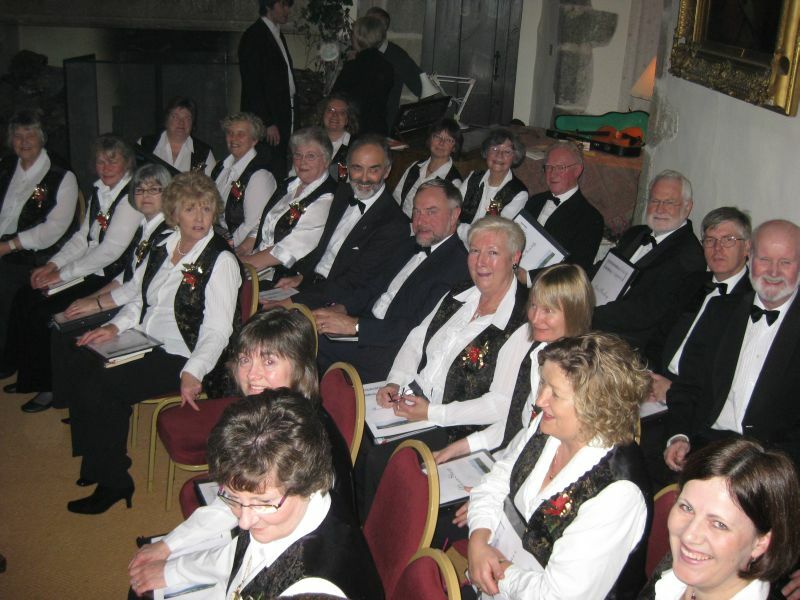 The Society sang three songs during the evening before joining with all the guests in the major work of the night, John Gardner's "A Burns Sequence". The Society and guests were accompanied by Bobby Howie on the piano. 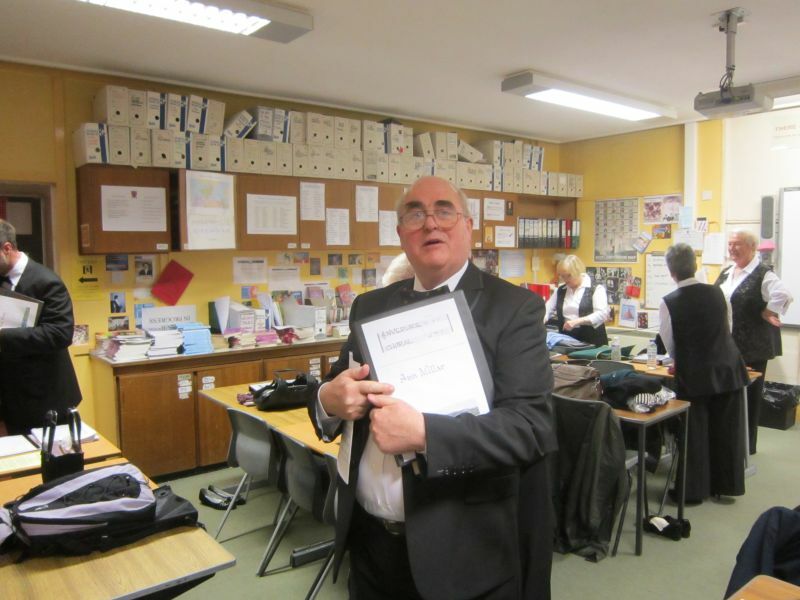 The evening was conducted by our Choral Director, John Hearne. As a surprise encore all parties joined in "sic a wife". It turned out to be the hardest piece of the evening but had everyone laughing by the end of it. Audience response was very good for the whole of the evening. One lady was heard to say "It wiz affy fine but wiz tae short. I could have listened to much mair." That is the spirit of Robbie Burns. Our Spring concert this year had a different theme. It was not a formal concert but an attempt to recreate the atmosphere of an early Victorian "Glee" Club. These singing clubs flourished in the 18th and 19th centuries and gave rise to the style of music which became the "glee" or part-song. 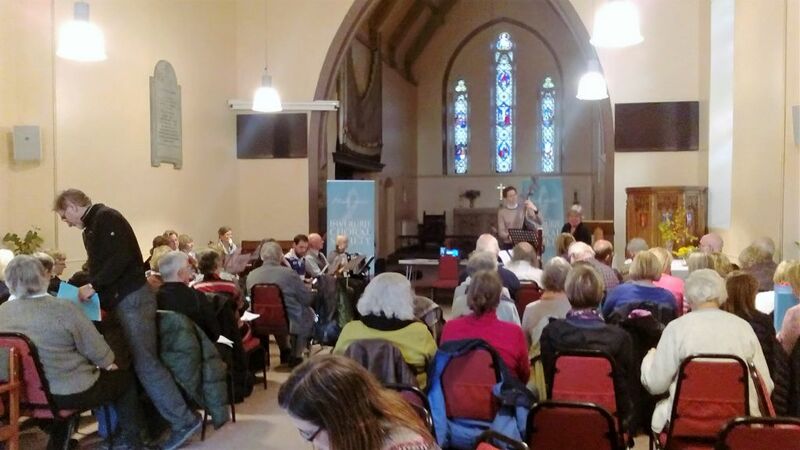 A full and varied programme was presented to those who came to listen at Kemnay Church Centre. 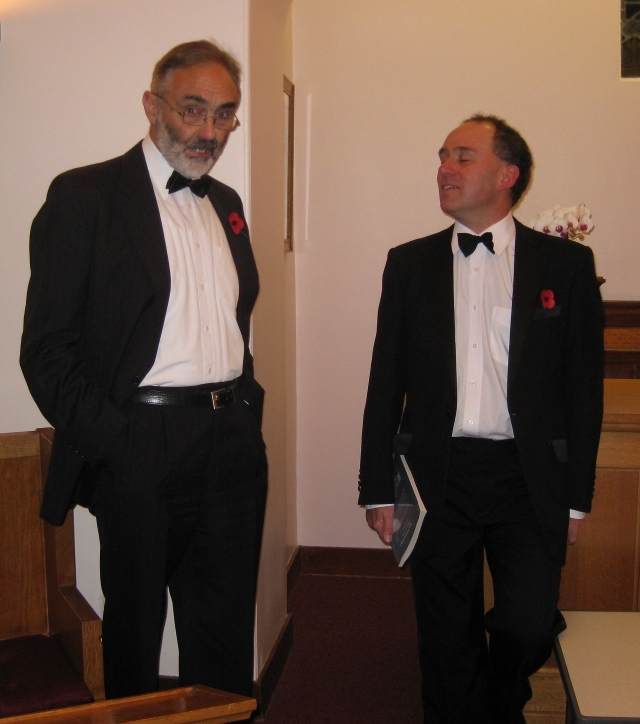 Sadly, Jamie MacDougall became ill with a nasty bout of flu and John Hearne, bravely stepped in to take Jamie's part of the concert, though the songs were changed/adjusted to John's Bass/Baritone voice. As members of the Choral know, we know John has a fine voice but the true professional singer was much in evidence when John sang his solo's. 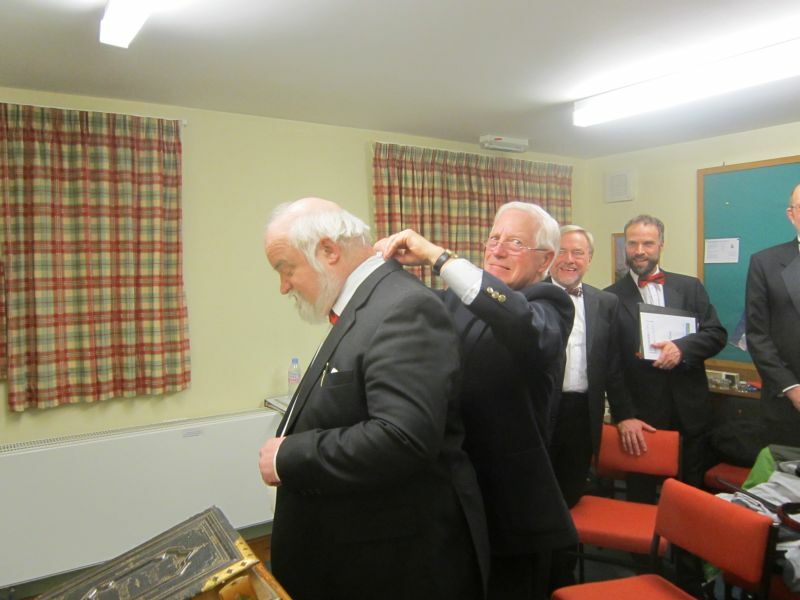 John was MC, conductor, soloist and page-turner to Bobby Howie. Who says he is not a man of many parts! Well done, John. All in a day's work. Colin Hunter gave several solo and accompanied performances on the clarinet, a melodious instrument played by a thoroughly good clarinetist. Though it was refreshing to see that even the soloists make the occasional mistake. Colin really blended in well with Bobby Howie who was playing the piano accompaniment. The Choral Society sang 10 "glee" songs. One had to smile as a certain member of the Bass Section during rehearsals, occasional forgot the repeats (It's alright, Mike, I won't mention your name) and was reminded by John H to treat them like the "buffers" on a railway line and go back to the beginning. Comments were made about going through the "buffers". Our penultimate song, "Ye spotted snakes" was just approaching the "buffers" when our Conductor decided that he was going to sing right through the buffers. By then, the Society had turned back to the beginning of the song and John H had a little solo until the rest of us realised what had happened, turned the page and caught him up. I know we over-ran time a bit. John H was honest enough to say at the end of that song that some-one had forgotten the repeats, to which all choral members pointed their fingers at our conductor. This truly was the spirit of a "Glee" club though in olden days I guess a round of drinks would have been bought on the strength of it. Refreshments were served at the end of the performance. Truly, different but nonetheless very enjoyable. Here's to the next one in costume. 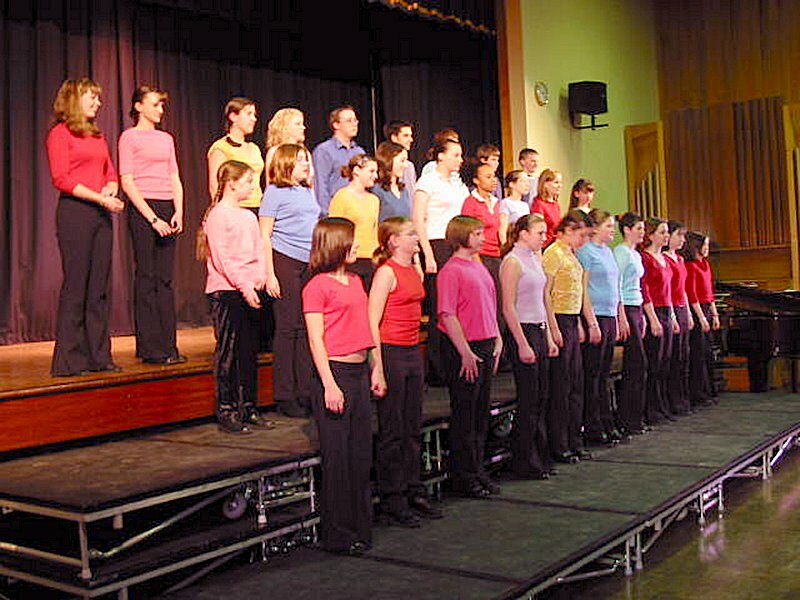 Aberdeenshire Singing Festival was held at Mackie Academy, Stonehaven on Saturday 9th March 2002. This year was a break from tradition insomuch that it didn't snow. The festival, typically involved a workshop in the afternoon plus rehearsals of the Combined Choirs for the evening performance. We were delighted to have Michael Brewer back again as our guest conductor and to say his workshop was slightly unorthodox is possibly an understatement of the word. However, those of us who have been at his previous workshop had an idea of what to expect but his technique came as a shock to some choir members! It was a very good workout in the afternoon and it was obvious that someone as talented as Michael knew exactly what he wanted, how he wanted it and when he wanted it but not necessarily in that order. Mackie Academy staff provided an excellent tea for those who had travelled a distance. 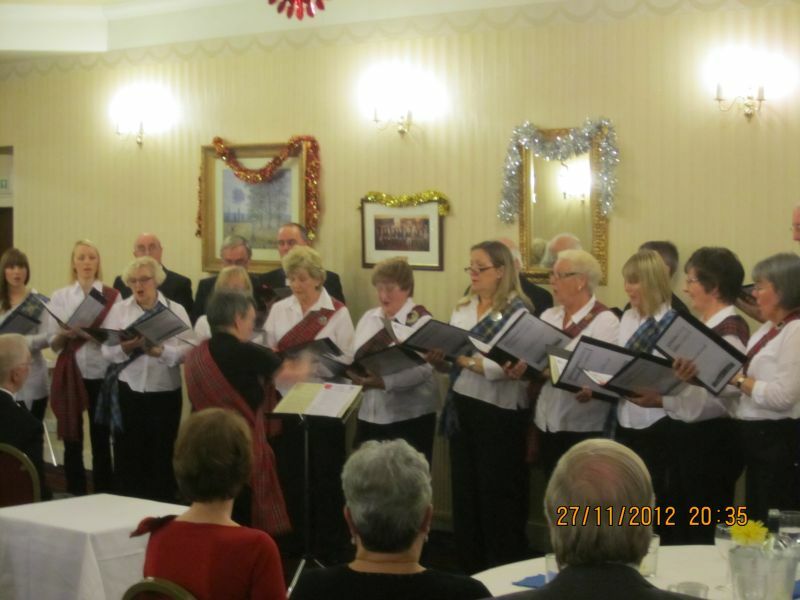 The evening started with Aberdeen Orpheus Choir and the choral section finished with The Stonehaven Chorus. I am not going to go into the programmes of each individual choirs with the exception of "Frantically Keen" because if you weren't there to hear it then that that was your loss. Thanks to "Frantically Keen" who came from the Edinburgh area to guest in our singing festival. Come along and support it next year in Deeside. The programme finished with the combined choirs under the leadership of Mike Brewer with John Hearne's arrangement of Bizet's "The March of the Three Kings" and the finale "Mangwani M'pulele", Michael Brewer's arrangement of a traditional Zulu folk song. During the evening, I was able to take photograph's of all the participants of the festival. I decided not to use "flash" so I didn't disrupt the proceedings. There is a slight penalty to pay for that as the green flood lights seemed to be the dominant lighting. If any Societies or choirs wish to use the picture of their choir from the following montage then I am happy for you to do that. Thanks to everyone who was involved in the setting up of the festival. You are too numerous to mention. I think the beauty of the Aberdeenshire Singing Festival is that it is not competitive and we are singing for each other. Happy singing. 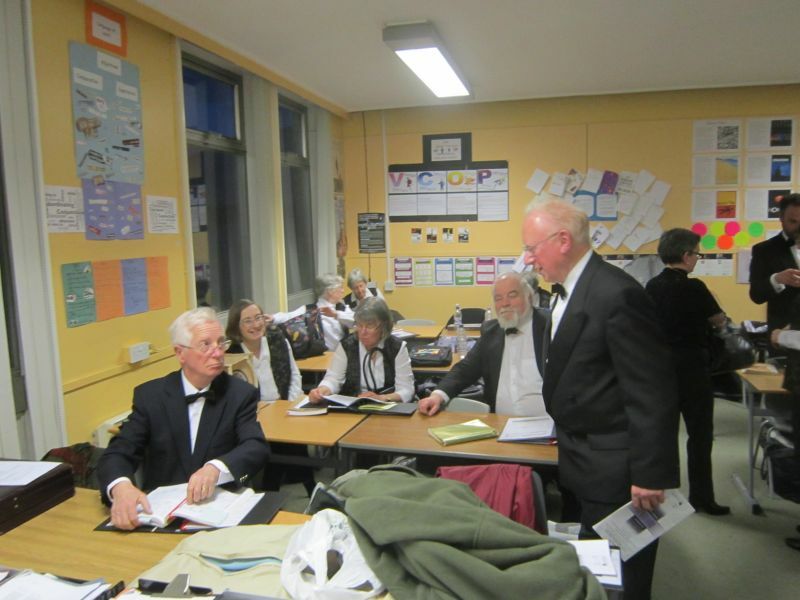 Well done to John B, Alan, Mike, Ron, (Bass Section) and Sylvia and John W, (Tenor Section) who represented us at the IYF for "Serenade to Music". We were delighted to be invited to take part in the Aberdeen International Youth Festival's "A World of Song" on Sunday 5th August 2001. The finale of the evening was a performance of Vaughan William's "Serenade to Music" combining the performing choirs with the Tenor and Bass Sections members of the Stonehaven Chorus and ourselves. The music was provided by the Vancouver Youth Symphony Orchestra and for many this was the first time "Serenade" was sung with an orchestra not a piano - and very different it was. The Aberdeen Youth Choir, the NHK Tokyo Broadcasting Children's Choir and Stord Ungdomskar provided the other voices. 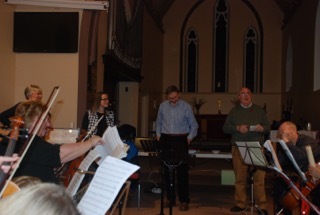 A shock was provided by John Hearne at a mini rehearsal when he invited us to sing the solo parts (I think we acquitted ourselves well there but then I am biased!). 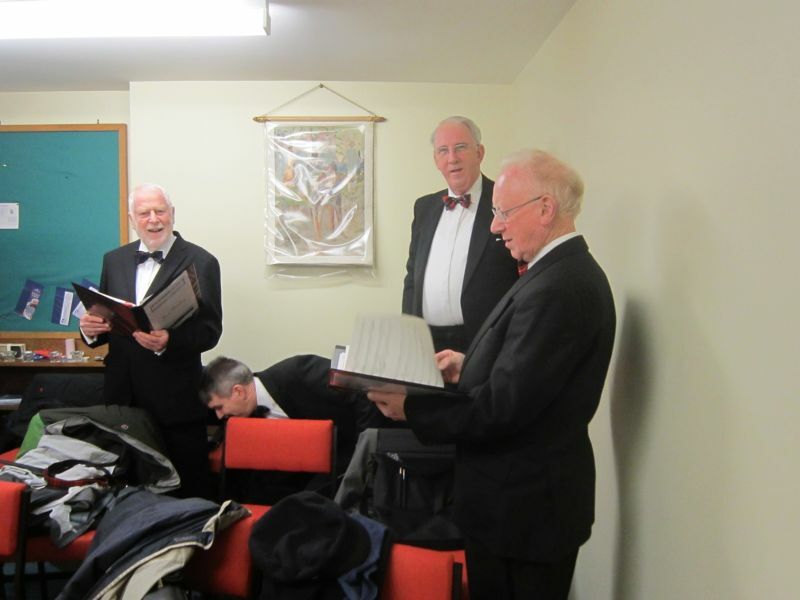 Luckily, John joined us for the performance and provided welcome assistance to the basses though I must say we didn't have that in the Tenors and had to stand on our own feet - but the Tenor section is used to that I guess. Talking to the some of the audience afterwards, they said that it was one of the best "Serenades" that they had heard and I quote "moving and with passion". Ben Parry did a wonderful job of conducting the ensemble which must have totalled over 150 performers if you include the orchestra. It was a performance not to be missed and if you did miss it, well you certainly missed a great evening. Summer Concert 2001 - "Sangs o' Simmer"
The Chapel of Garioch was, again, an ideal setting for the Summer Concert. An enthusiastic audience was treated to a variety of music for a Summer Evening. The concert opened with Ralph Vaughan Williams "Serenade to Music". 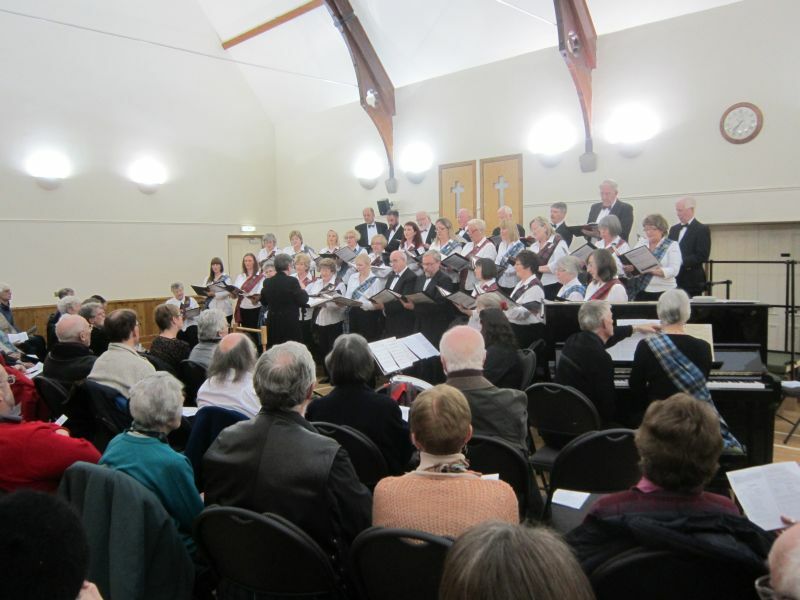 The principal solo parts were sung by our guests, baritone Alan Watt, who we welcomed back again this year and soprano, Wilma MacDougall with her debut with the Choral Society. Mariko North played the solo violin and the work was accompanied by Christopher Nickol on the organ. This piece, to me, is a beautiful piece of music and we were lucky to have such finely talented guest musicians. Alan Watt then sang Finzi's "Fear No More the Heat o' the Sun" followed by Westhill Music Studio Singers (directed by Morag Simpson) unusual but moving rendering of Rutter's "For the Beauty of the Earth". Either side of the Choral Society's trilogy of "Weep, O mine Eyes, Hide Not Thou Thy Face from Us, O Lord and Call to Remembrance, O Lord", Chris Nickol gave a stirring rendering of John Stanley's "Voluntary in D minor" and two pieces from Herbert Howells. Luckily the power was with us the night of the concert as during the afternoon's rehearsal, power was lost to the pump for the Organ resulting in some unusual sounds and some hurried resetting of fuses!! Wilma MacDougall then gave a superb rendering of Roger Quilter's June. A remarkable voice which has balance and clarity in her upper voice range. The finale of the evening was the commission to John Hearne by Gordon Forum for the Arts of "The Ben". Text written by Willian Imray (Bill Brown) and the piece set to music by John Hearne. A very interesting piece which involved all performers. It was sung in Doric (the local dialect of the North East of Scotland) and followed the history of our local mountain "Bennachie". The text has a time span of millions of years. From the birth of the mountain, through human sacrifice, the monastery of Monymusk to present time and into the future, the five piece cantata covered it all. Copies of the text were made available to the audience with a modern day translation of some of the more obscure Doric words. It is very difficult to give an overall view of the performance of "The Ben". There was so much going on and coming from all directions. 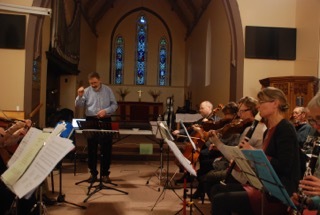 All who were involved in the presentation of John Hearne's composition gave their best and I believe the audience went away having listened to an original piece of music. Personally, I can say it was not the easiest of works that I have sung but it certainly was a challenge and we all know John enjoys a challenge or three. I hope we did credit to both John and Bill. I haven't given much mention to Mariko North who played the solo violin beautifully. Mariko is a pupil at Inverurie Academy and is a member of the National Youth Orchestra of Scotland. 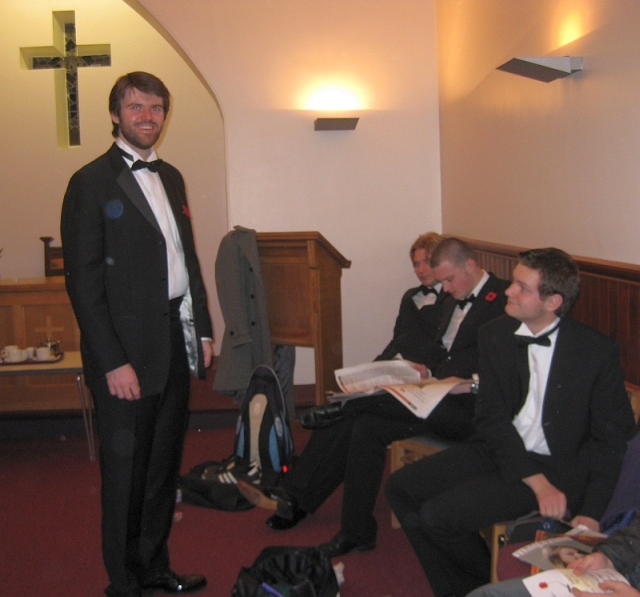 Thanks also to Drew Tulloch who accompanied us and the soloists on the piano. Overall, a thoroughly entertaining evening, enjoyed by both participants and audience alike. 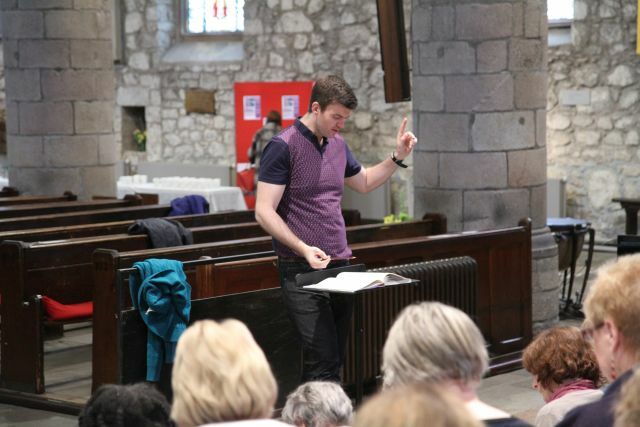 This year's Aberdeenshire Choral festival was held again in Inverurie with guest conductor was Ben Parry. 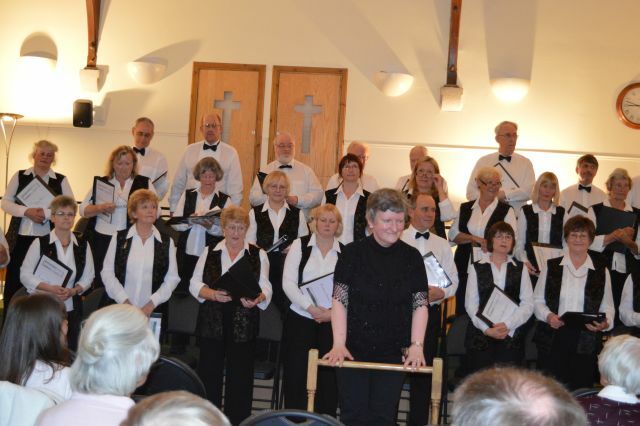 10 choirs/choral societies/music societies took part. There was a workshop in the afternoon and a performance in the evening. Each participating society performed a short section of their own works in the evening followed by a combined performance of all societies. 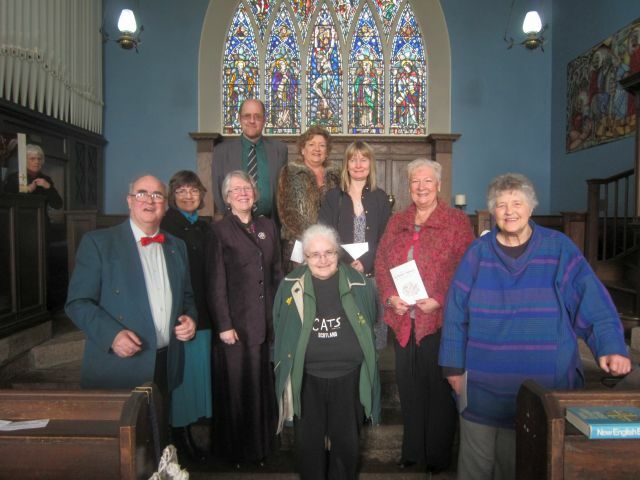 "The Gordon Gaelic Choir were first, with Thairis air a'ghleann and Tillidh mi, both of which were very enjoyable despite not knowing what they were singing. 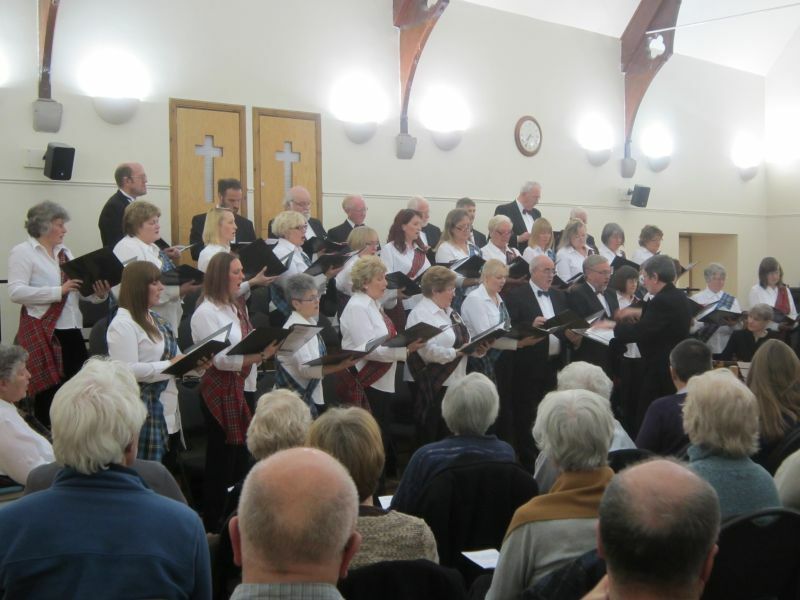 Peterhead Choral Society were next, with Ave Verum Corpus (Mozart), Golden Cornfields, and Ave Verum Corpus (Elgar). They managed to squeeze an extra piece in too which wasn't on the programme. Both these choirs left immediately after singing, in the hope of reaching home without being caught in a snowdrift. True to tradition we had snow of course. The Banchory Youth Singers were next - a small group of very talented singers and wonderful to listen too. I remember thinking the same last time. They sang The Old Ark's A-moverin', Bourree for Bach, Hashivenu, and Aquarius. Inverurie Choral Society were next with There's a Light Upon the Mountains, Chanticleer and believe it or not, I can't remember what we replaced Weep, O Mine Eyes with! The first half finished with the Granite City Chorus, a male barbershop group of eight, singing When You're Smiling, The Old Piano Roll Blues, and Scotland Again. They were fun to listen to and looked great in their white shirts and tartan waistcoats. At the interval I was asked by one of the Stonehaven Chorus if I would take photos of everyone in the second half with his digital camera, so my attention was taken up trying to use this gadget. Aberdeen Orpheus Choir sang The Merry Widow Waltz and The Willow Tree, both sang beautifully by this large choir. The Garioch Youth Musical society then sang Telephone Hour and One Voice, the first piece like a giant phone conversation with each person having a line or two to sing over his or her mobile phone. It was very well done and the audience loved it. The youngsters cheered and whistled after every other choir sang - they were very enthusiastic. The Banchory Singers sang Mice and Men, Laura, and Getting to Know You. 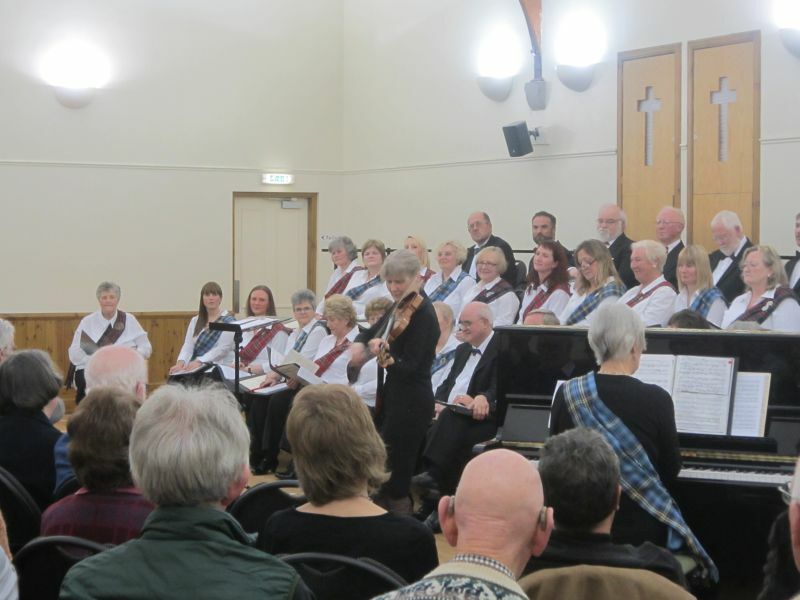 The Stonehaven Chorus then followed the Venite Adoremus, Ships in the Haven (Icelandic of course) and The Seagull. It was fascinating to hear what The Seagull sounds like from the other side of the fence. They have this piece down to a fine art. Castle Country Chorus sang The Longest Time, Mood Indigo, and Thank You for the Music. The Massed Choirs finale was really wonderful to be part of and Ben encouraged us the whole way. It wasn't quite so crowded as it was in the afternoon, as two of the choirs had already gone home, but what power there is in numbers. 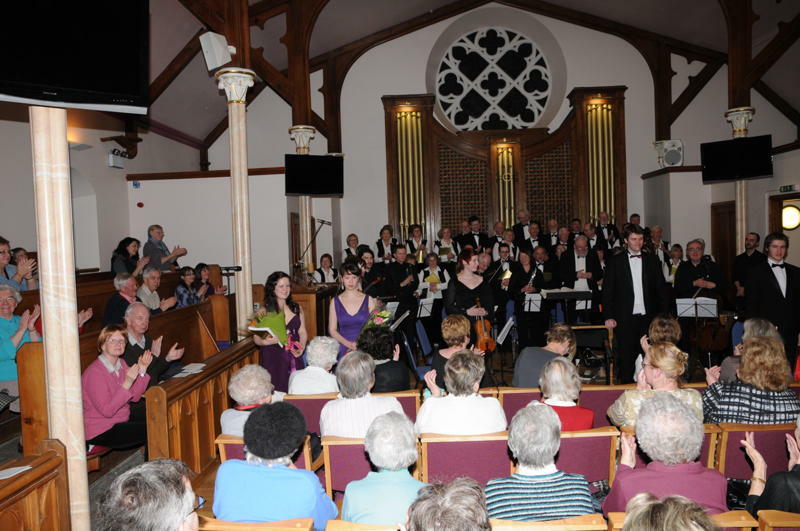 It was a great concert with all age groups represented and a wide range of different styles of music represented." Next Year, Stonehaven here we come? The Sankta Lucia quartet comprising of Lauren Hart (Sankta Lucia), Christina Beange (Staffan), Callum Merson (Baker boy) and Scott Faskin (Chimney Sweep). 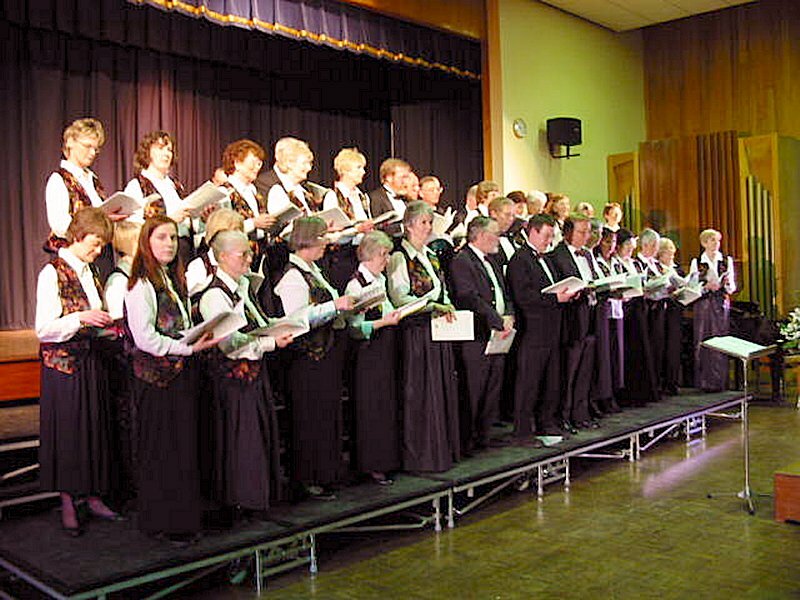 The Christmas Concert 2000 was held at Inverurie Academy on the 13th December 2000 (Sankta Lucia's Day). The weather was much better than previous years and that was reflected by a larger audience. Donald Hawksworth was our accompanist and his improvisation between the Gloucester Wassail Carol (and the encore) was a pleasure to hear. John Hearne was seen to smile at the Society several times during the concert. Was that because you were content with our performance or did you want us to beam at the audience! 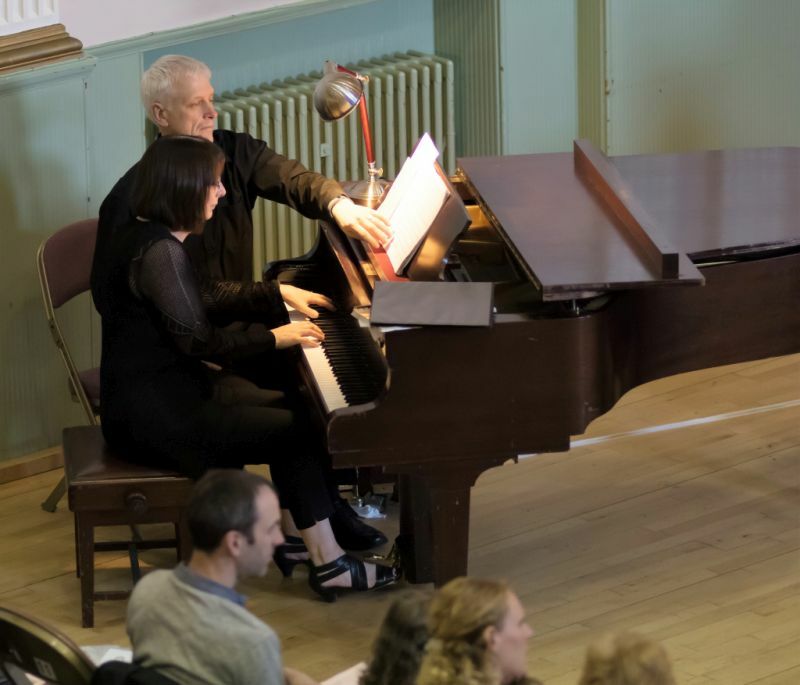 We held a very successful Spring Concert in the idyllic setting of The Chapel of Garioch, despite Aberdeen being the wettest place in the U.K. that day. "Choir strikes gold in chapel" commented Alan Cooper's review in the Press & Journal on the 29th May 2000. The smooth singing of guest baritone Alan Watt (Baritone) was the centre of a well attended and enjoyable sequence of musical pieces. The major piece was "Five Mystical Songs" by Vaughan Williams, with two of Grieg's "Four Psalms" with a series of secular songs from Scotland and France. 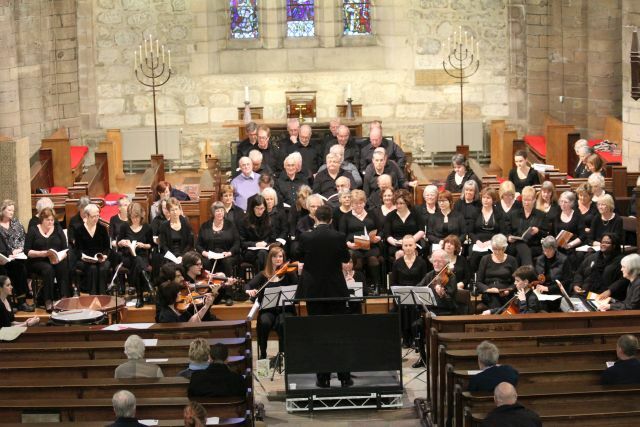 This festival was held at Fraserburgh this year and despite heavy snow, six choral/music societies attended the festival. 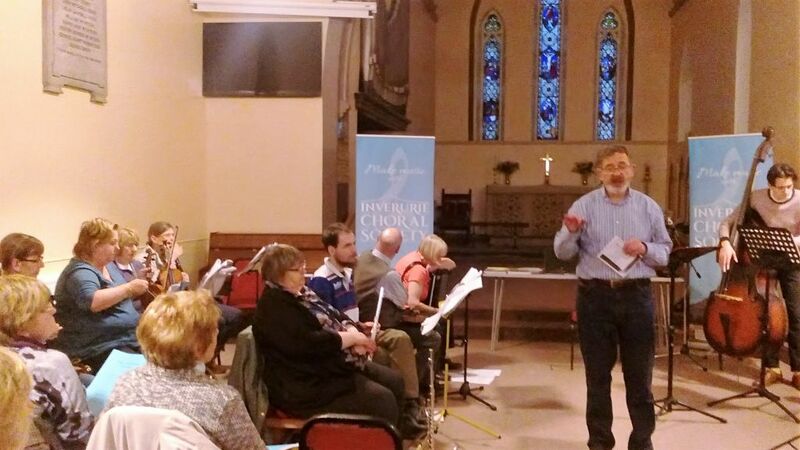 The festival consisted of a workshop led by guest conductor, John Currie. 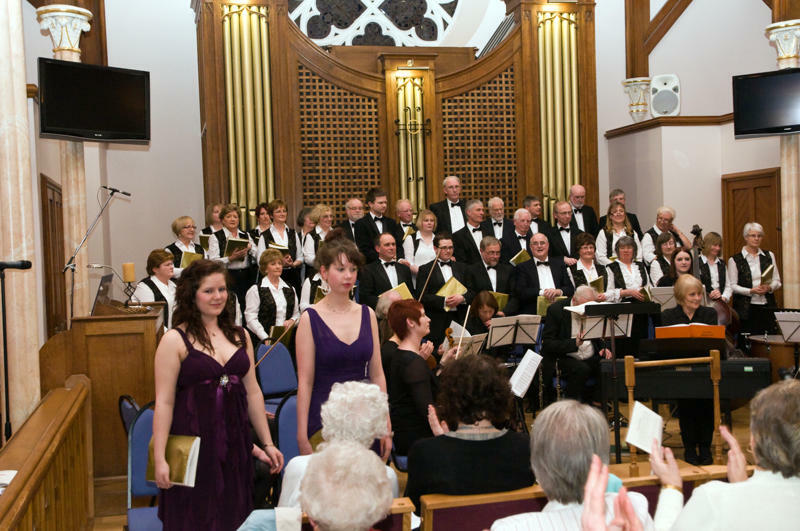 In the evening each participating Society presented its own selection and then all 150 singers joined together to sing two excerpts from the Messiah and two of Rabbie Burn's poems set to music conducted by John Currie. Members of the Society at Fraserburgh. Inverurie Academy, 18th December 1999. Our third concert, "Sing Noel" was held in atrocious weather conditions at Inverurie Academy again. 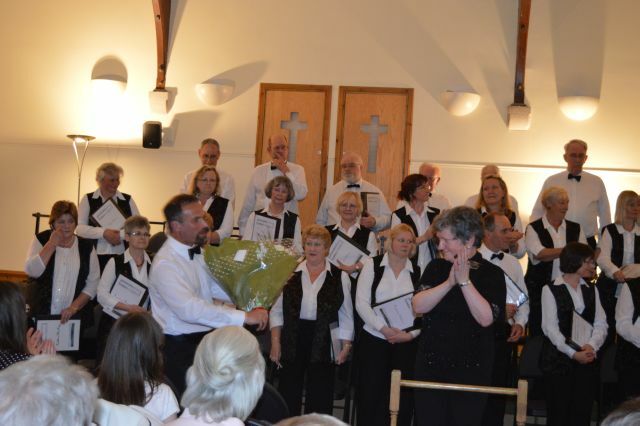 This year, John Hearne decided that audience participation was the key for the concert and the audience were invited to sing along with the choir. Most memorable was the finale with a version of "The Twelve Days of Christmas" where everyone in the hall gave a 110% effort. Inverurie Academy, 12th June 1999. 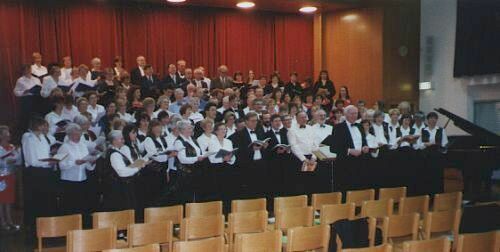 Our summer concert 1999 was held in Inverurie Academy. 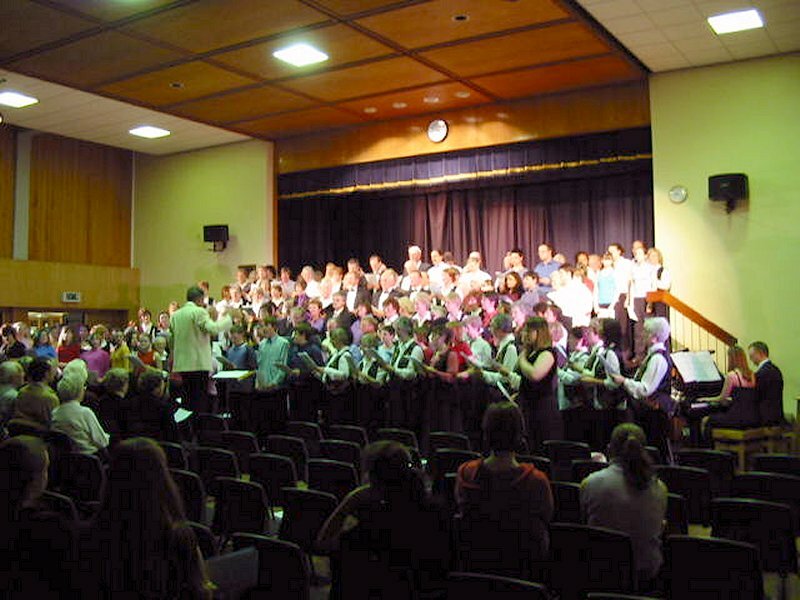 The theme for this year's summer concert was "Music for a Summer Evening". A selection of pieces were sung which included Holst's "Pslam 86", Honegger's "Pastoral d'ete", John Hearne's arrangement of "Summer Nights in the Fjords" (the Society's first attempt at singing in Icelandic!) and Elgar's "Scenes from the Bavarian Highlands". 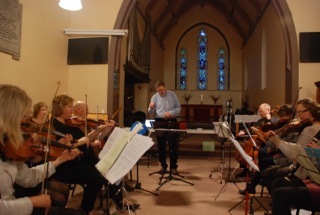 The guest soloist was Gordon Jack (Baritone) and the Aberdeen Sinfonietta accompanied the performance. This was the first "real" concert given by the Society. 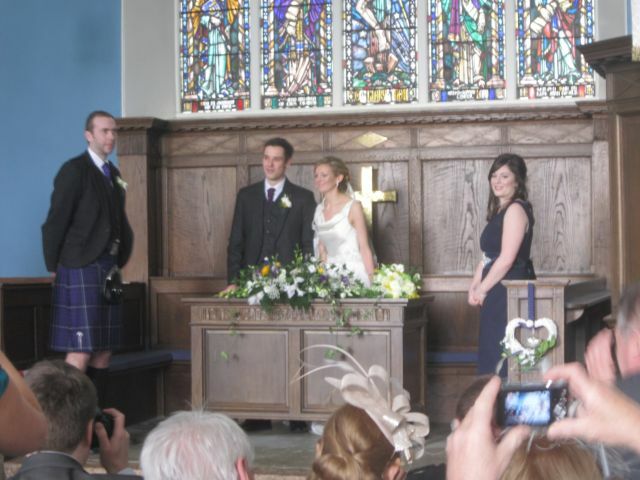 It took place at Inverurie Academy on 19th December 1998. Most of the music came from the Americas but there was also music from Europe and the British Isles. The concert was built around six pieces from South America which told the Christmas story "Navidad Nuestra". The concert opened with "Heilige Nacht" and during the concert, the Huron Carol from Canada, two traditional Spirituals and a Scottish Carol. 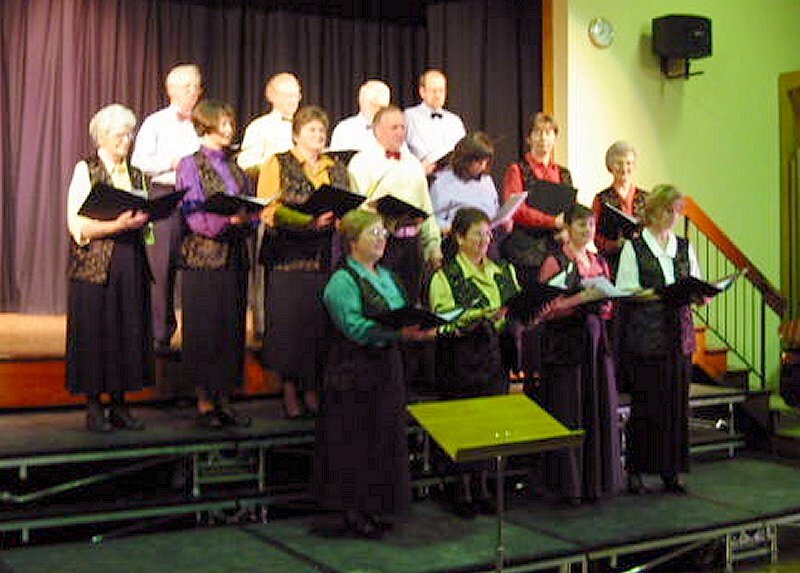 The audience were invited to sing some traditional carols. There were splendid solos from guest artiste Gillian Taylor (whose Mum sang with the Society) and solo from David Bracegirdle on the Guitar. Mince pies and a non-alcoholic punch was provided to all at the end of the concert and a collection was taken for the Central American Disaster Fund.